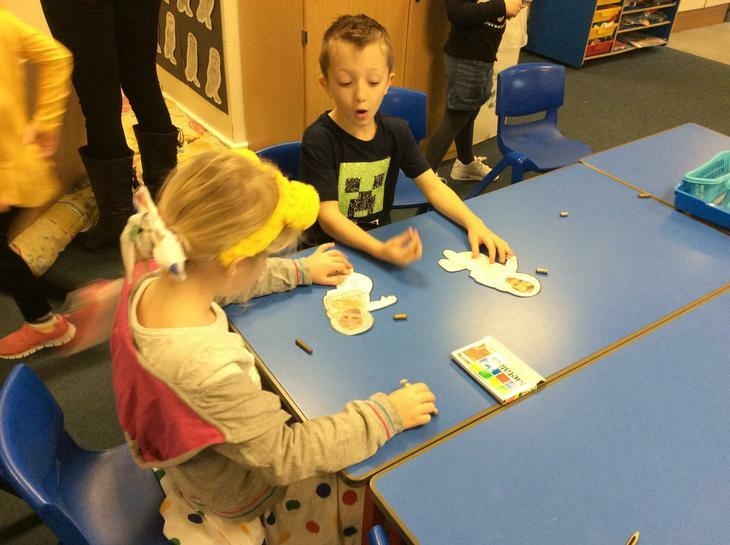 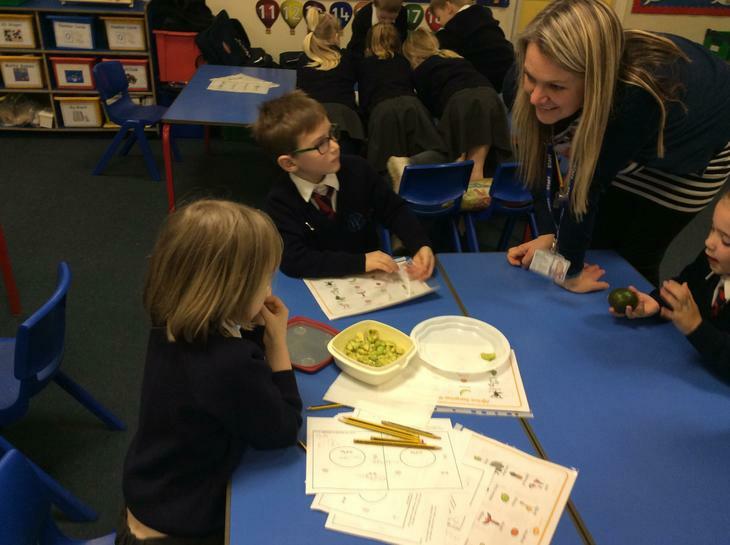 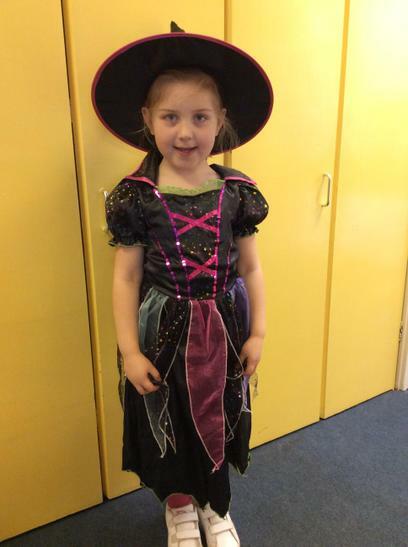 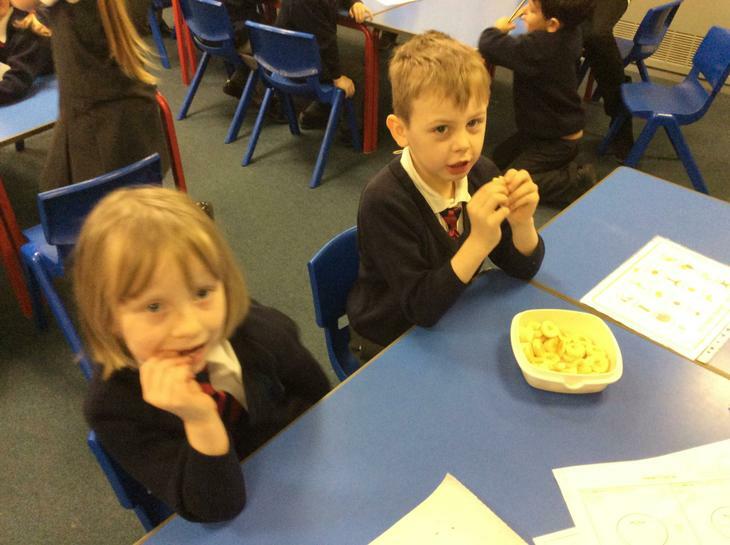 Our teachers are Mrs Crawshaw (Monday and Tuesday) and Mrs Axton (Wednesday, Thursday and Friday). 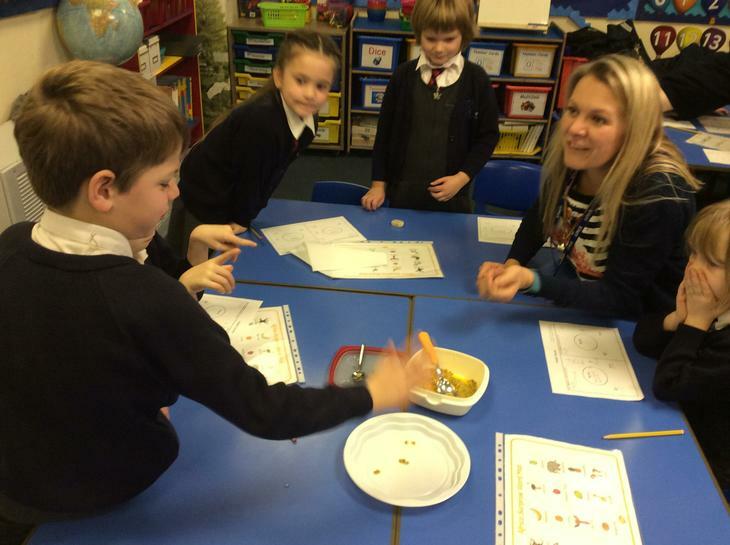 We also have Mrs McCarthy, Mrs Michael and Mrs Horwood helping us in our classroom. 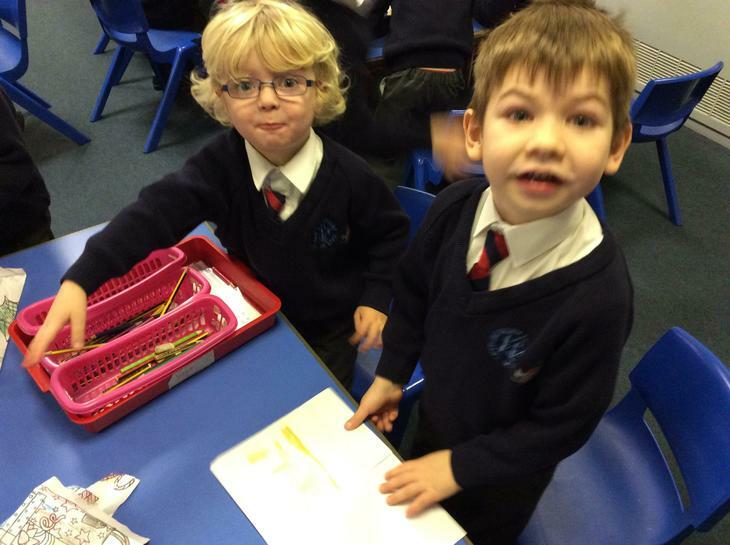 We are really looking forward to a year full of fun and learning. 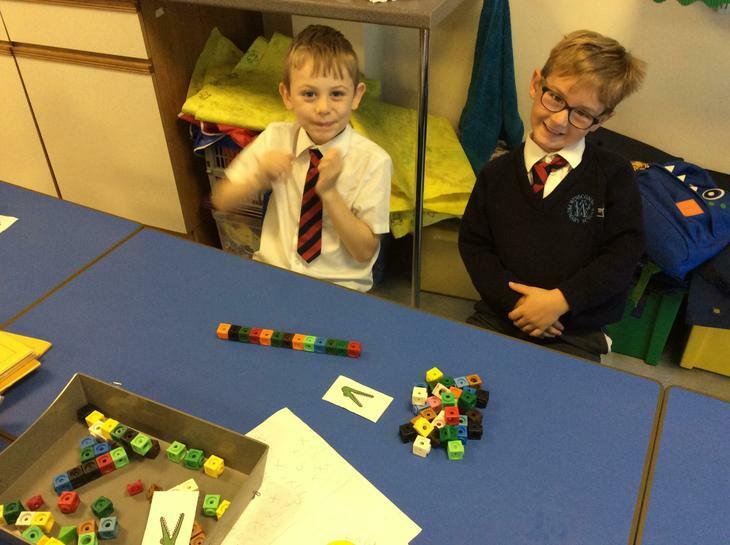 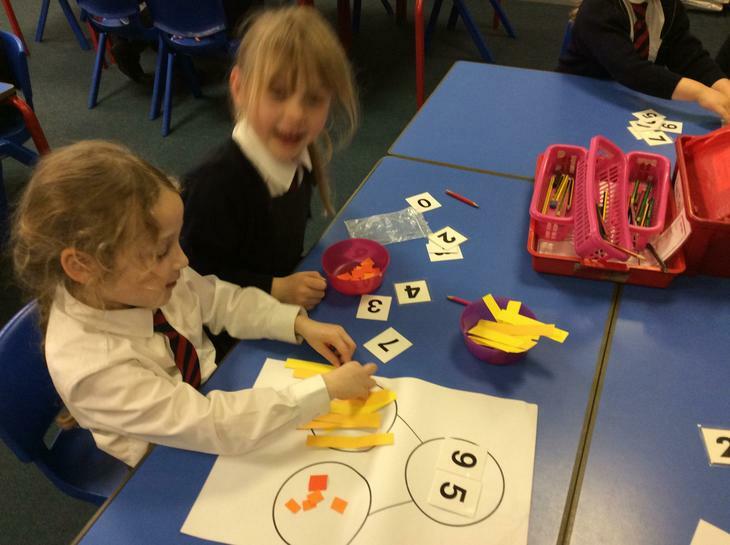 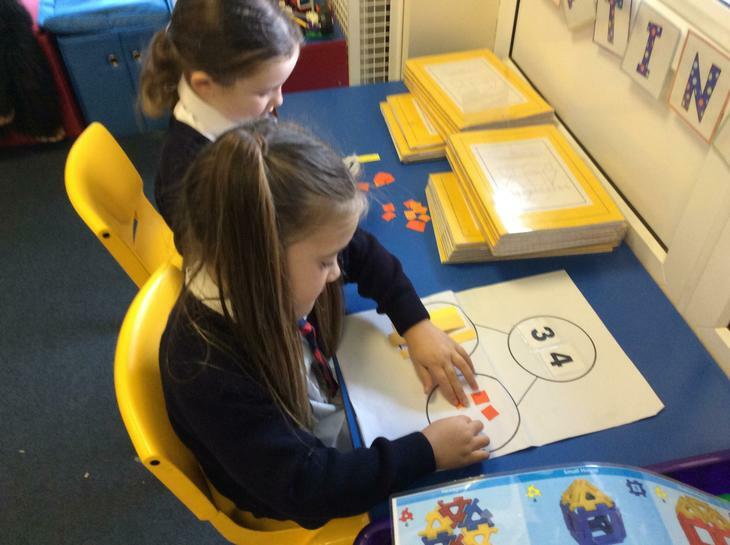 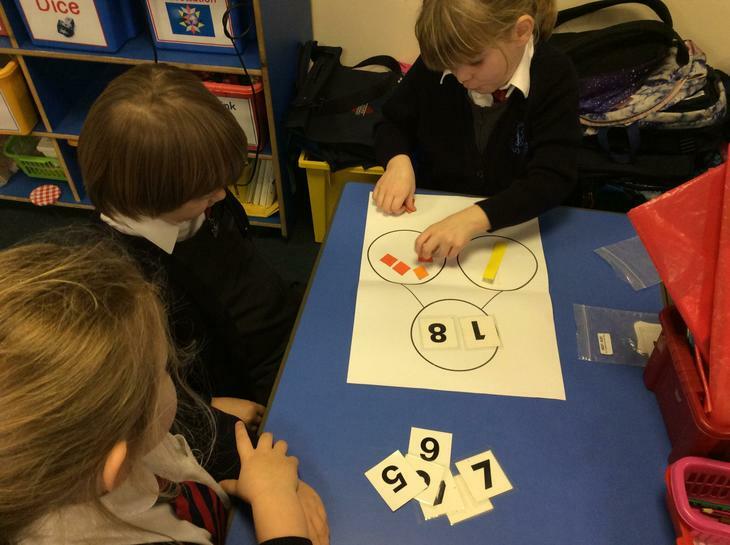 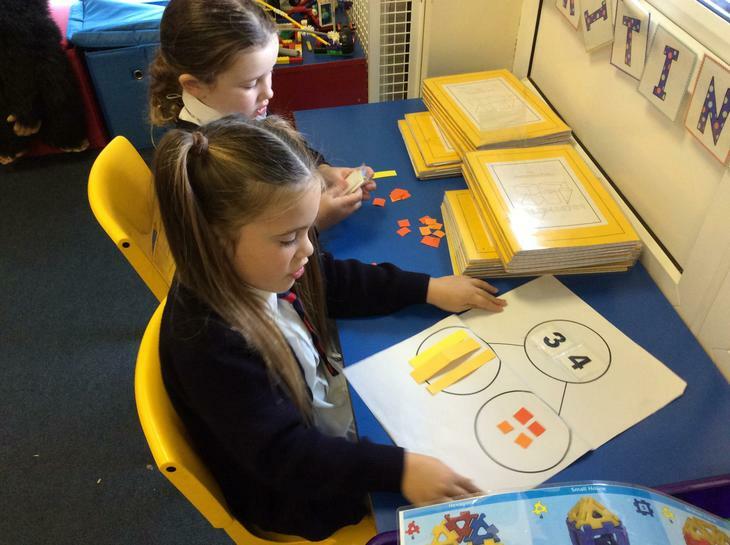 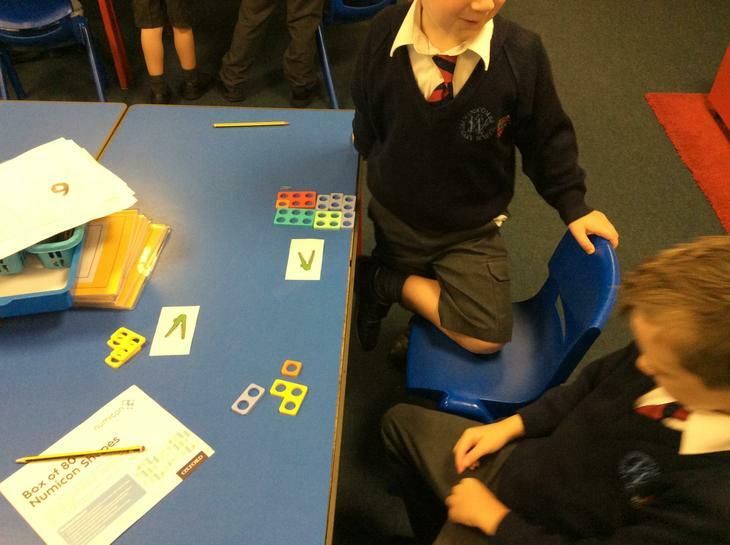 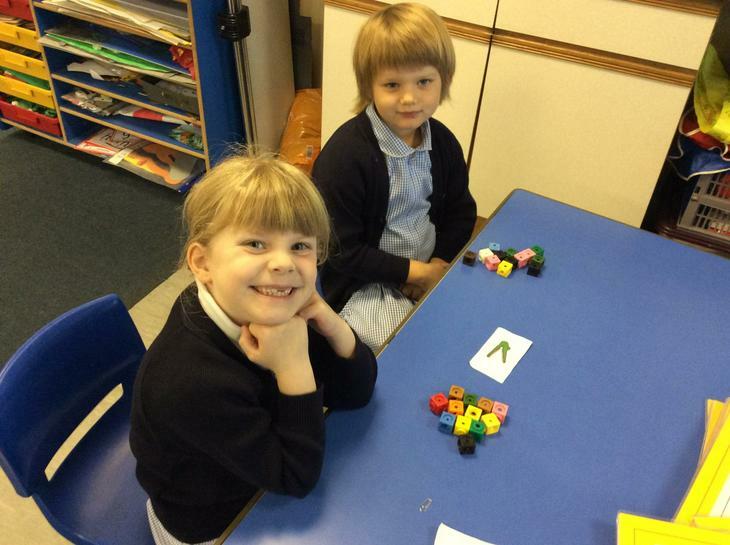 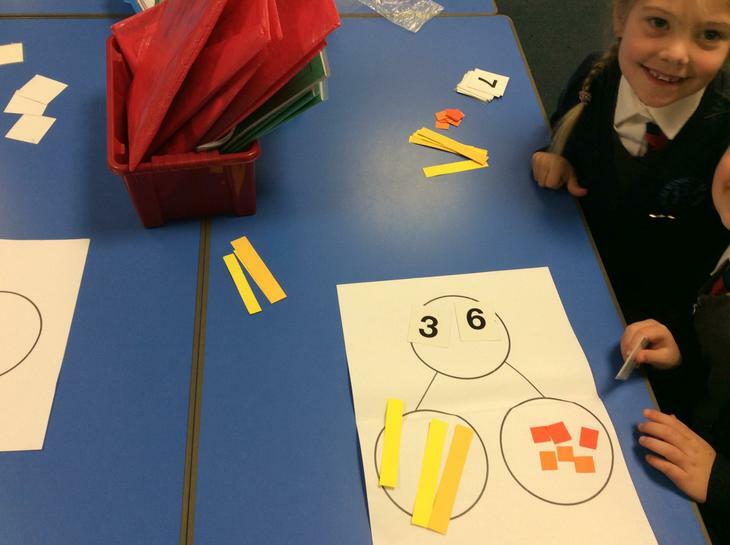 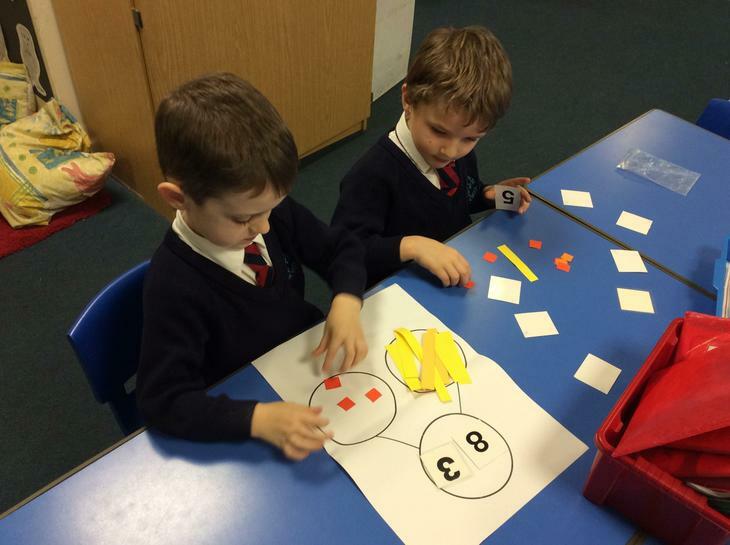 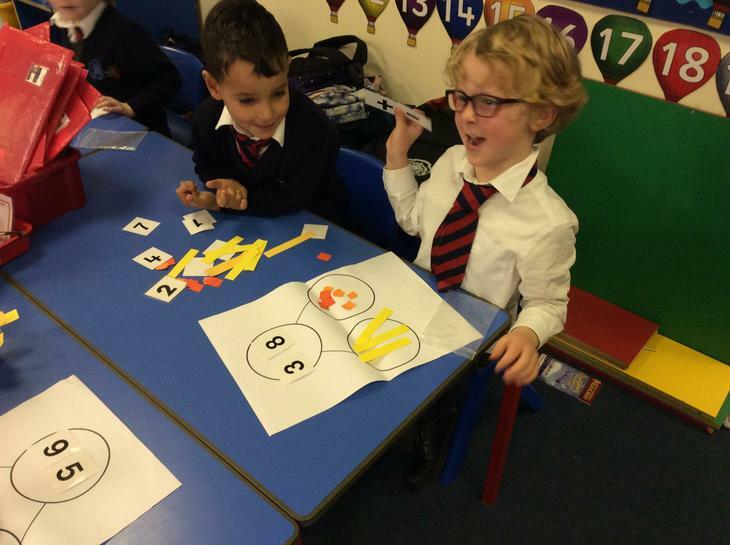 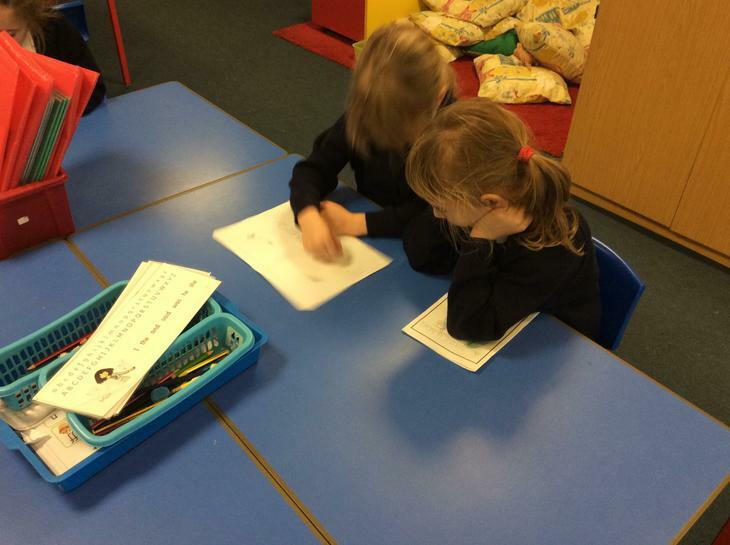 We have been using some maths games to help secure our maths skills. 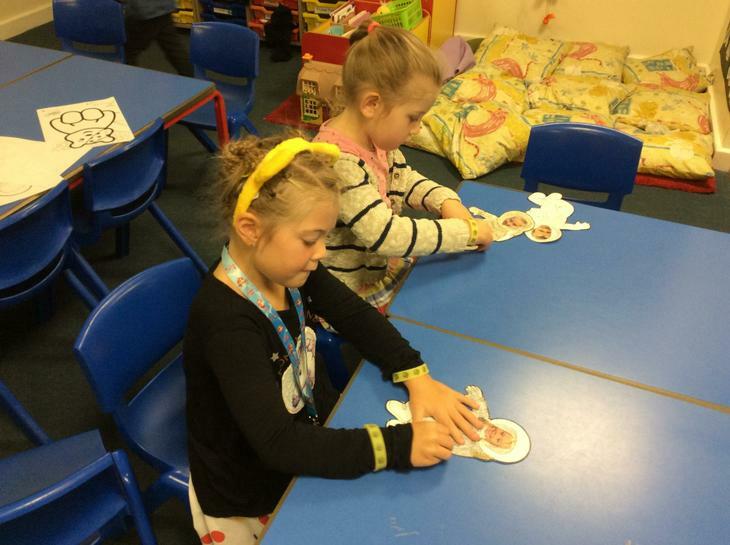 These games can be found at www.ictgames.com if your child would like to play them at home. 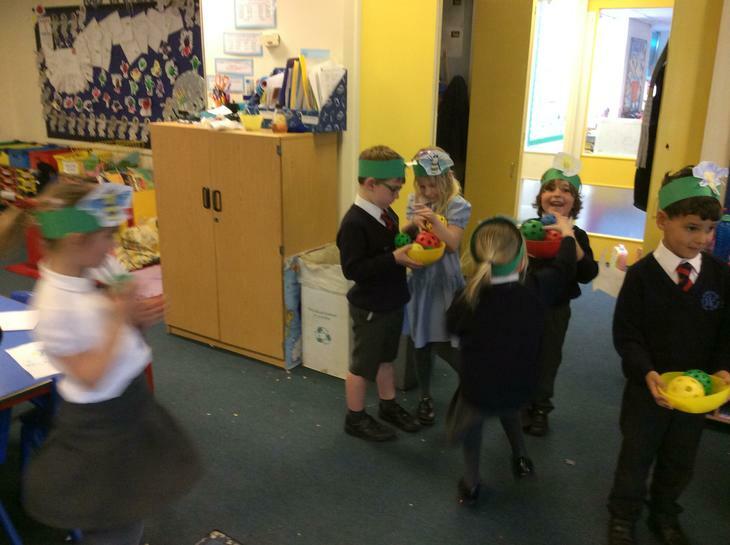 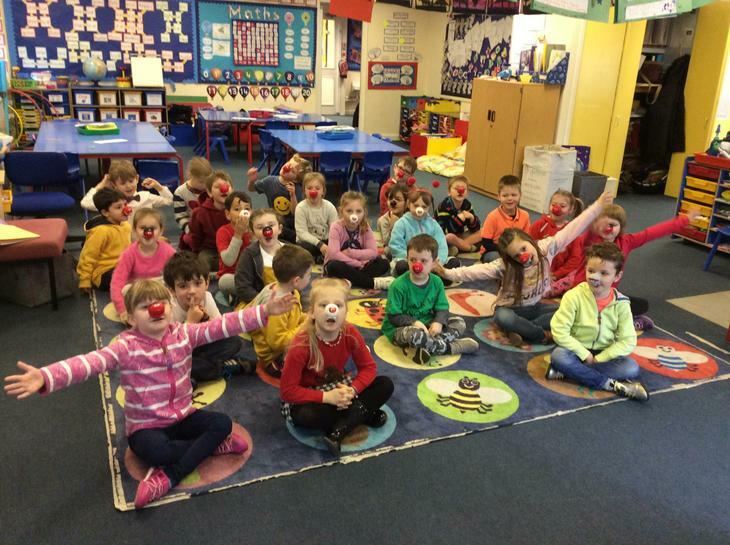 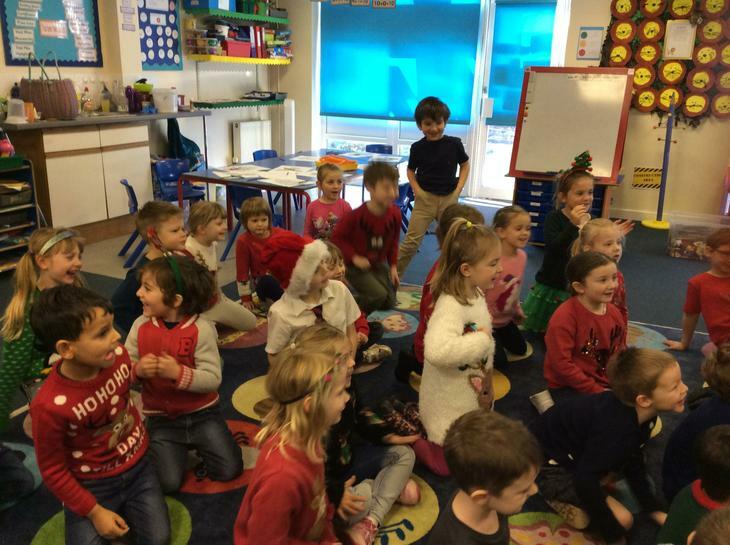 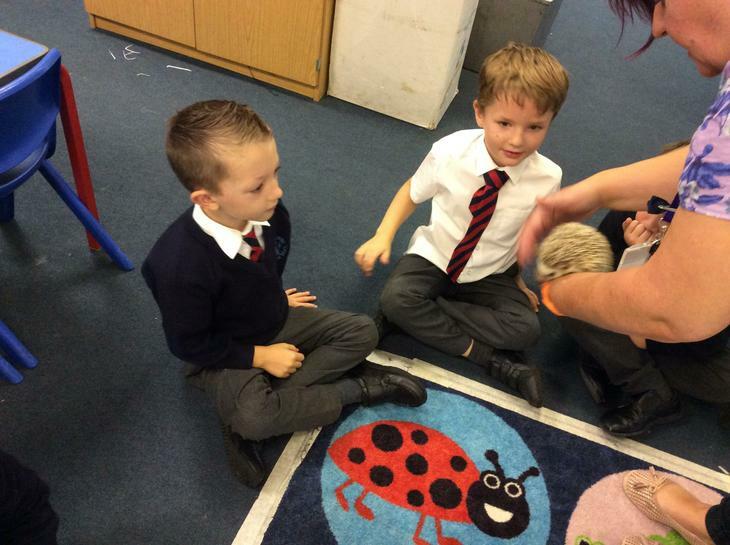 The children have particularly enjoyed playing Counting Caterpillar, Save the Whale and Fact Fighter. 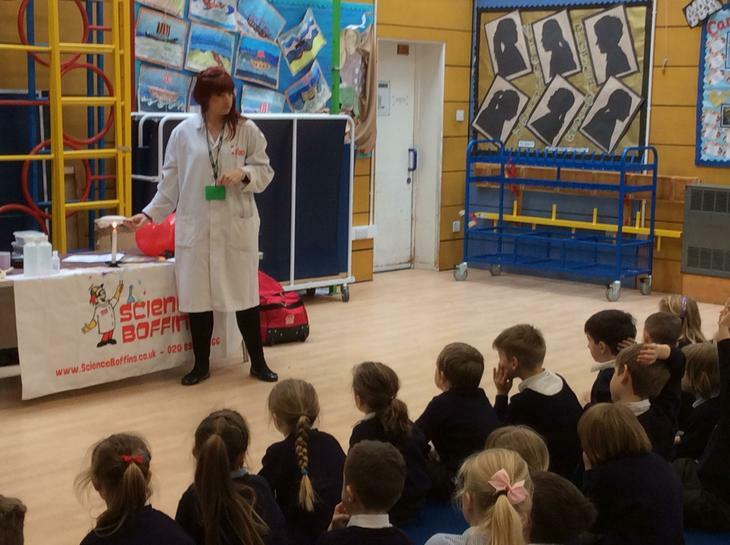 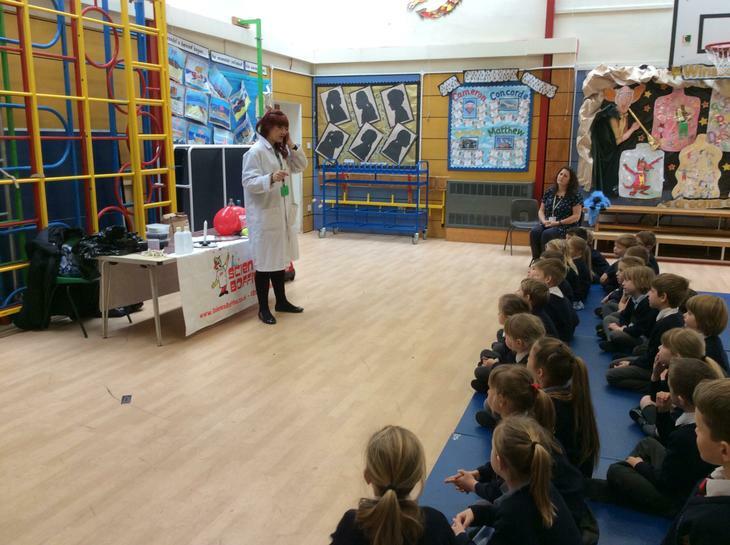 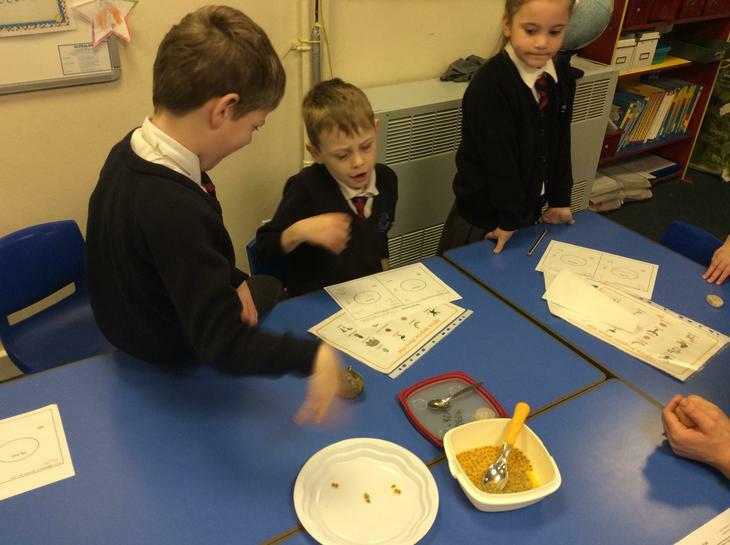 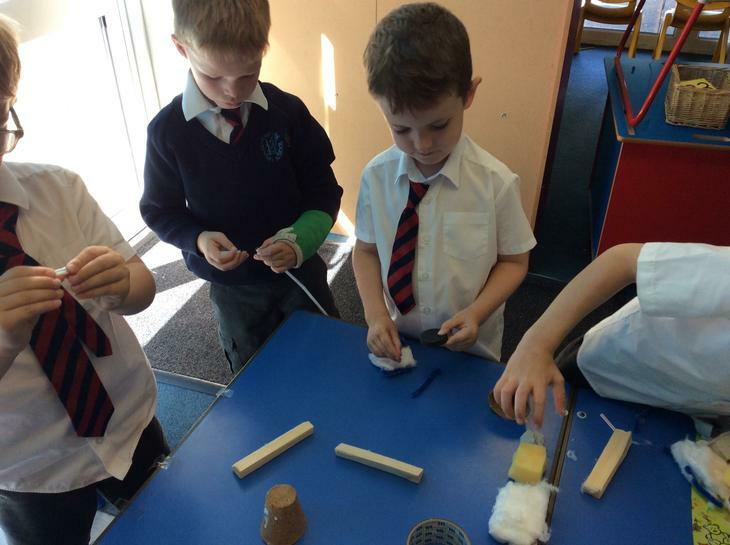 We really enjoyed our Science Day. 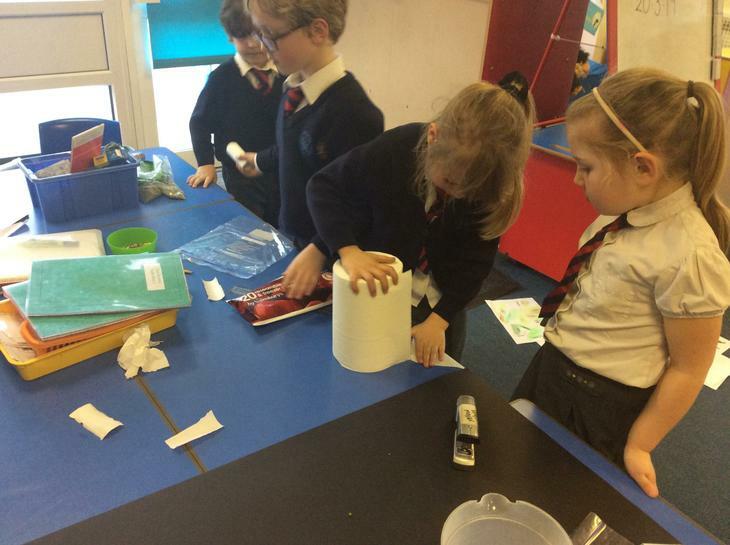 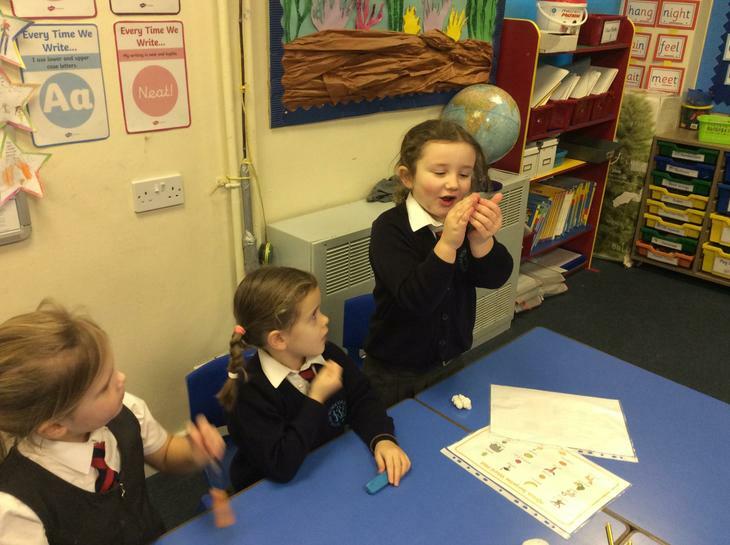 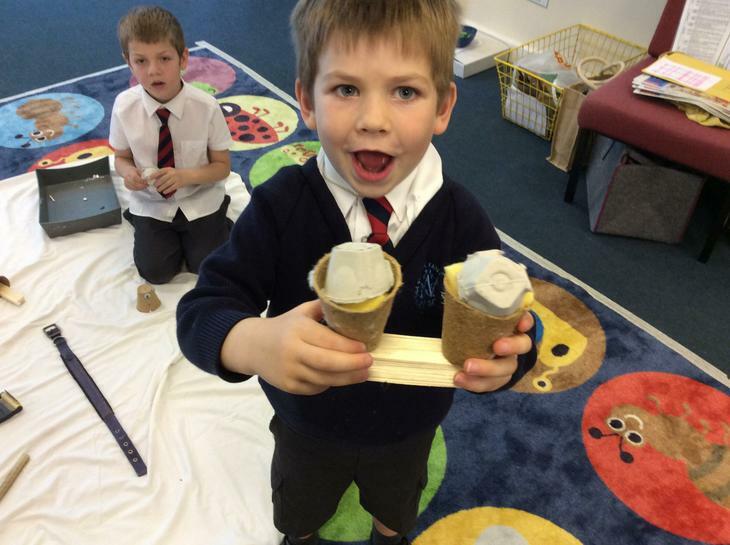 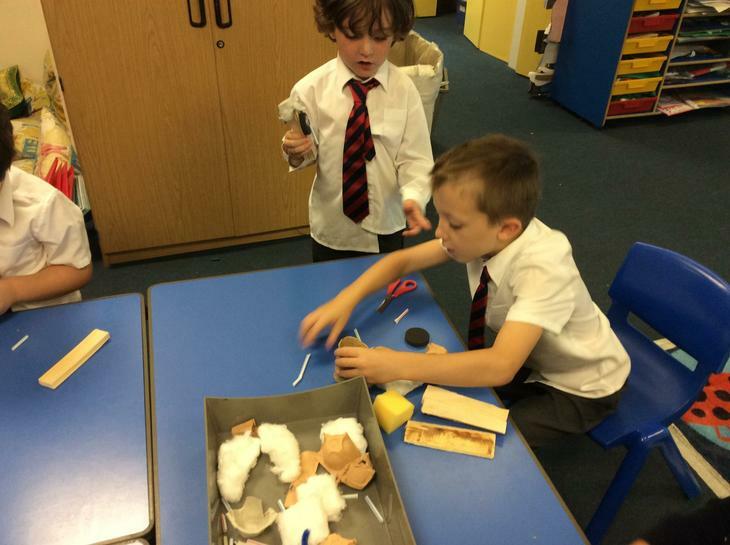 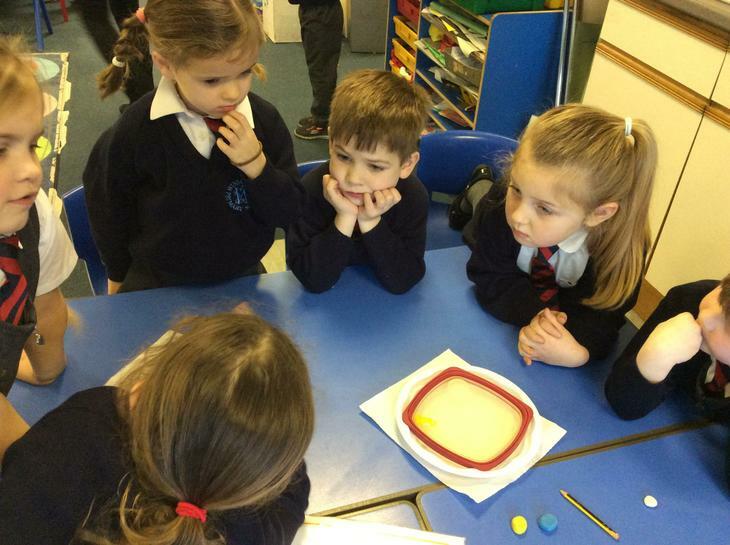 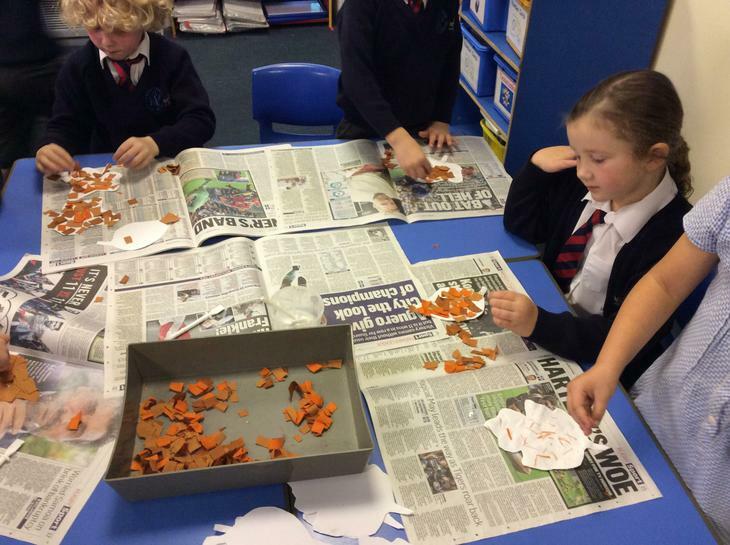 We were thinking about journeys and learnt about the solar system in our Science Workshop. 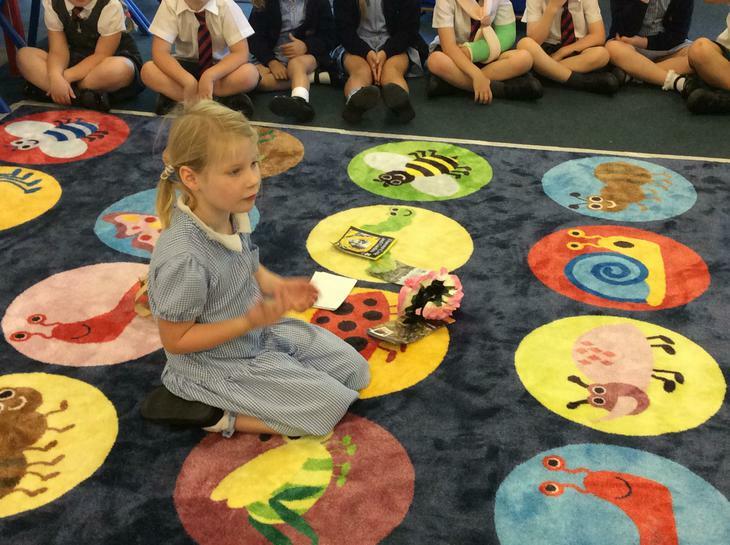 Then we learnt about the journey of a bee. 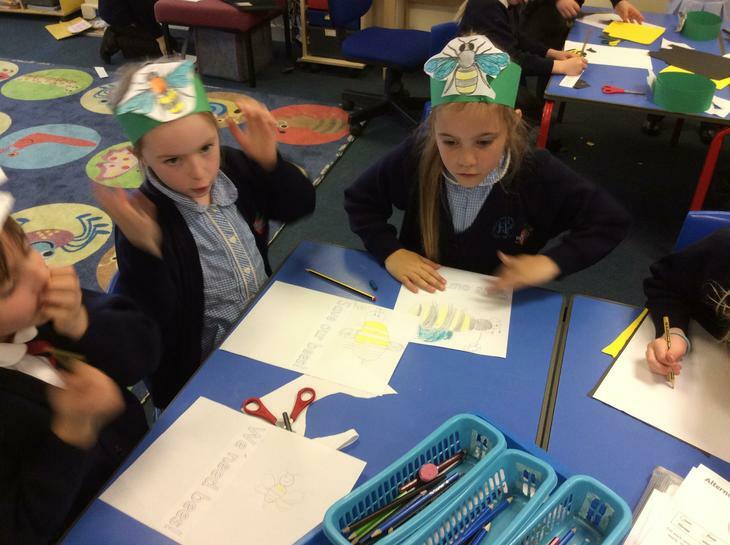 We made posters about saving our bees and did a "waggle dance" before becoming bees and flowers to show the important job the bee does by pollinating our plants. 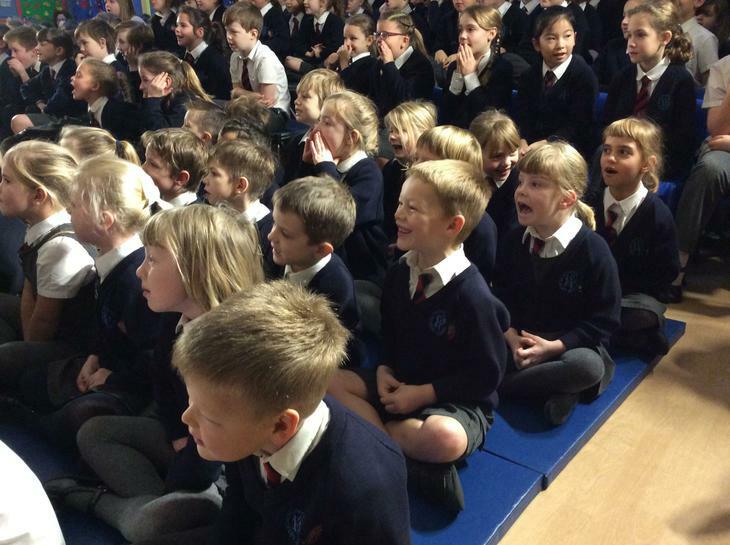 We are so excited. 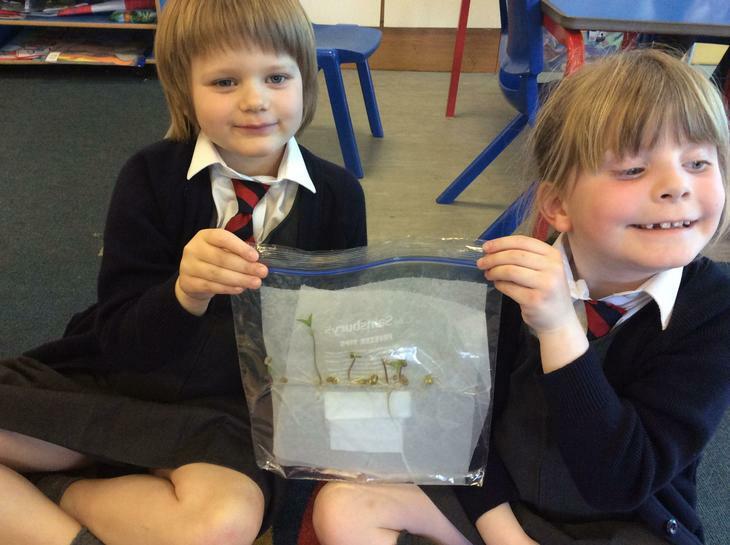 We have grown baby plants. 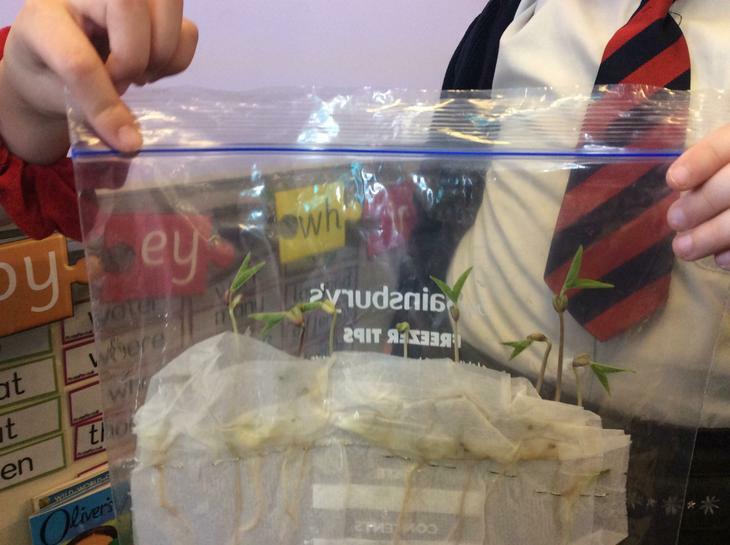 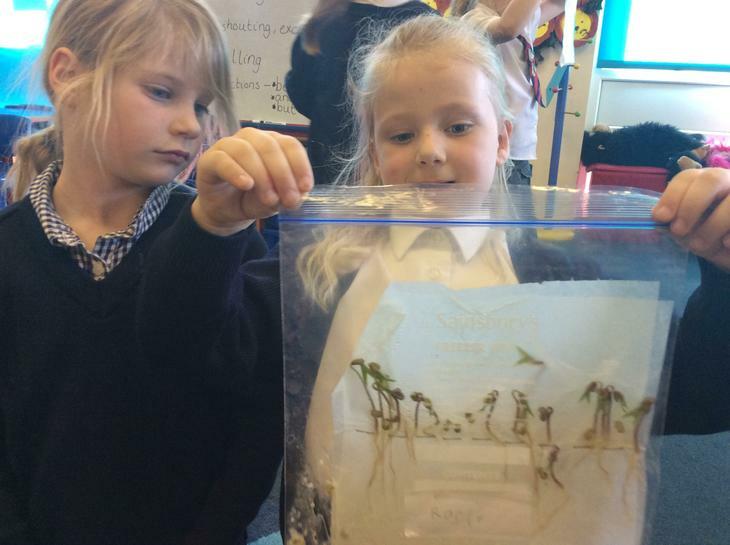 We have grown roots and shoots - it is very exciting! 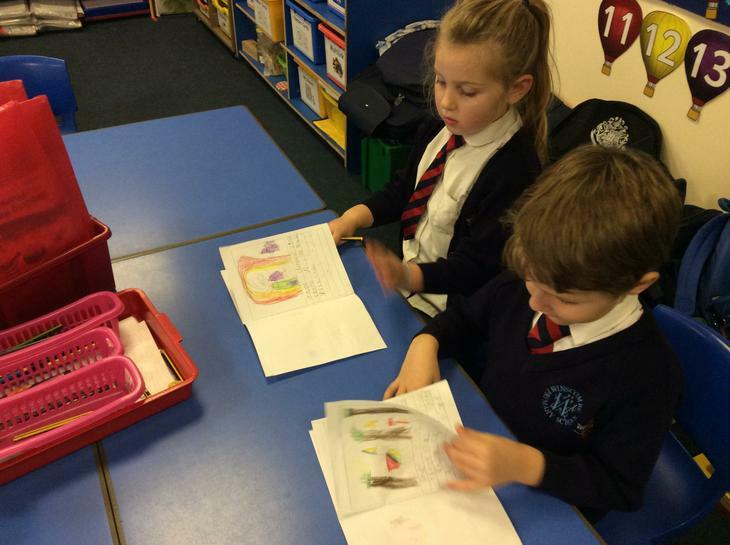 We are reading the story of Oliver's Vegetables. 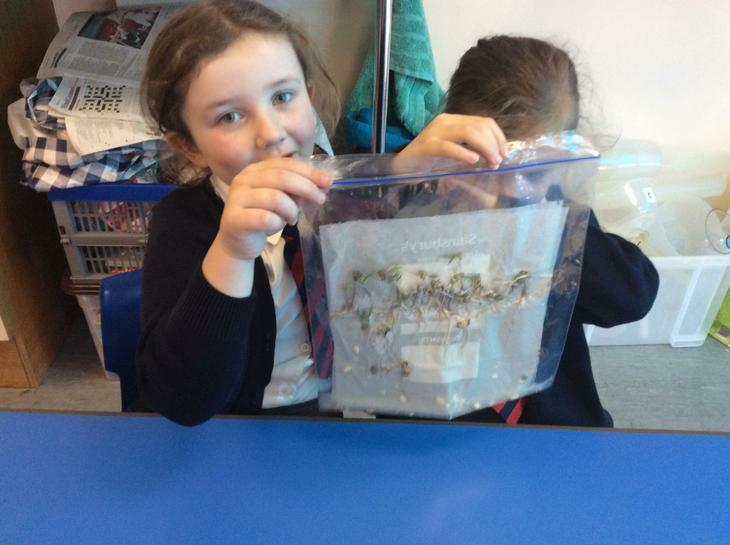 Mrs McCarthy has been helping us plant some seeds and we are looking forward to creating our own vegetable garden. 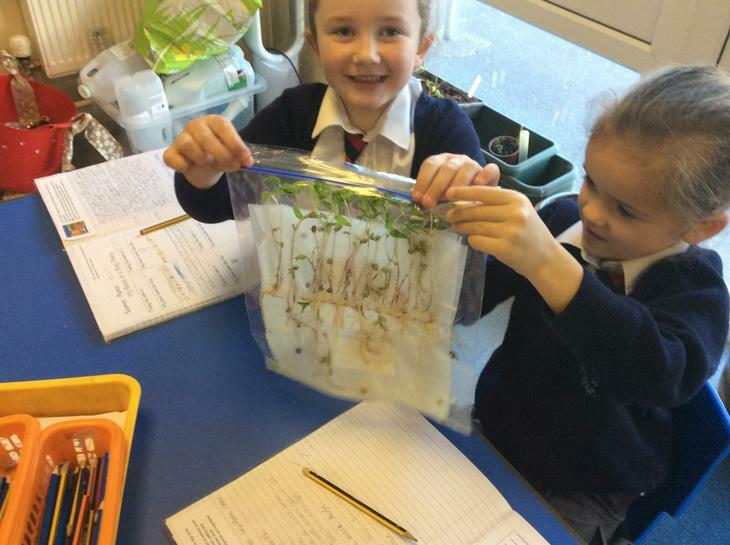 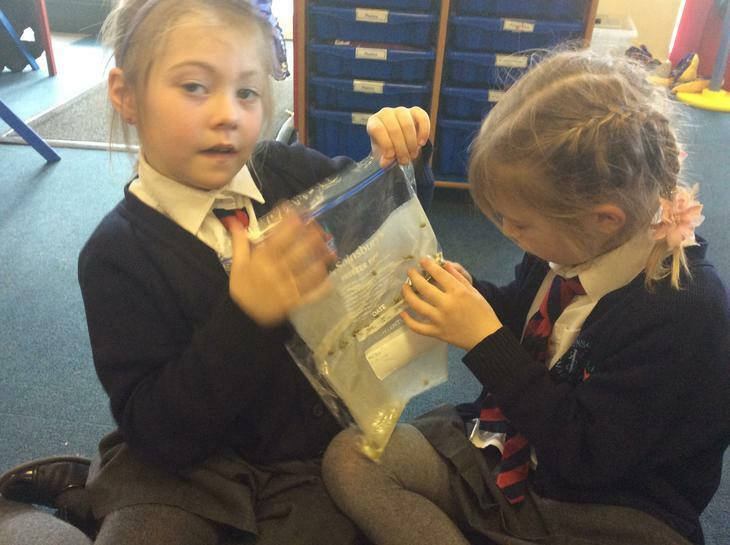 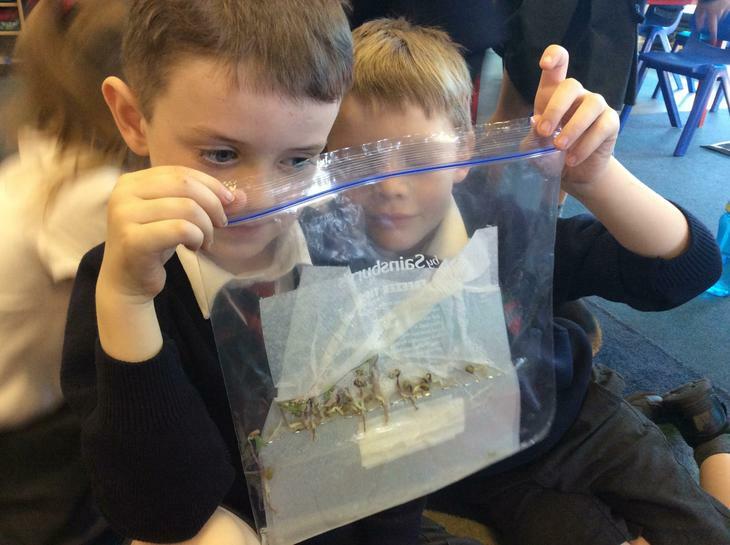 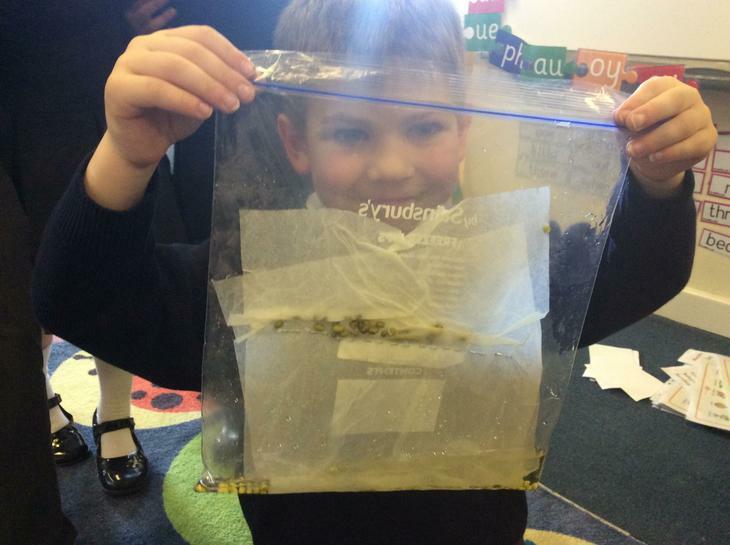 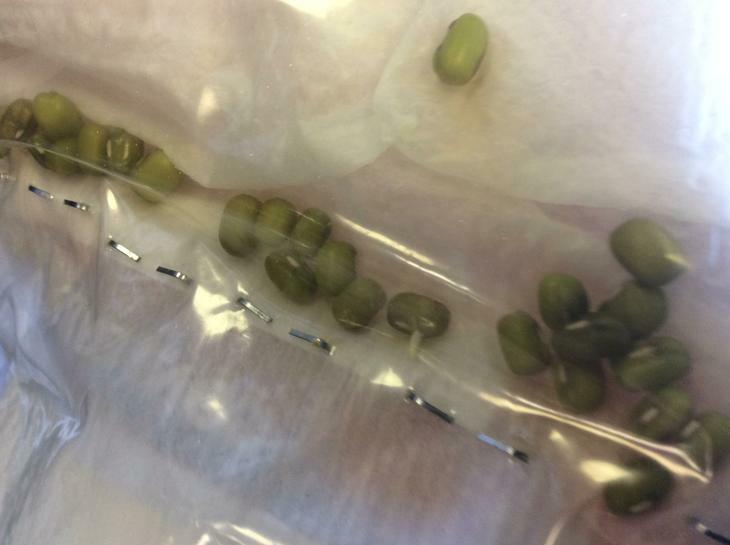 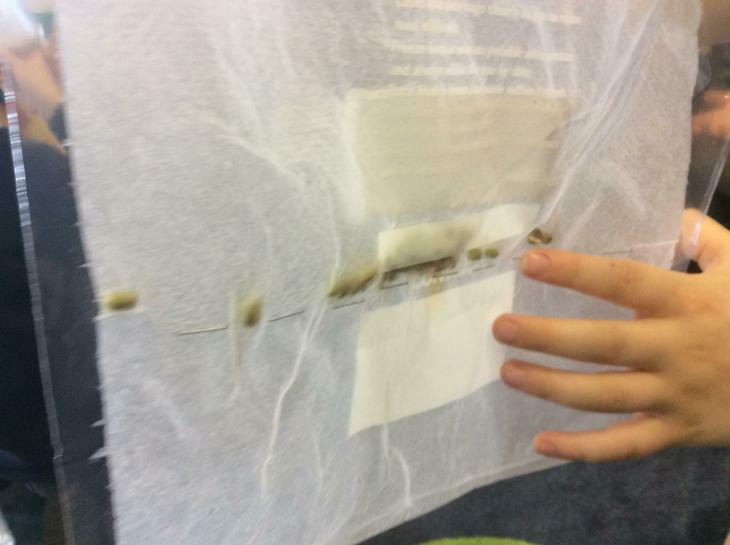 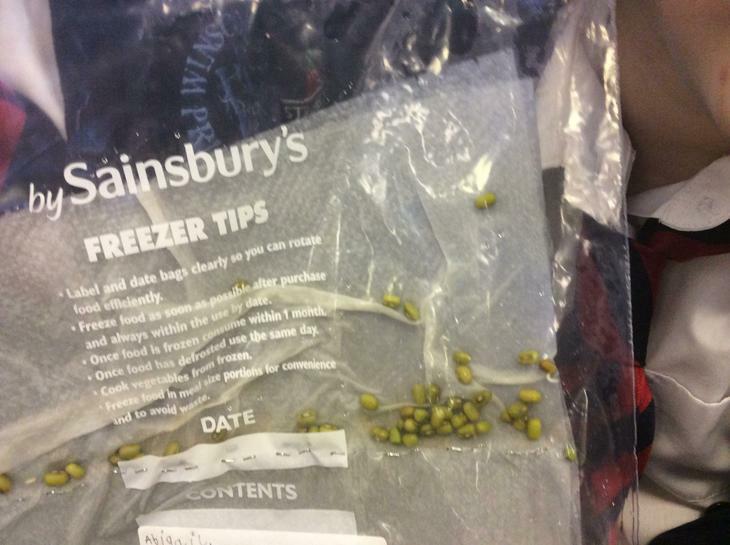 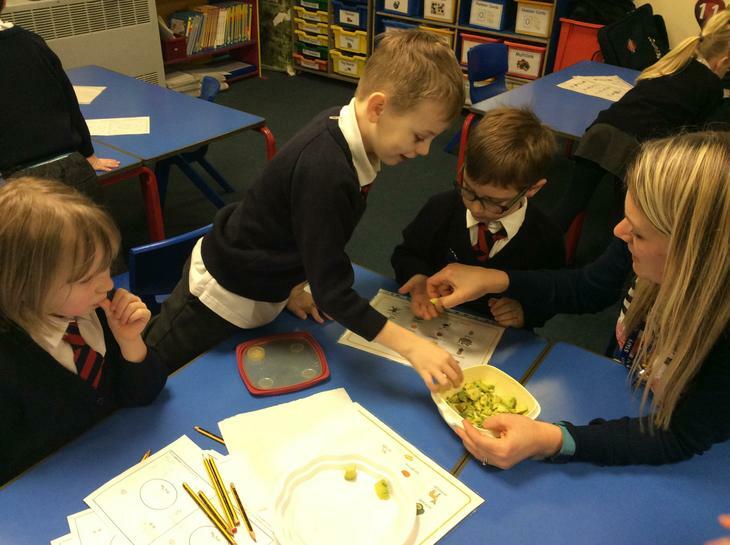 We have been looking at seeds and we are carefully watching the germination of our beans. 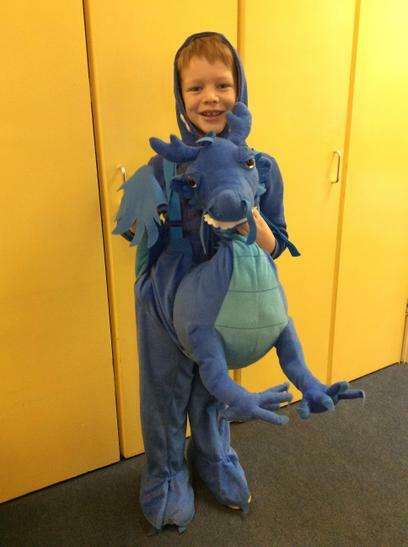 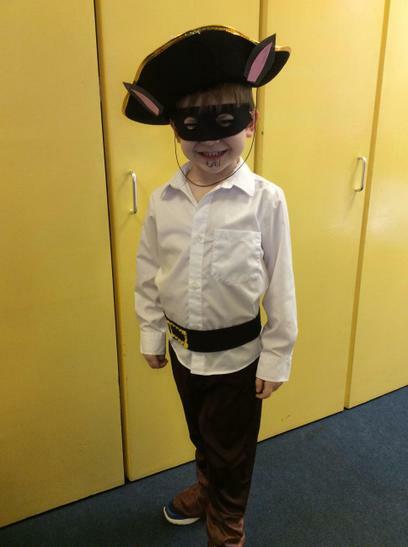 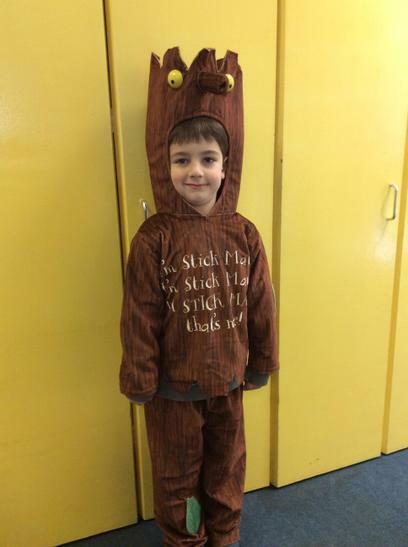 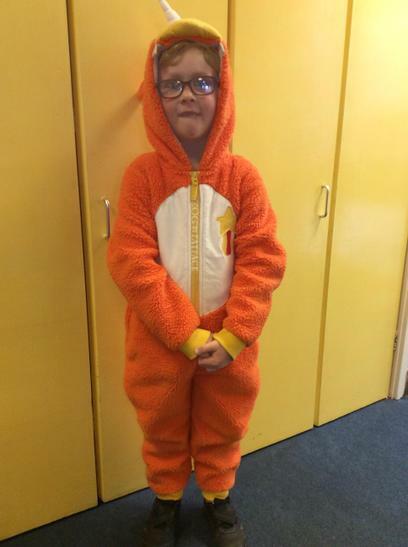 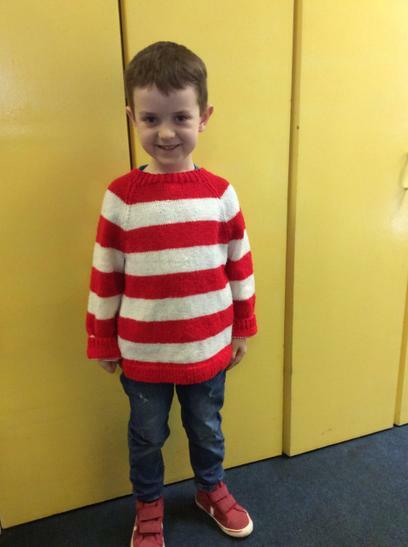 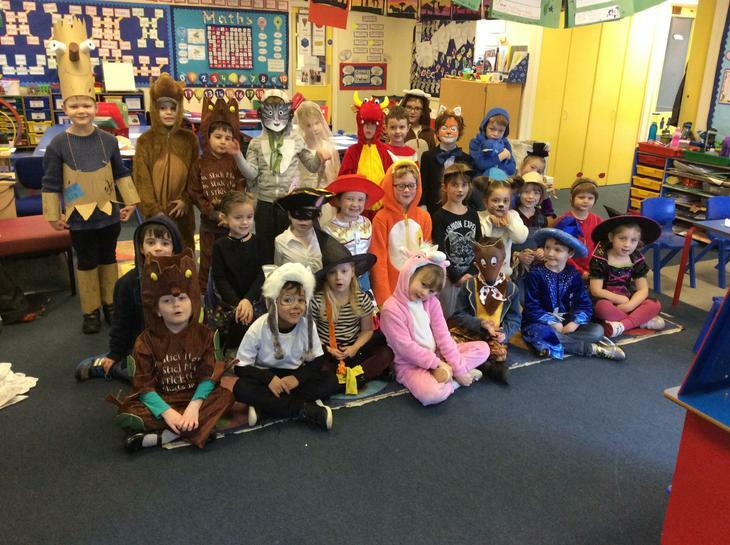 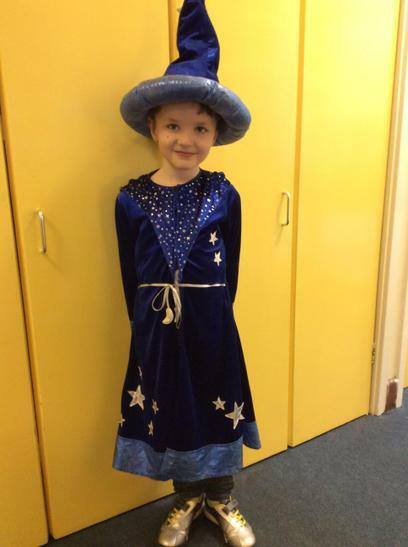 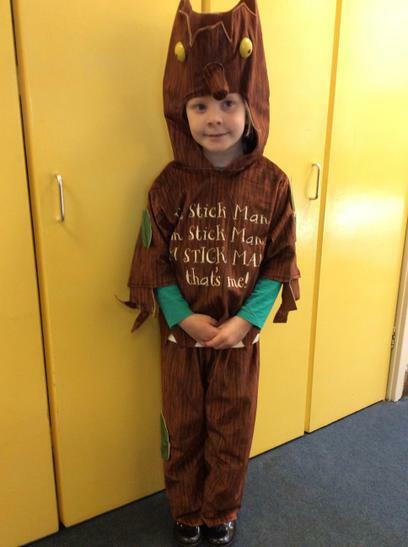 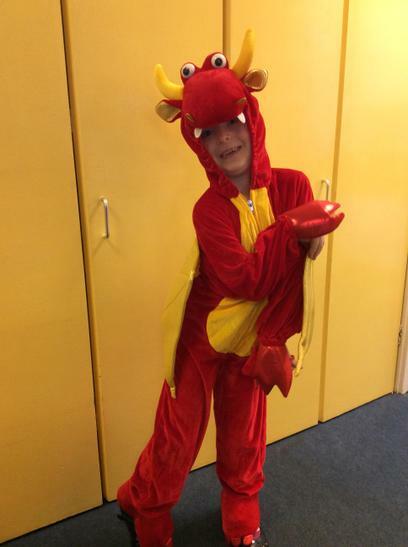 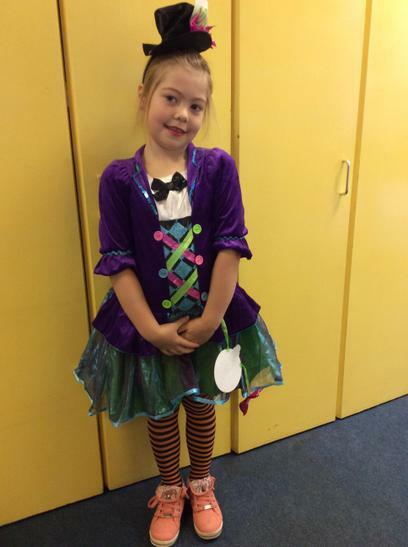 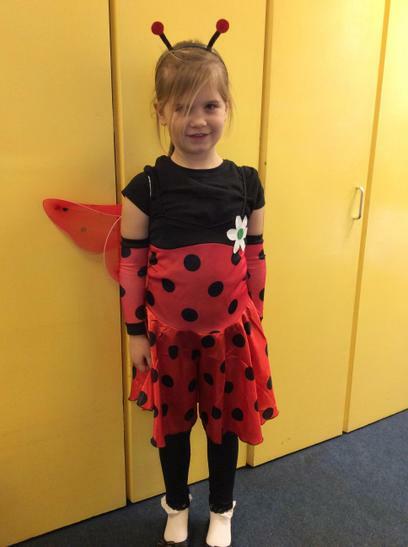 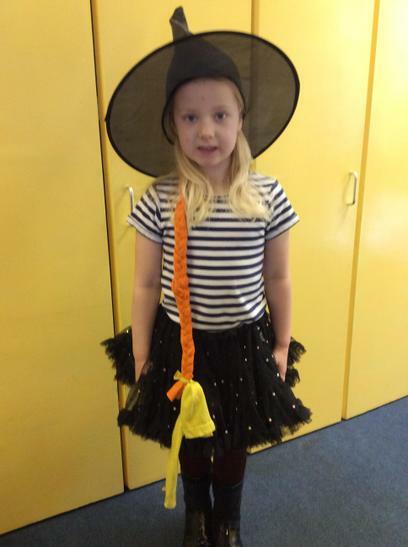 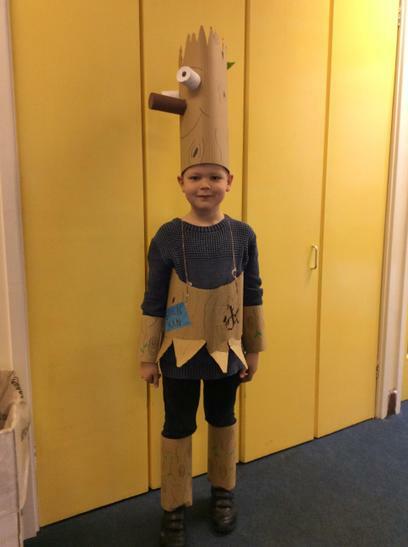 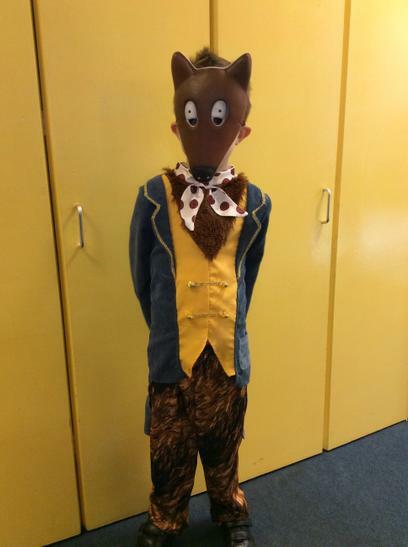 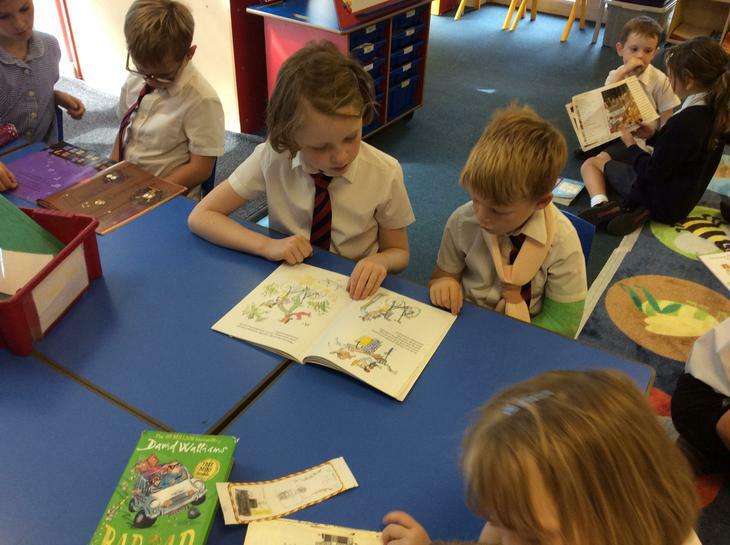 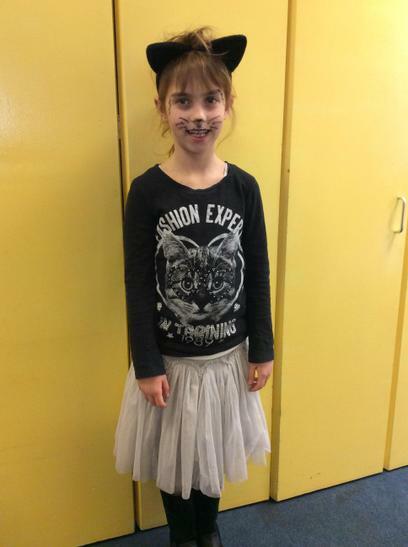 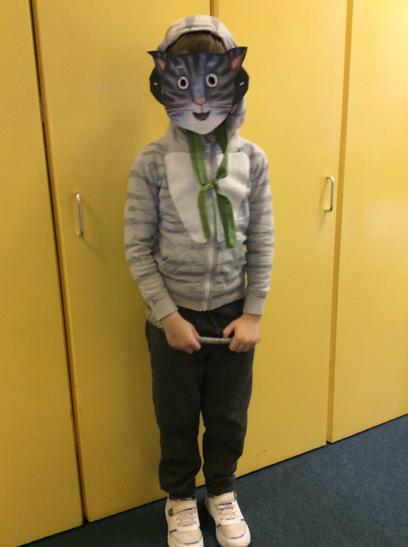 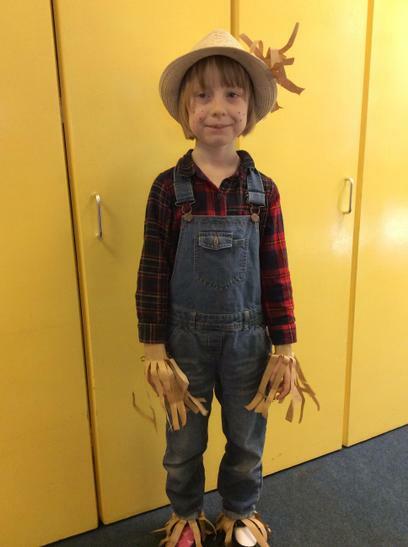 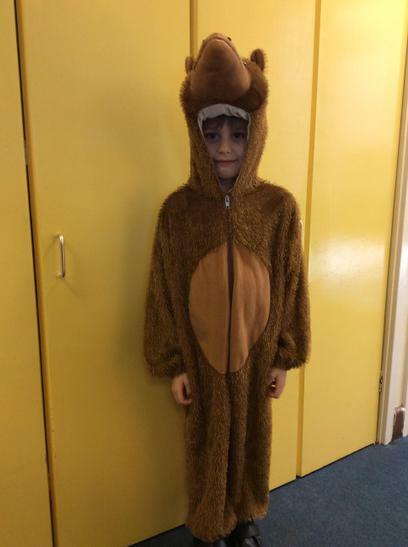 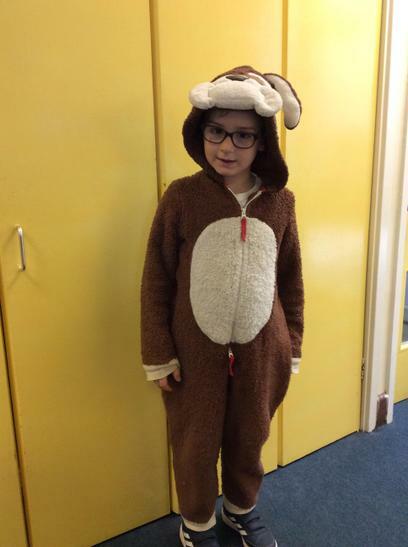 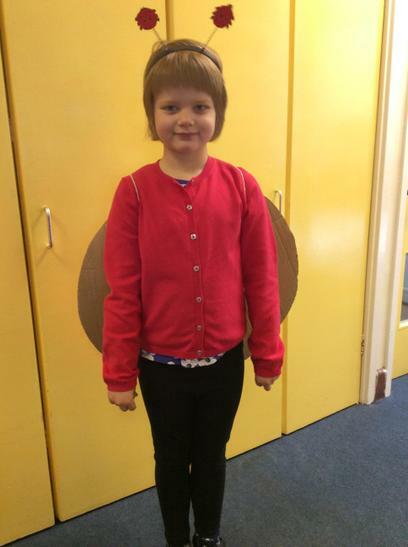 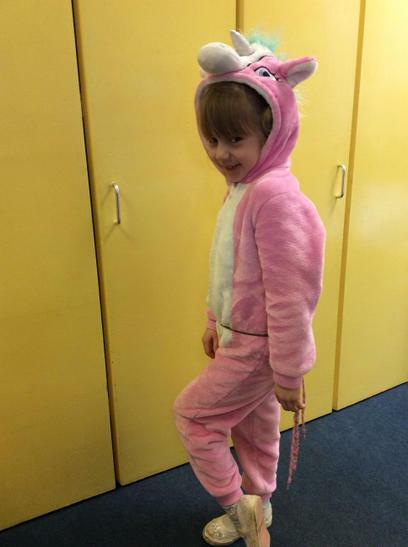 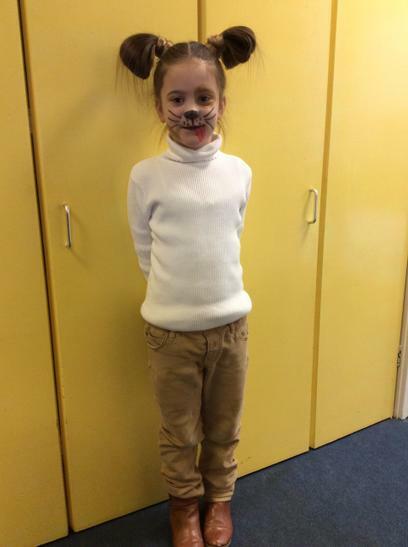 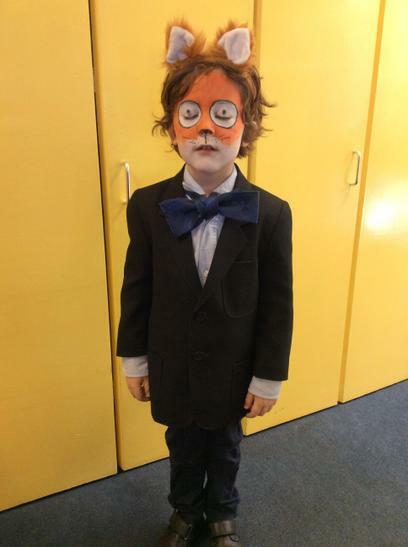 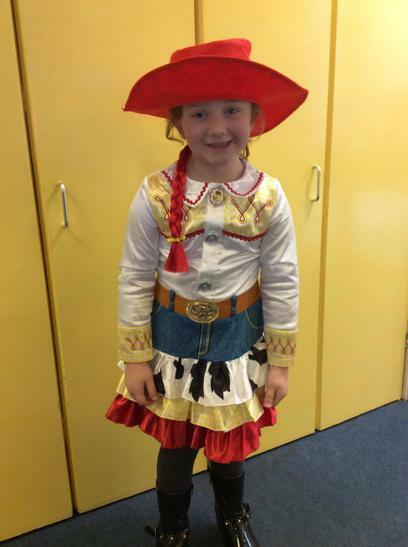 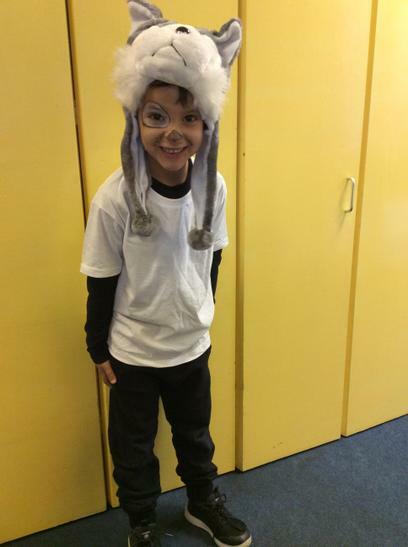 We have really enjoyed celebrating World Book Day with all our Julia Donaldson books and characters. 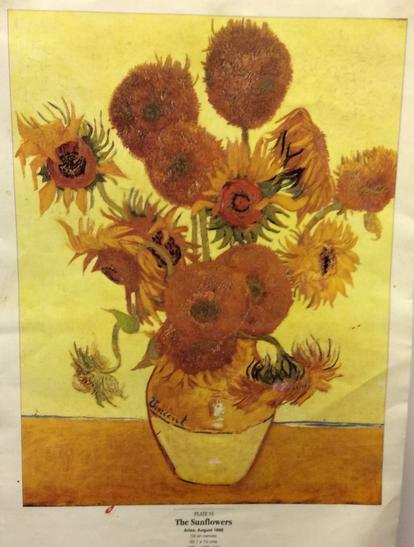 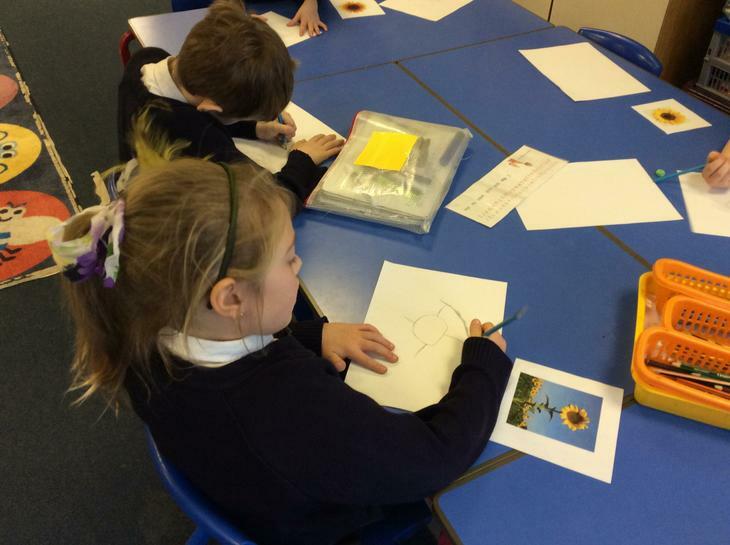 We have been learning about Vincent Van Gogh. 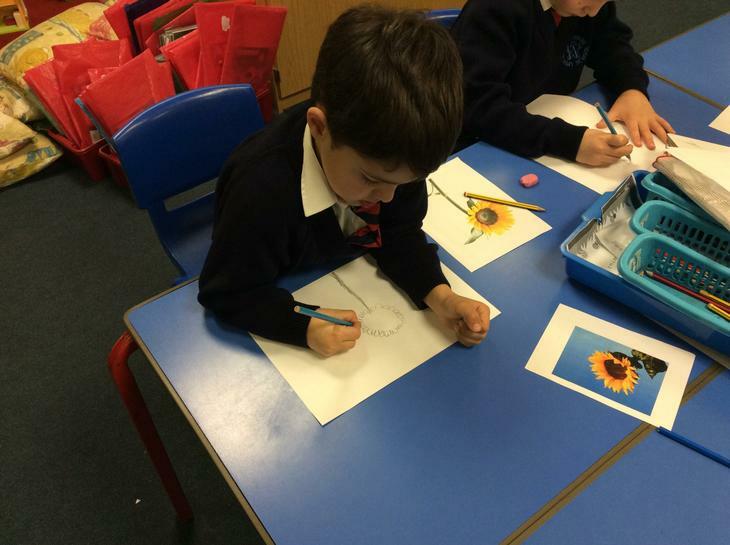 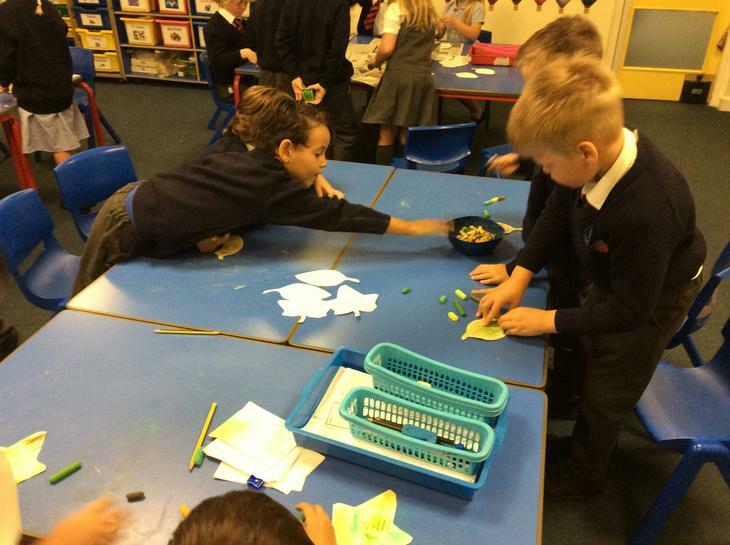 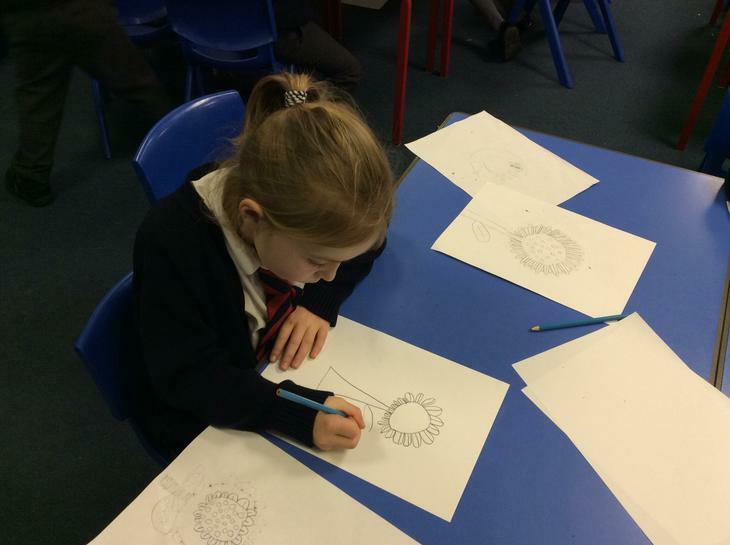 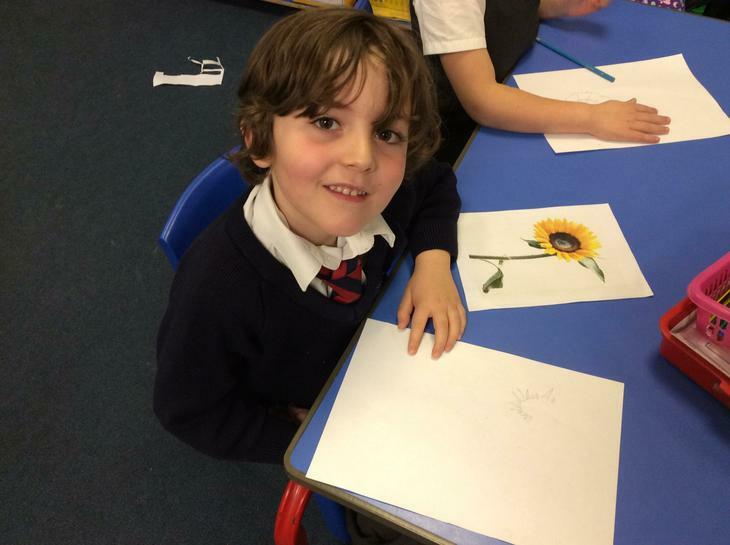 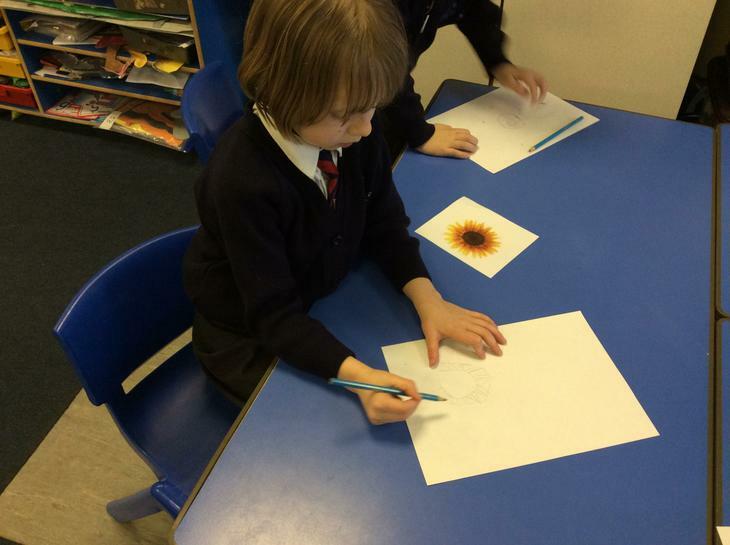 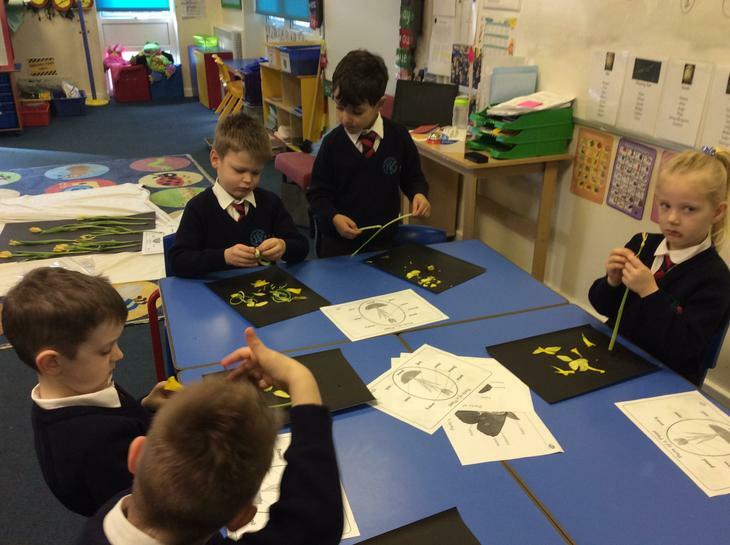 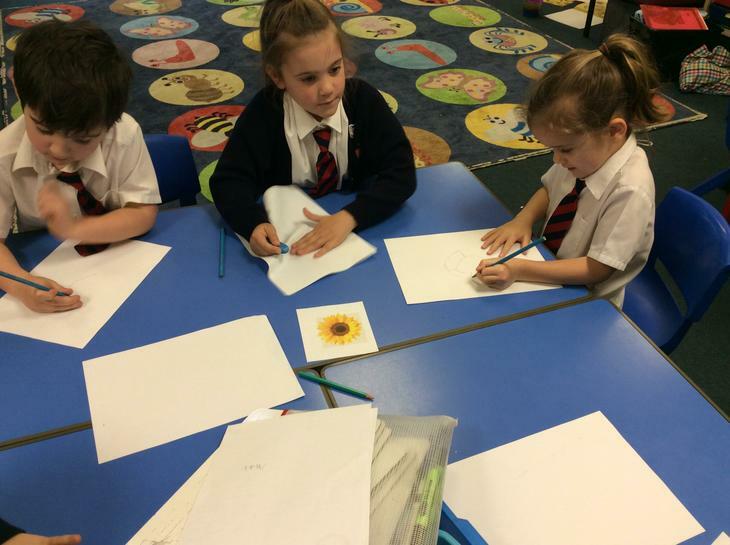 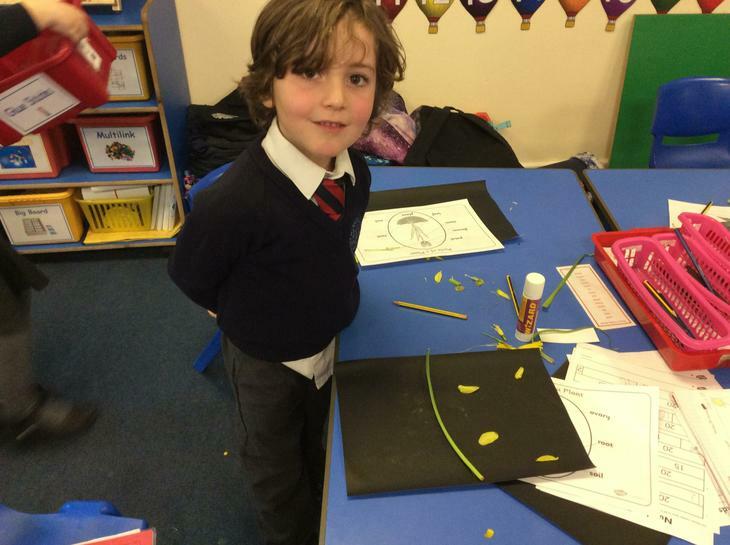 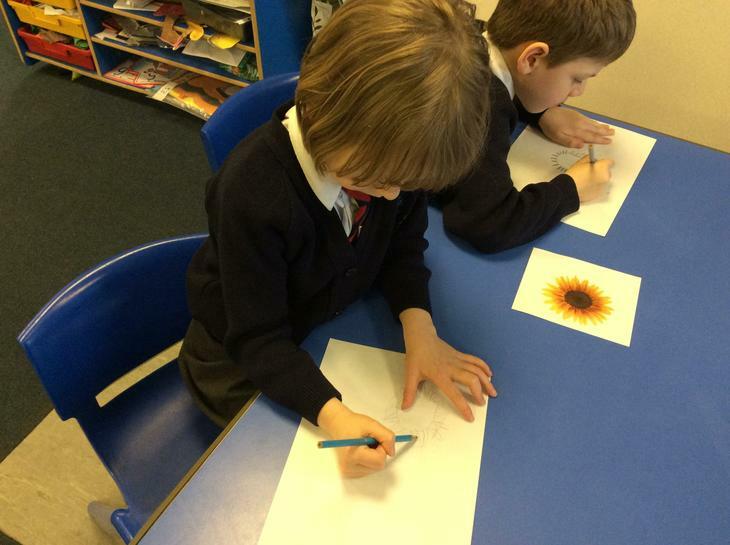 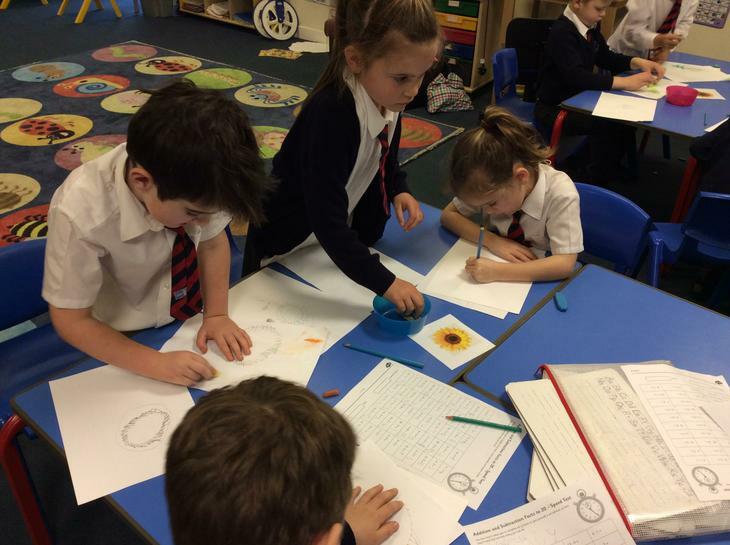 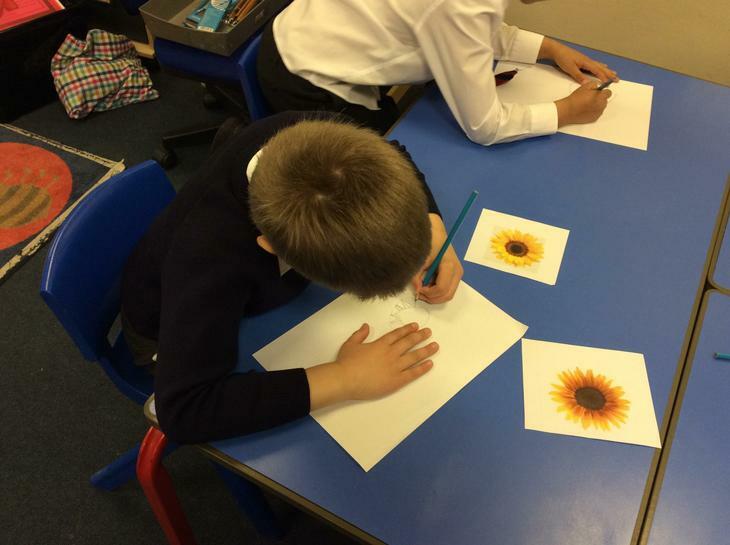 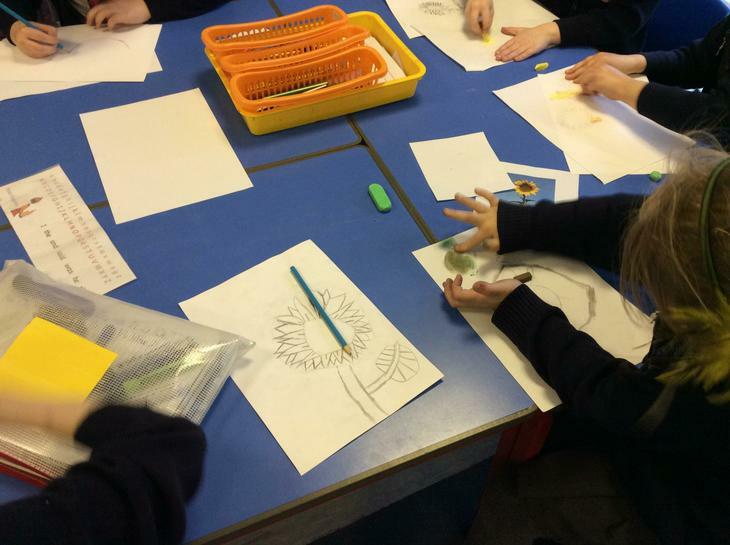 We are creating our own Class version of The Sunflowers. 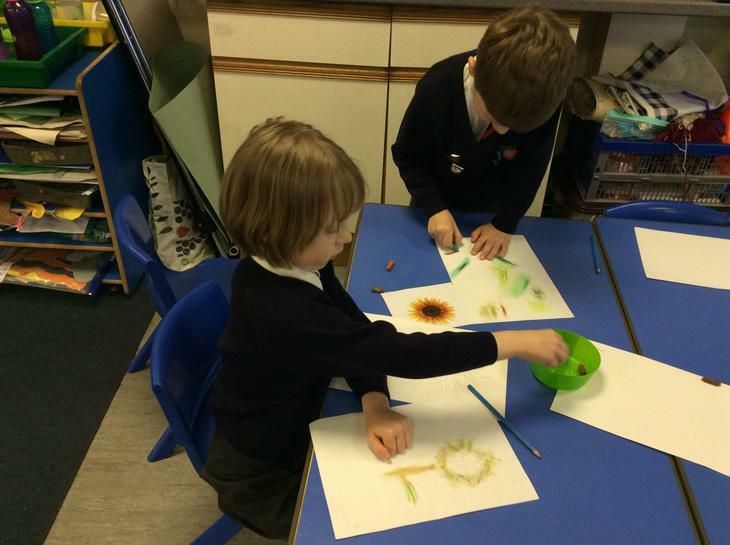 We have been experimenting with shape, colour and lines. 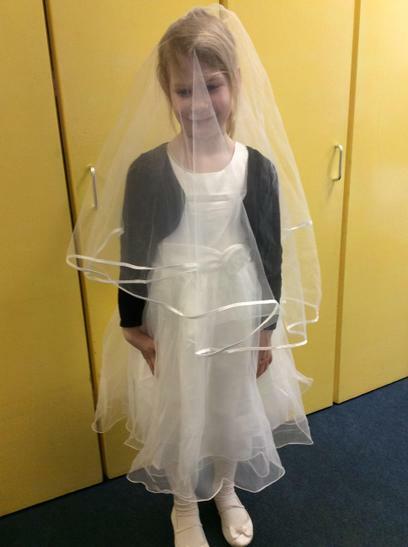 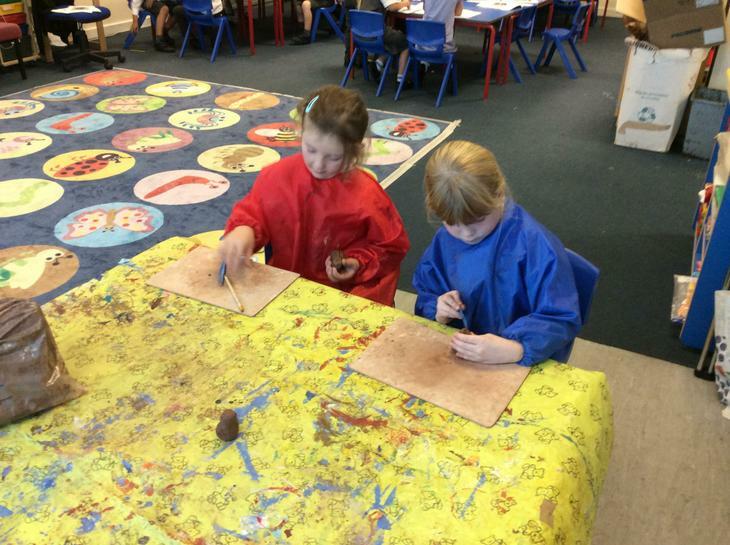 It is taking some time but we think the finished masterpiece will be fantastic! 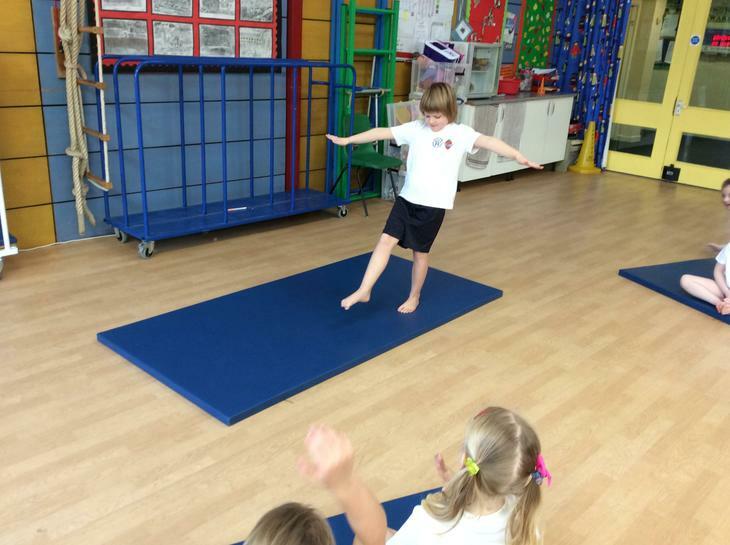 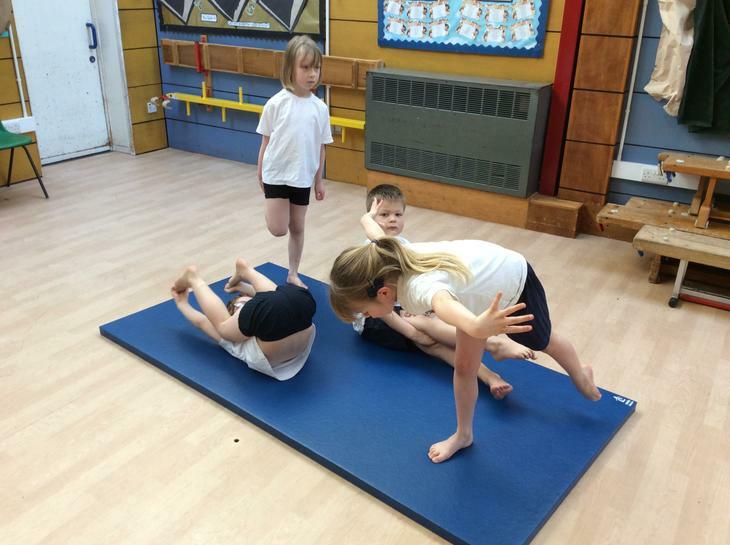 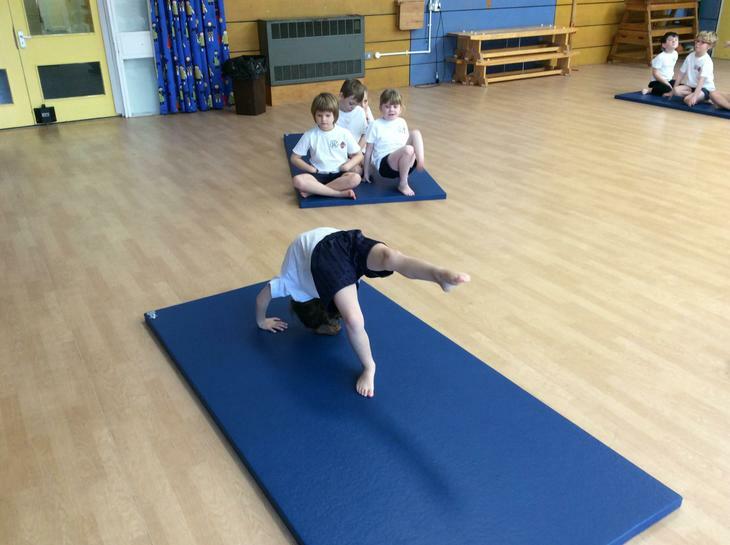 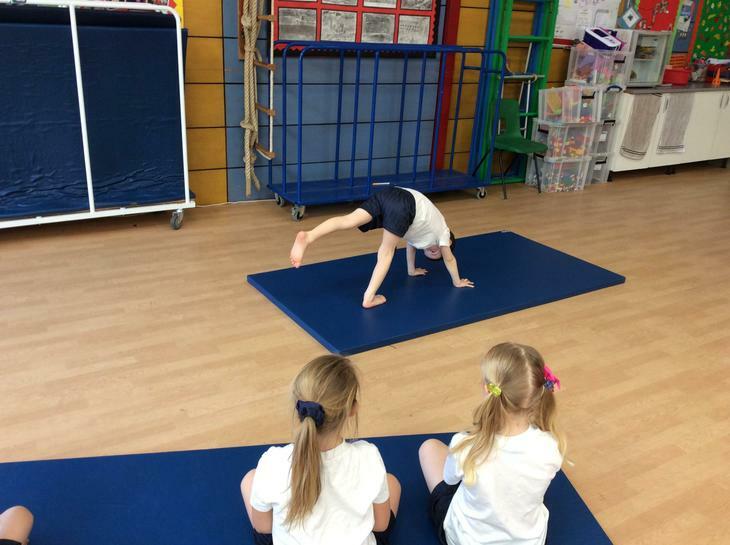 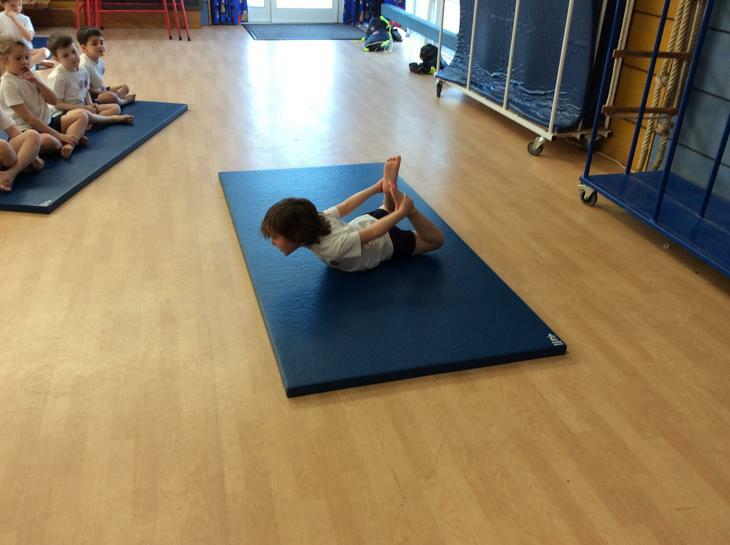 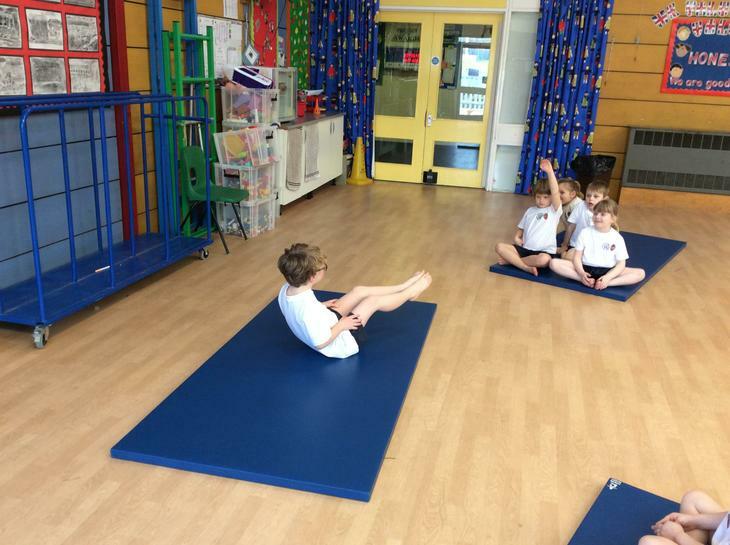 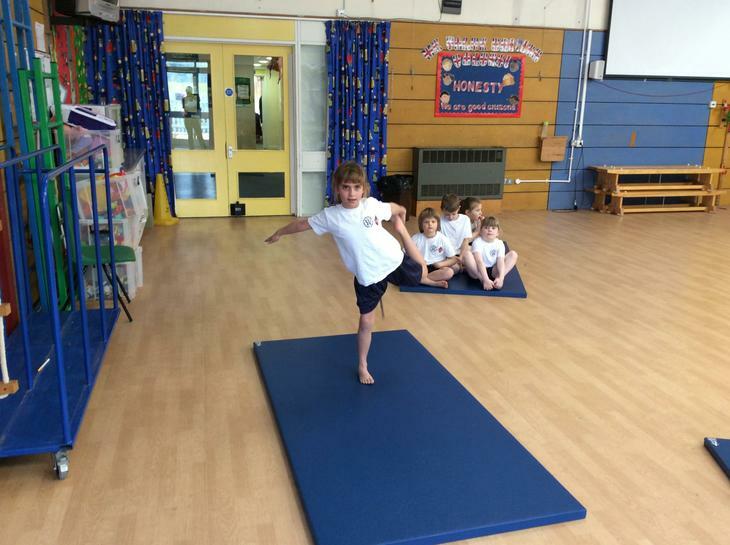 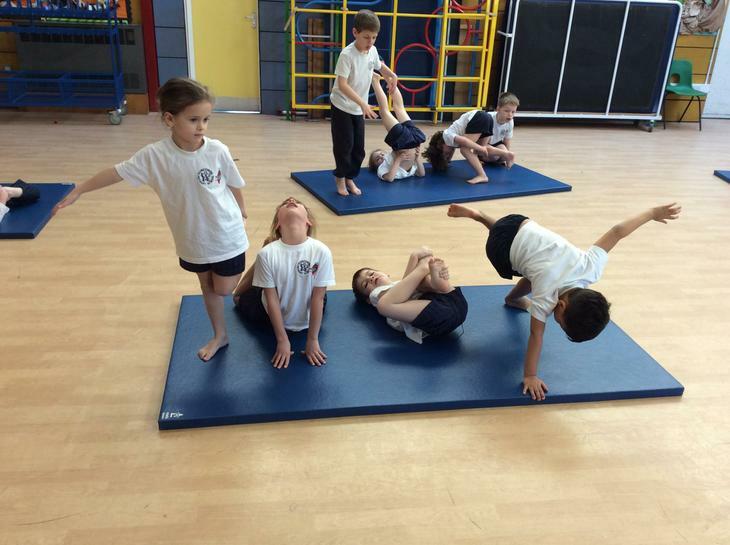 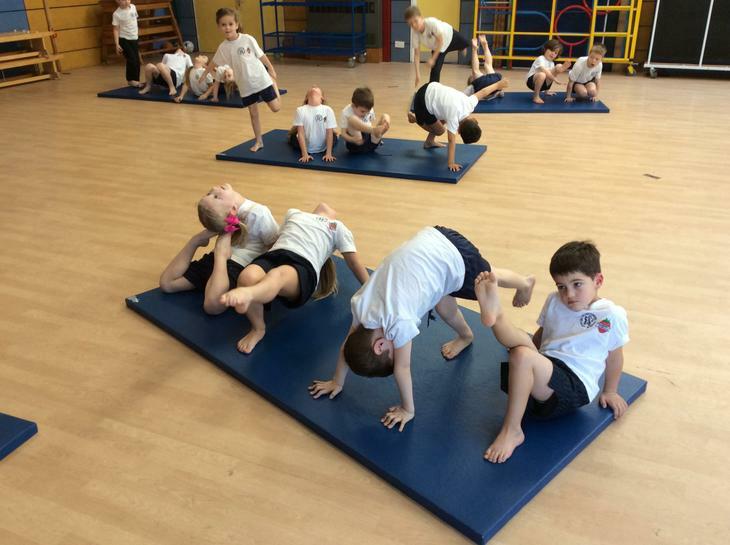 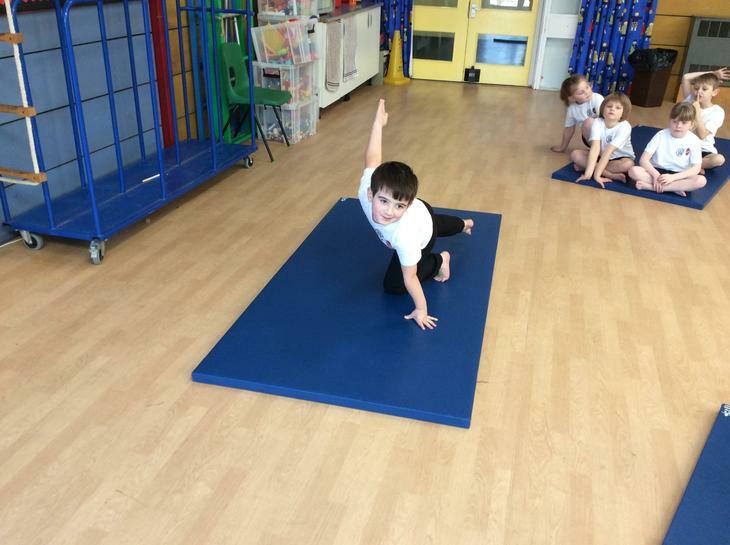 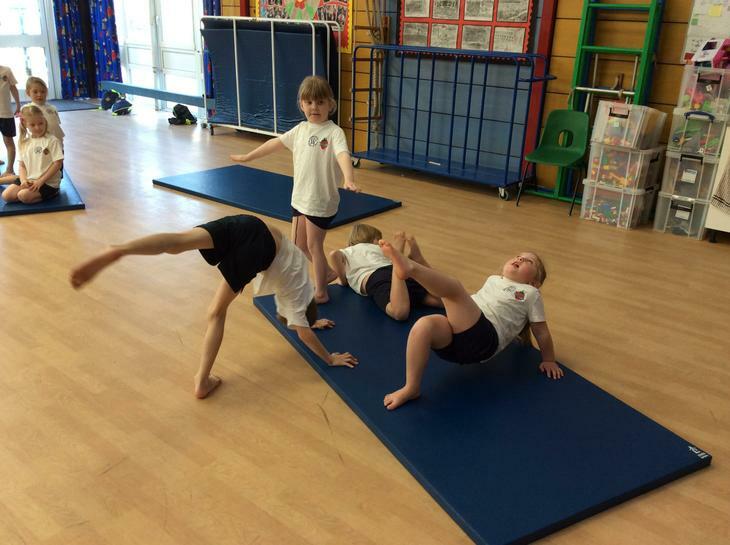 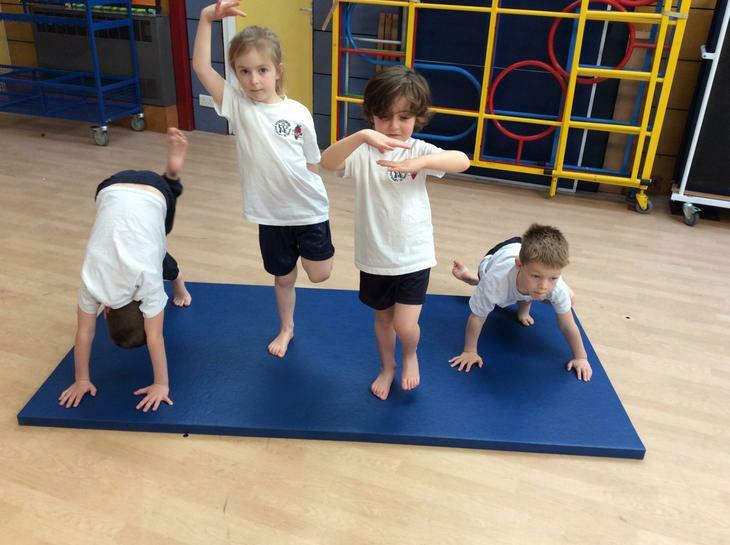 In PE we have been developing our balancing and control. 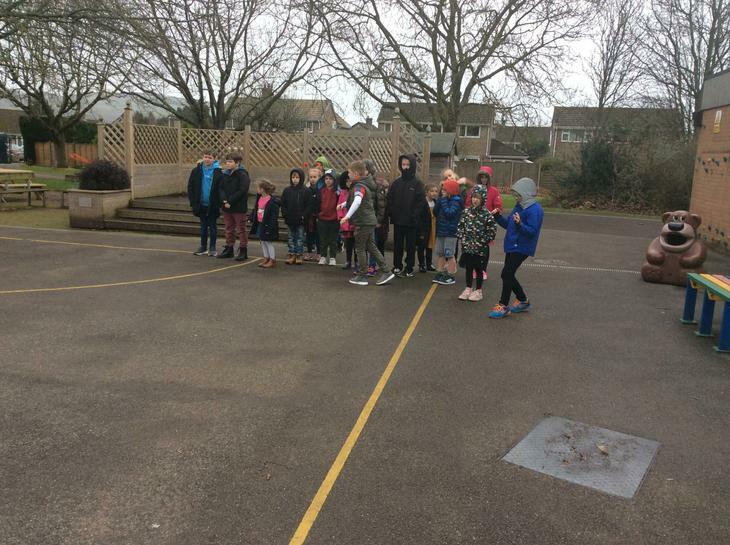 We all managed to hold our balances very still. 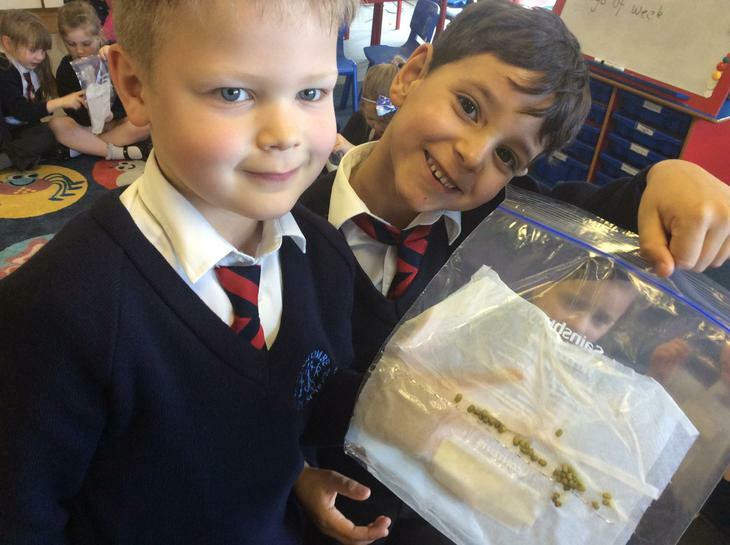 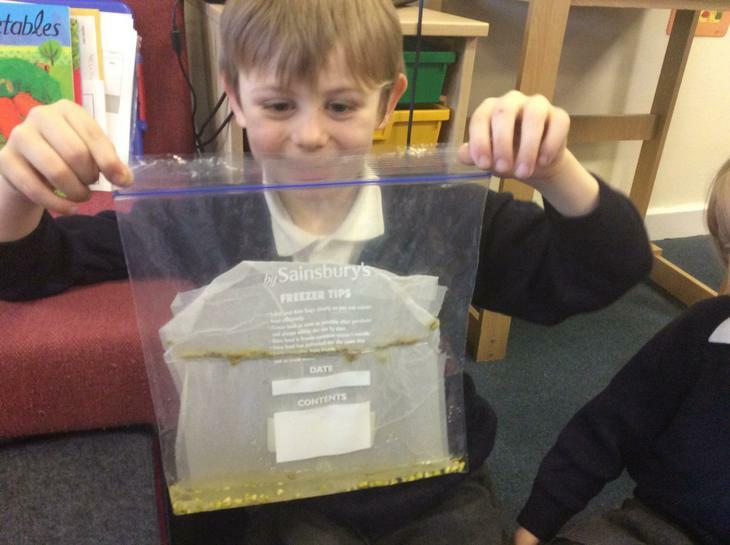 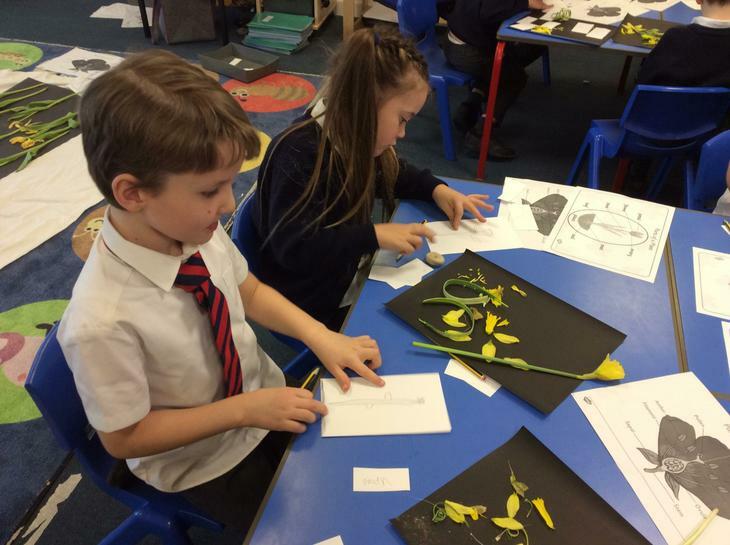 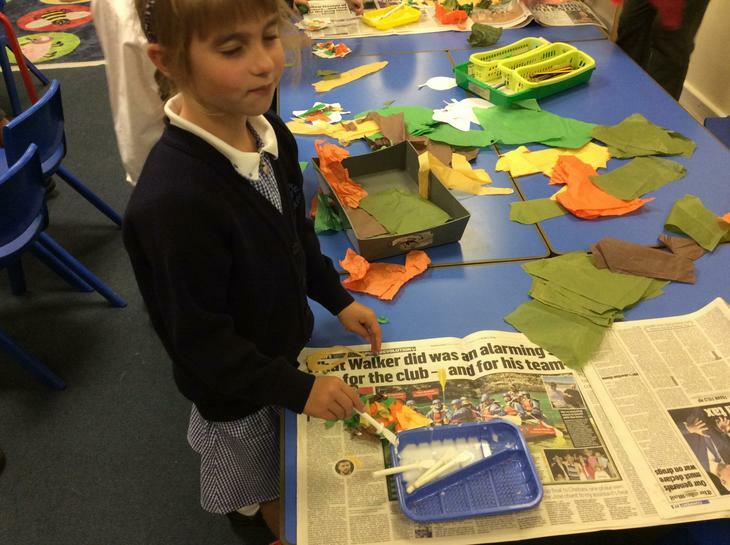 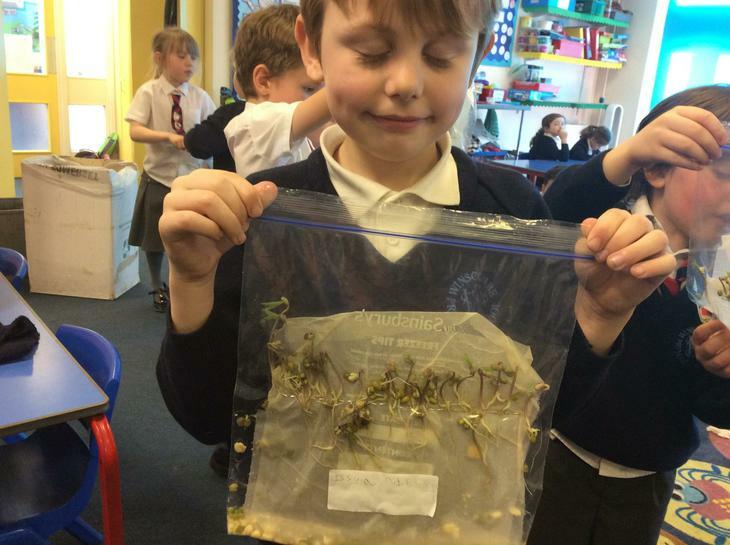 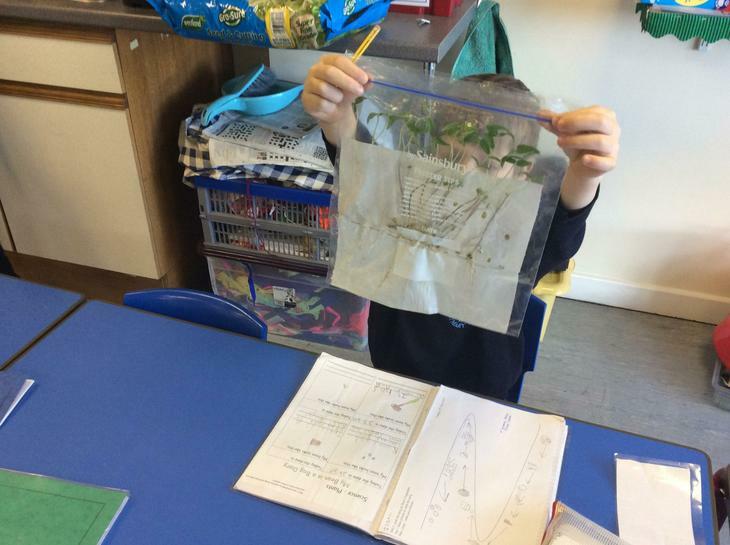 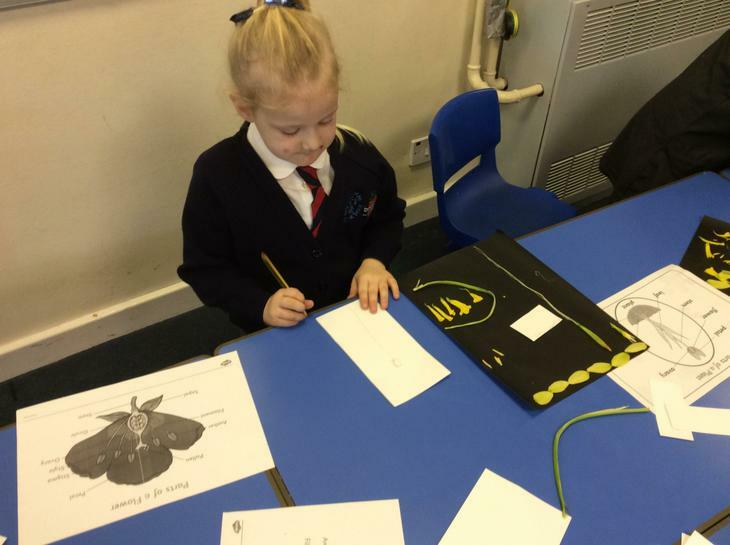 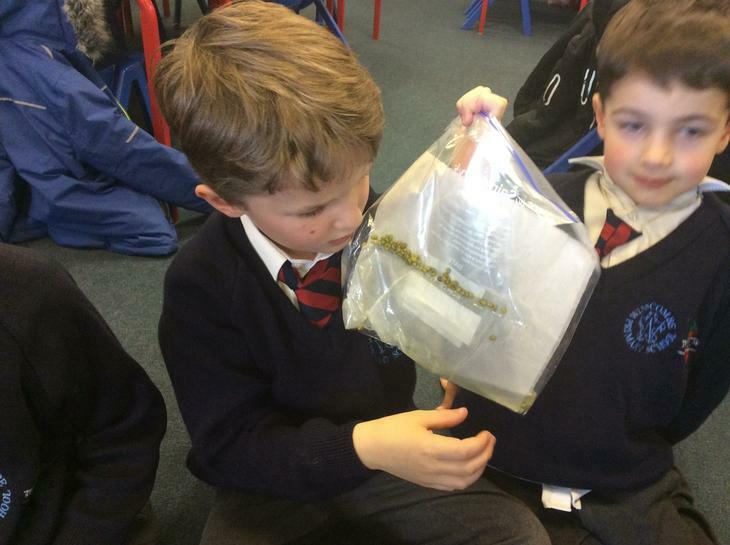 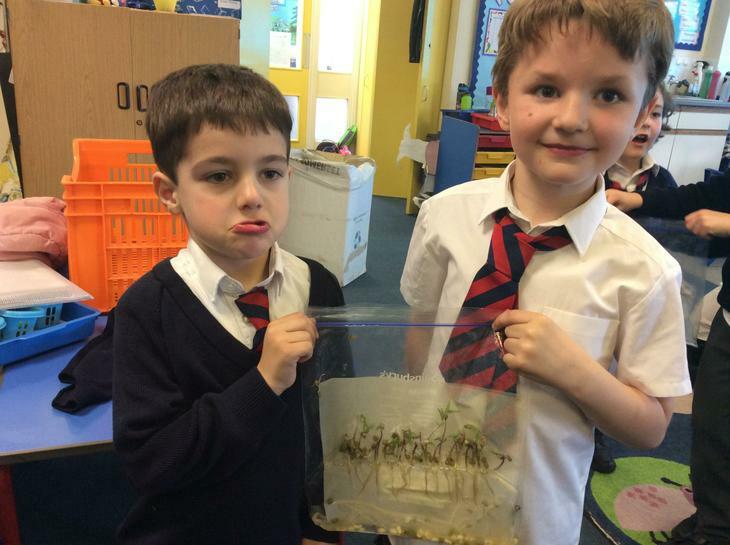 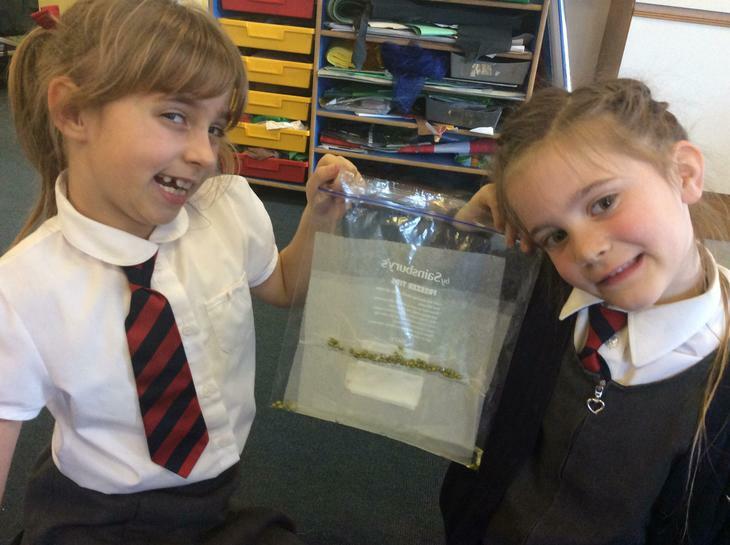 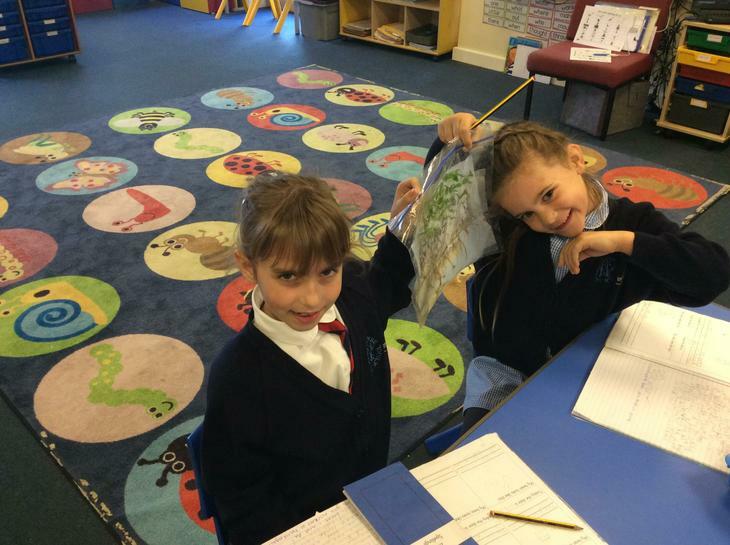 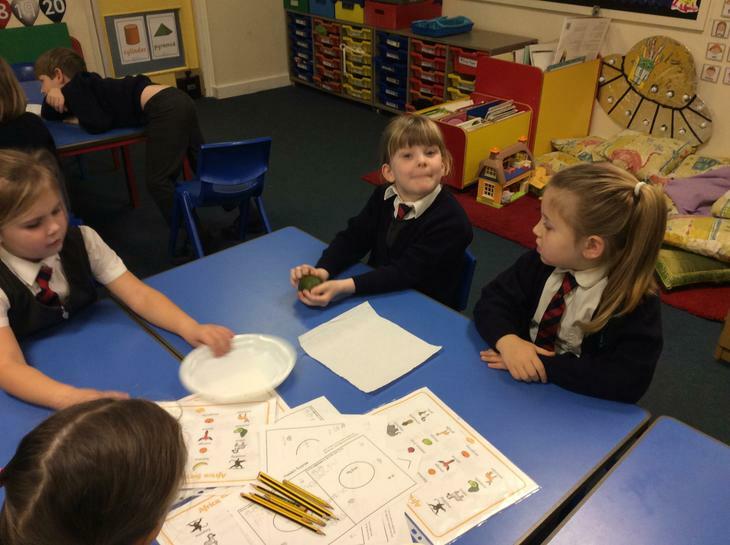 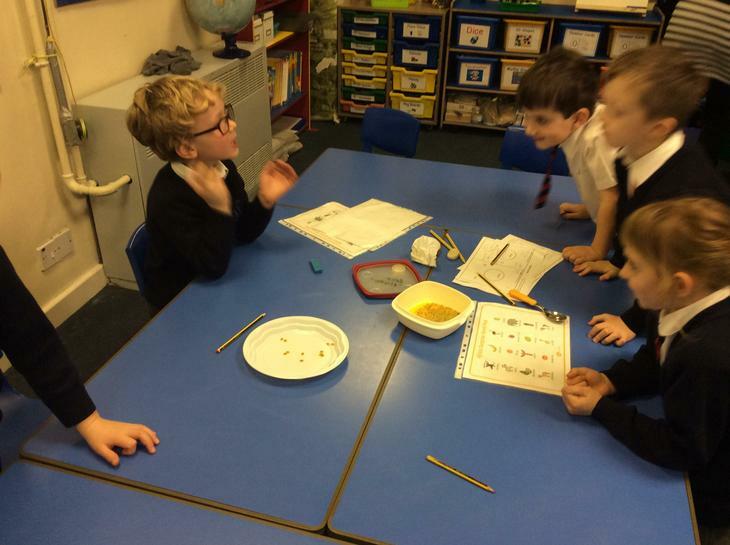 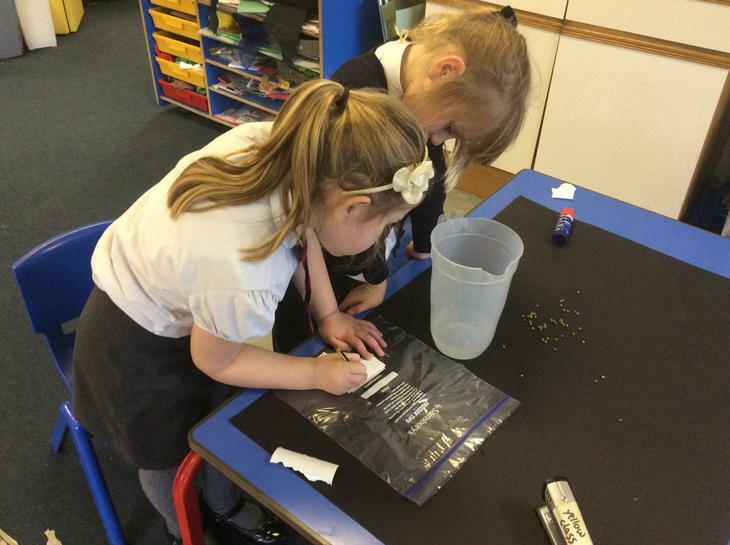 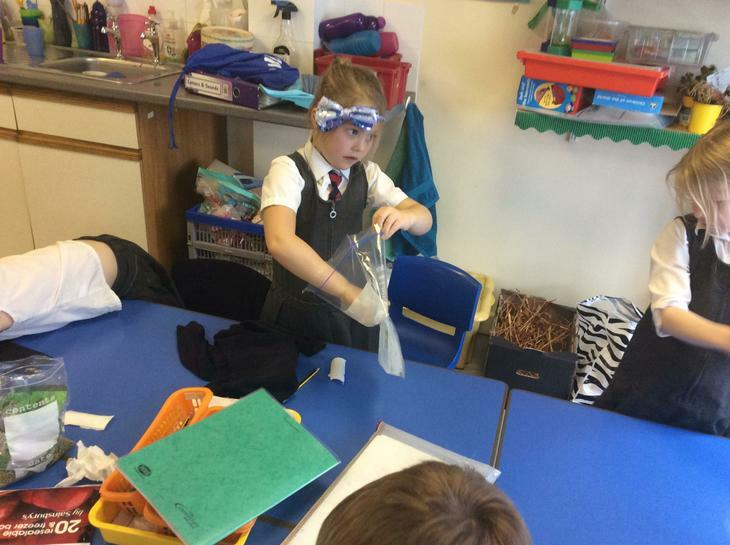 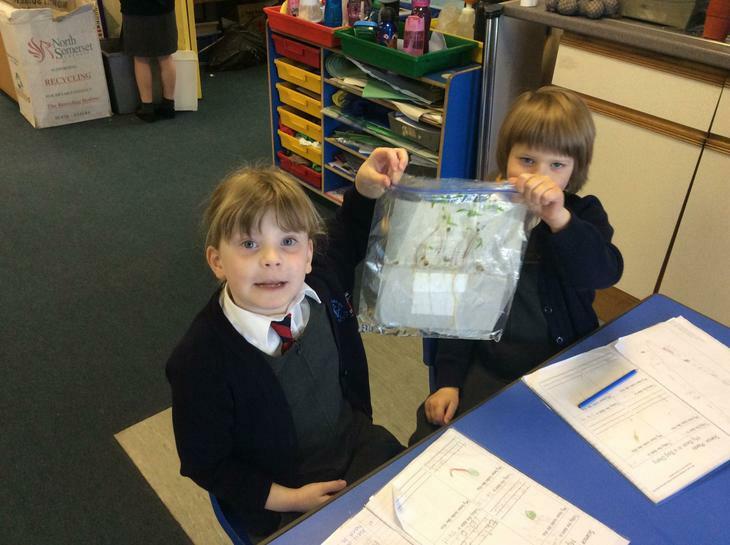 In science we are learning about plants. 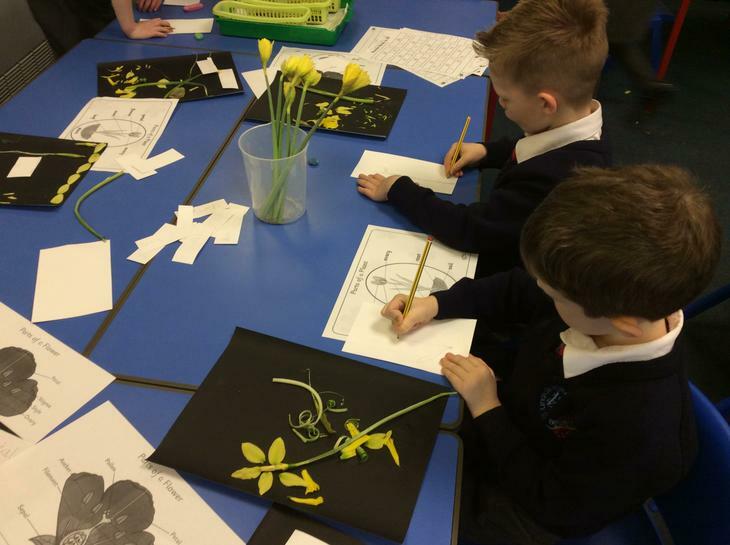 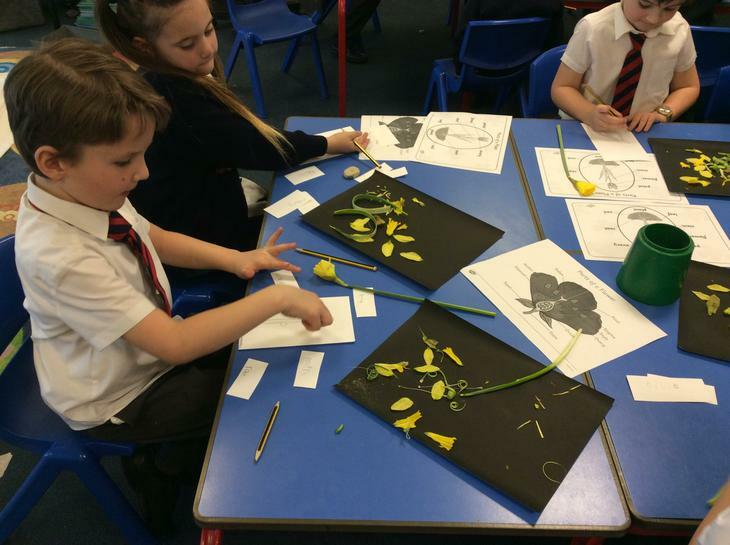 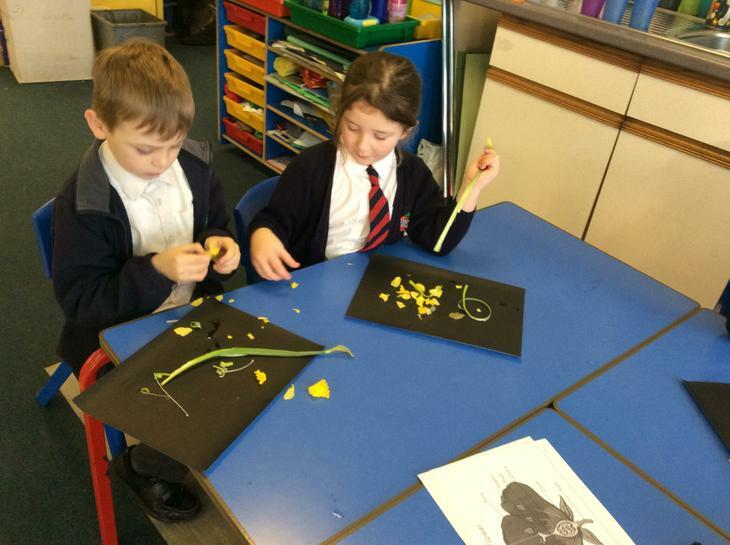 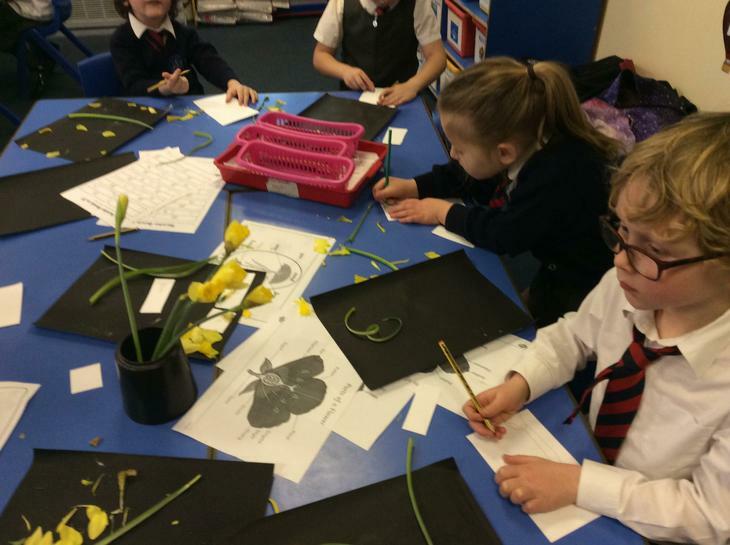 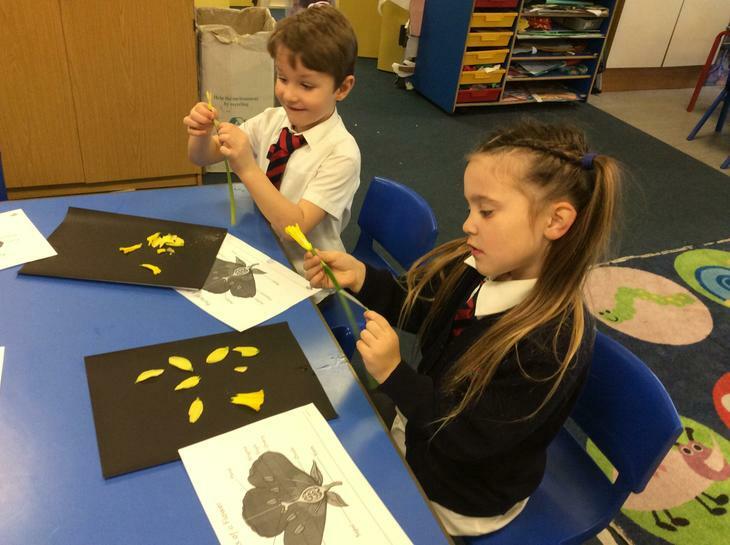 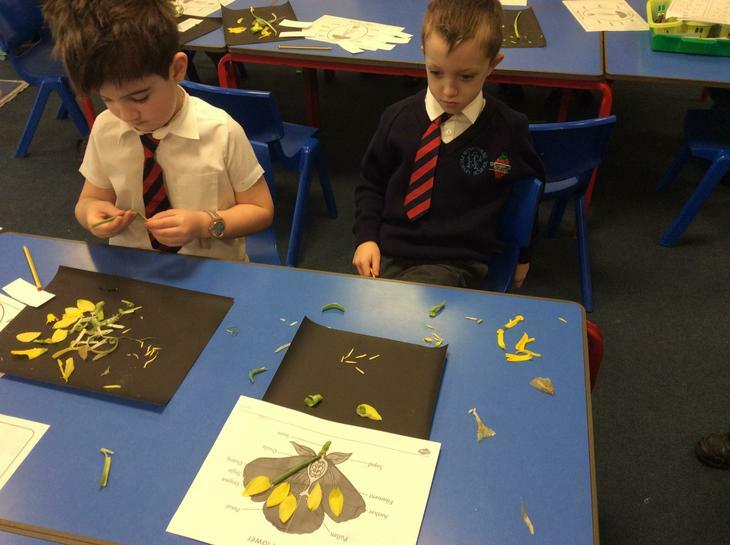 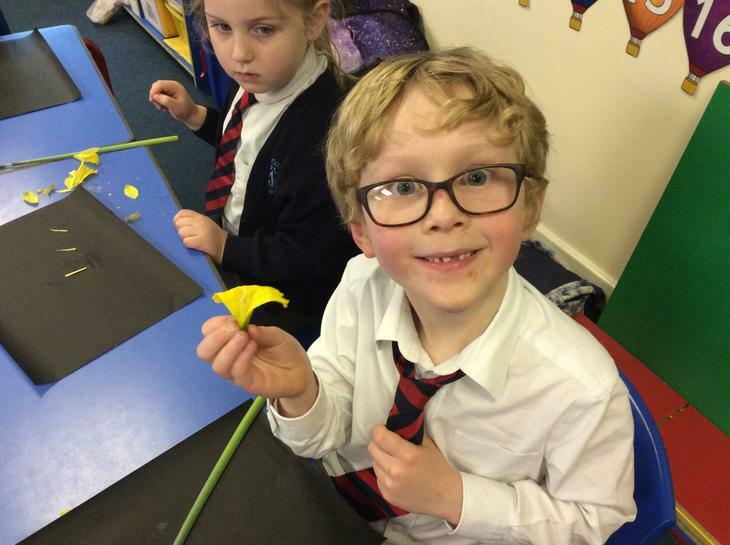 We looked carefully at daffodils and identified the different parts. 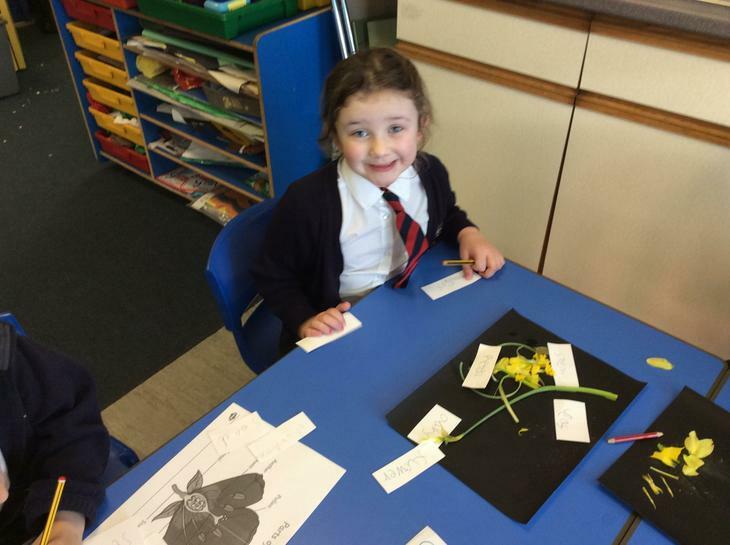 We then labelled the parts of the daffodil. 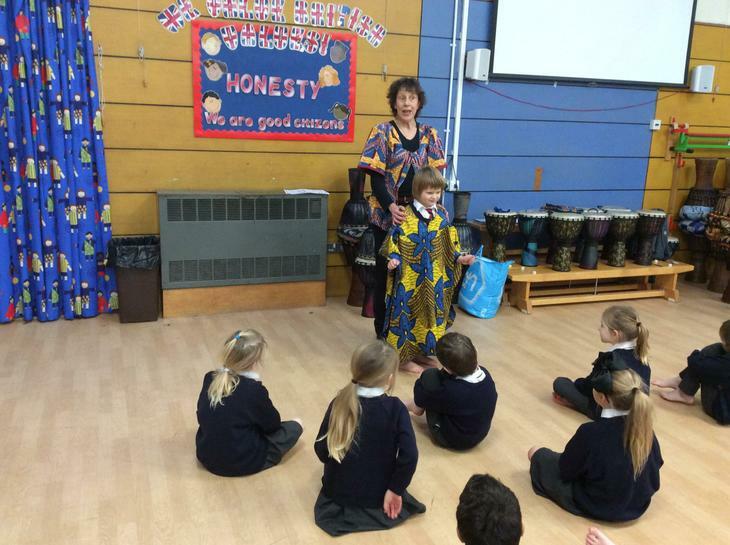 We have have been learning to sing the Swahili Jambo song. 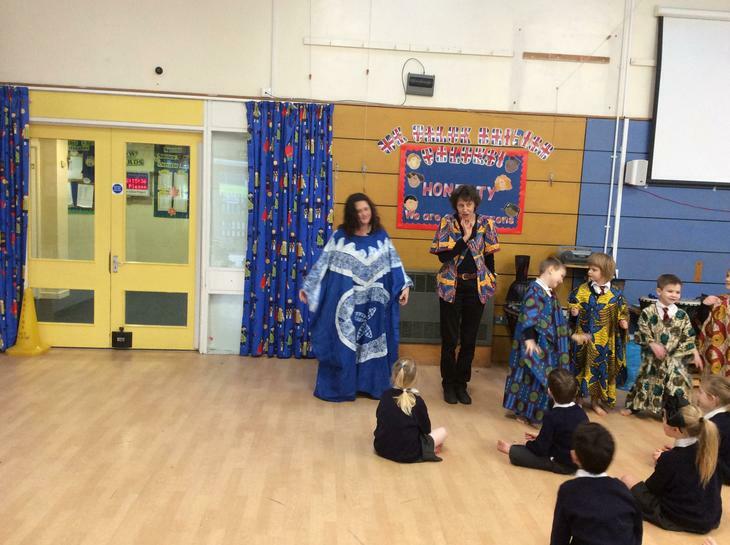 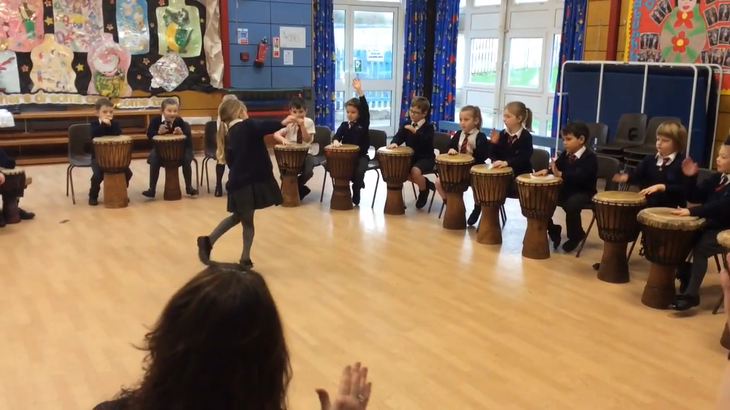 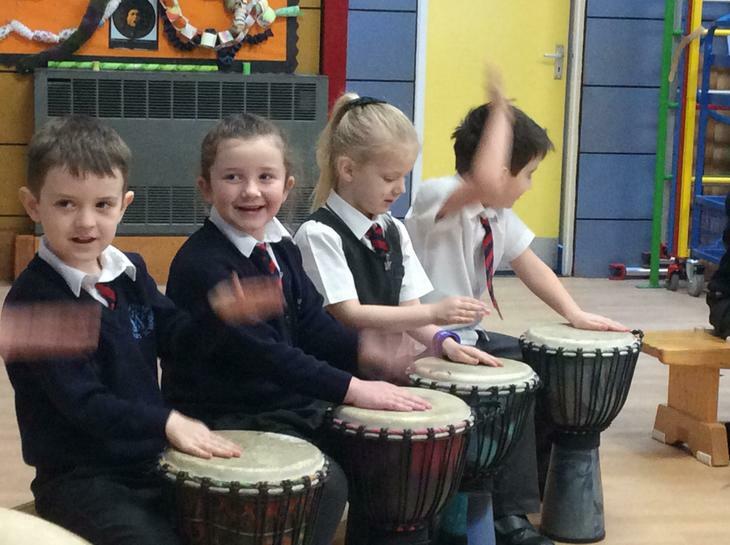 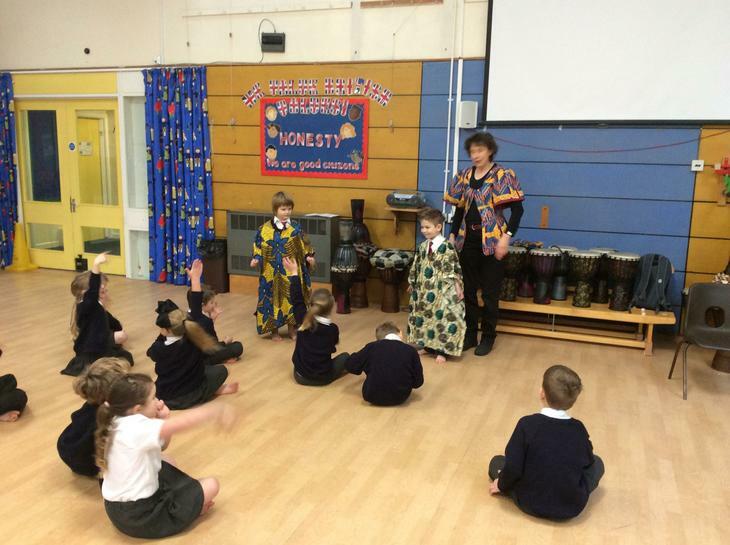 We had so much fun in our African Dance and Drumming Workshop. 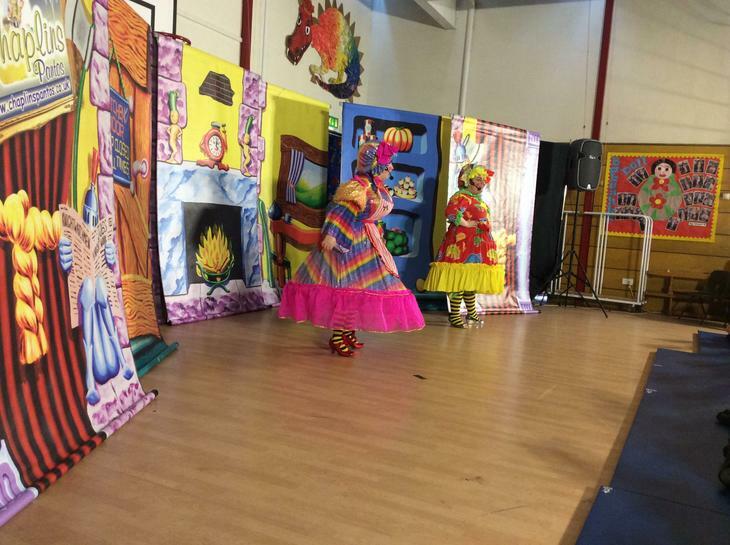 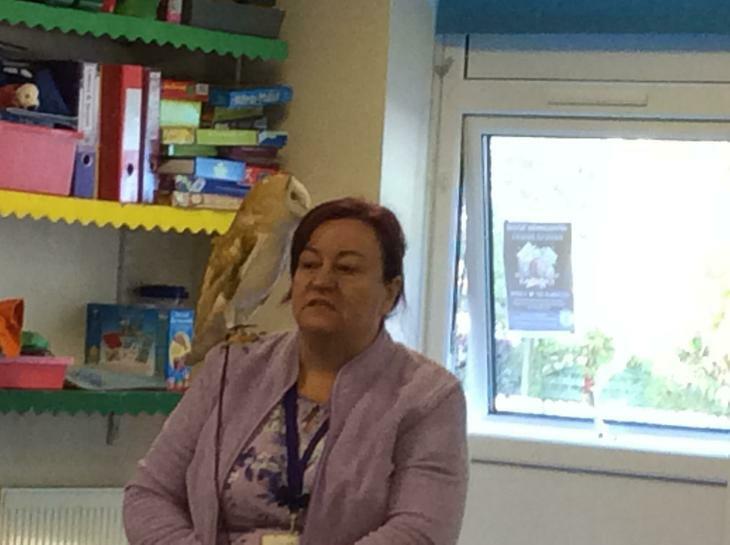 A big thank you to our PTFA for funding this fantastic morning. 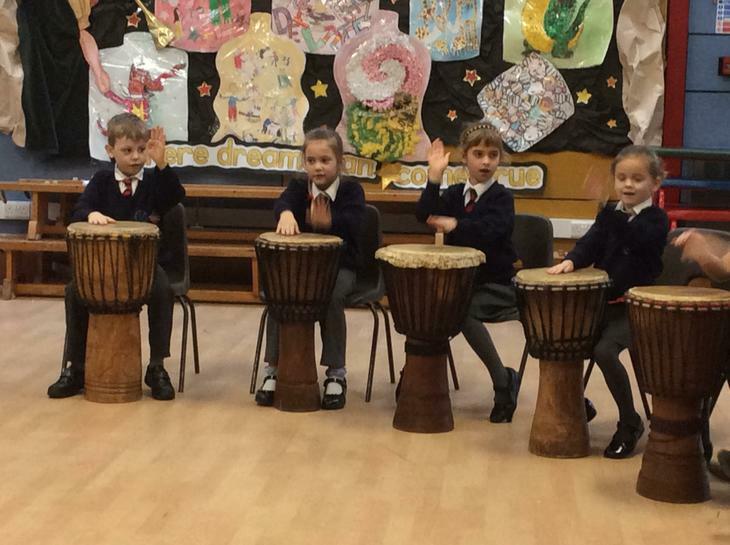 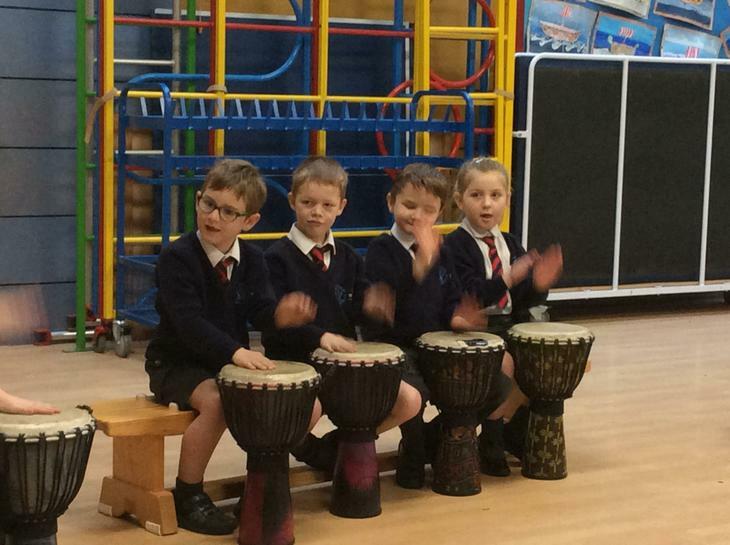 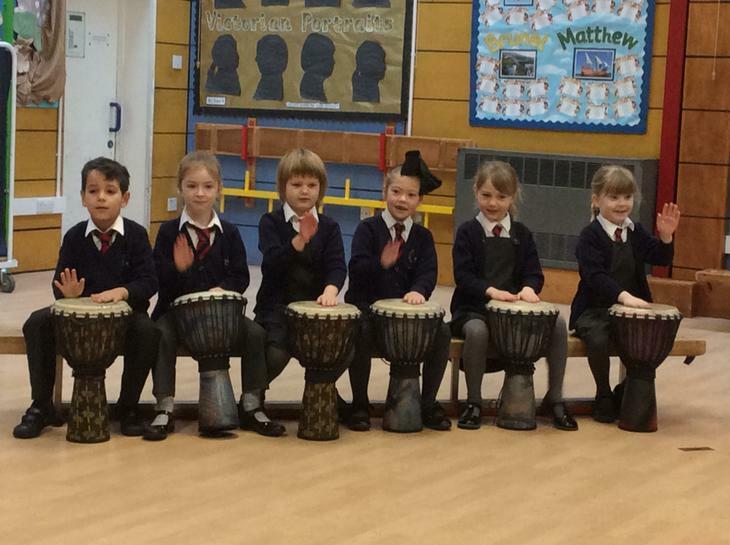 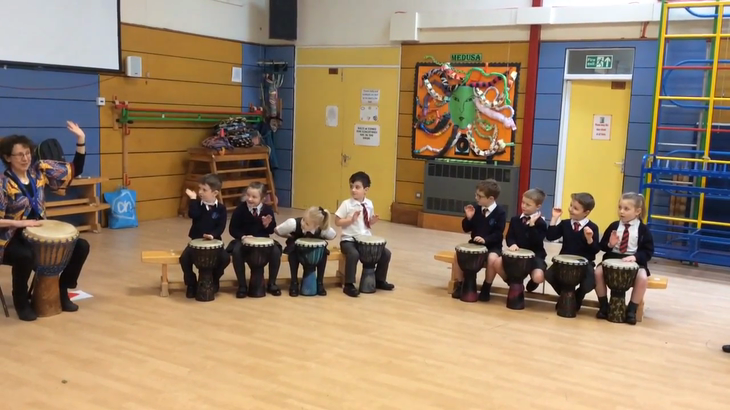 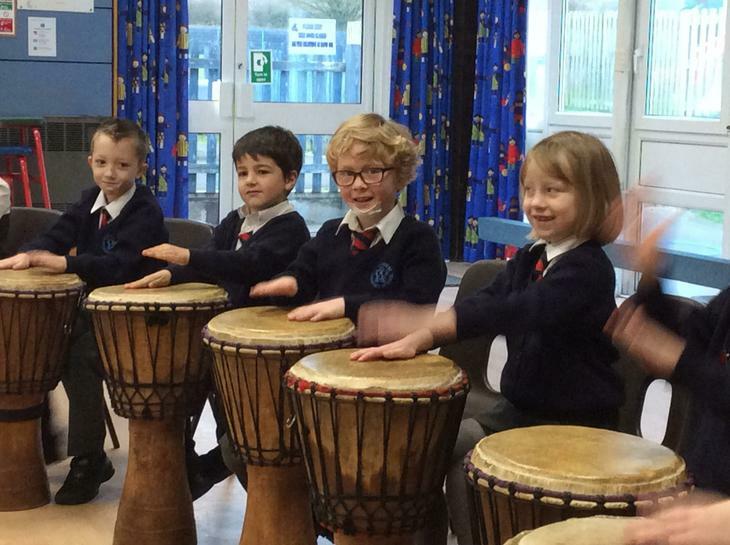 We learnt how traditional African drums are played and enjoyed making lots of noise. 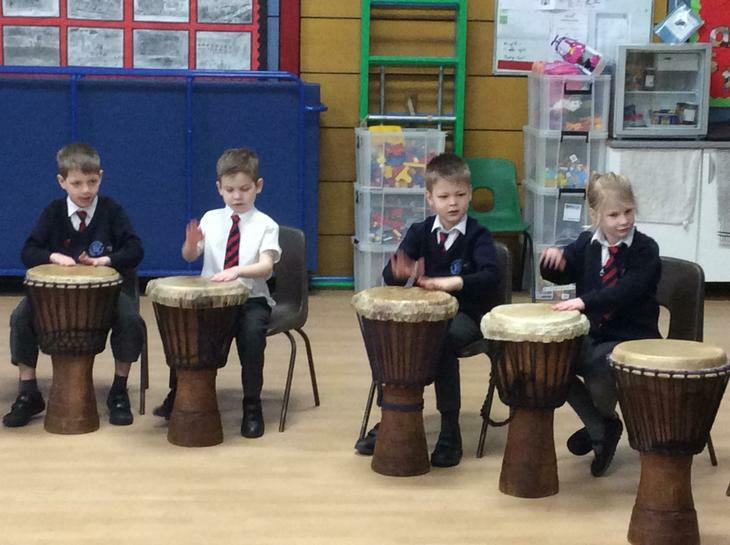 We also learnt how to play the drums quietly! 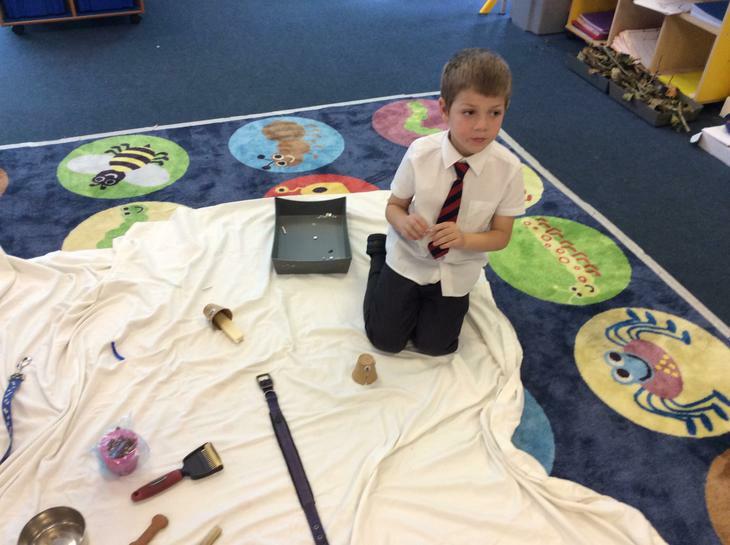 We had to watch the footsteps very carefully. 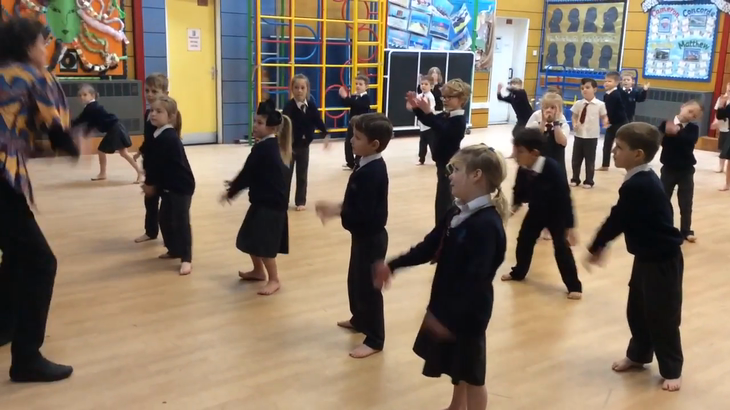 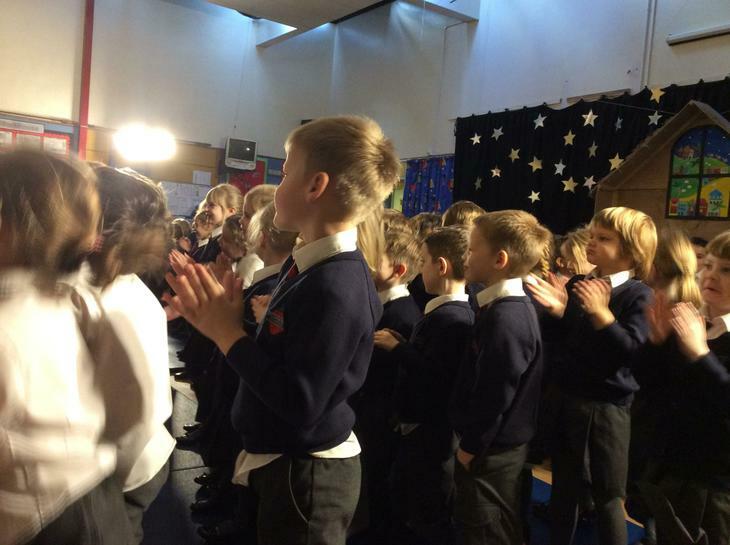 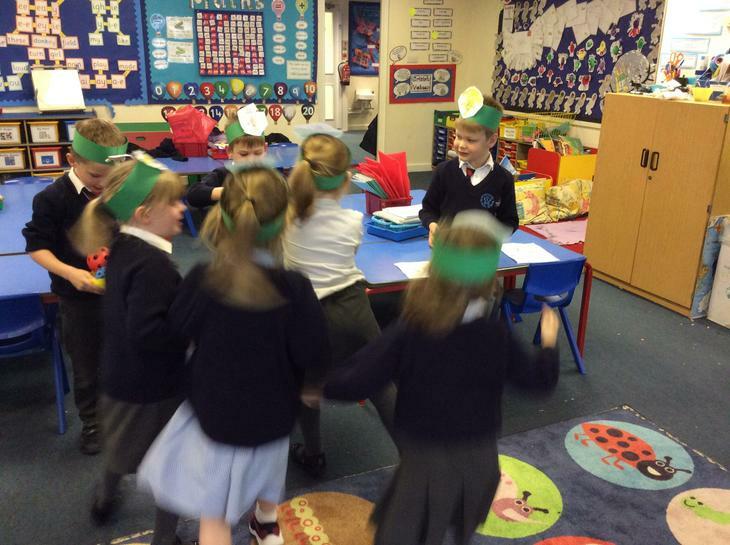 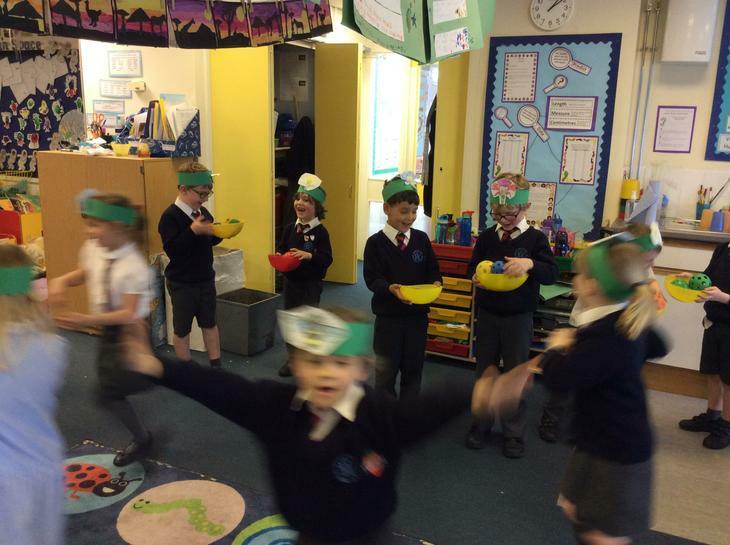 We created a dance to tell the story of planting crops. 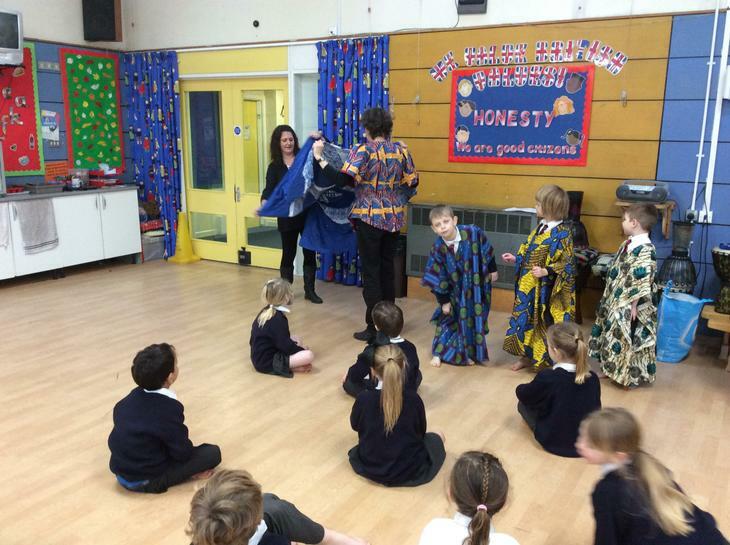 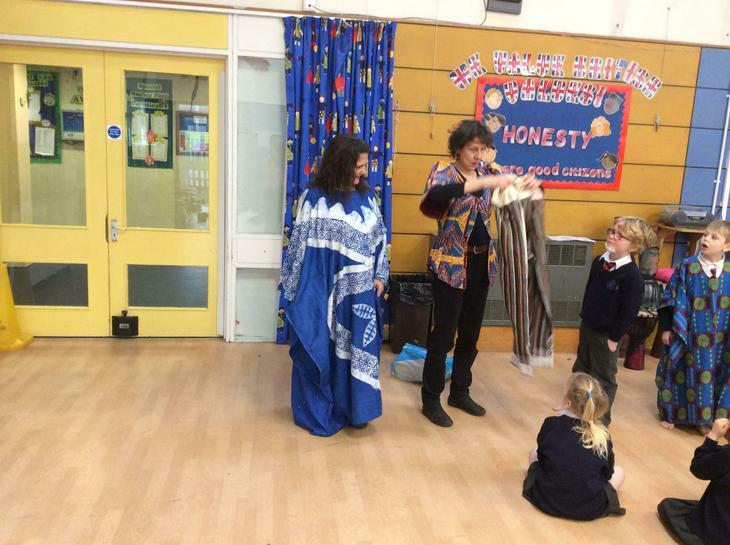 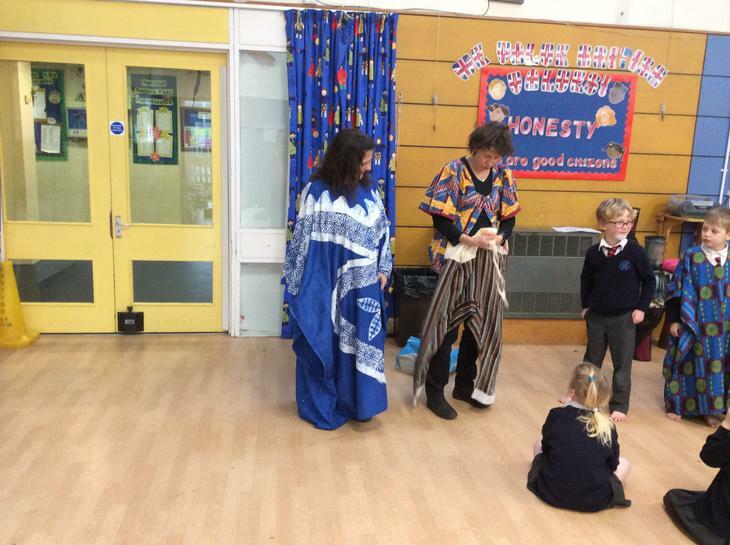 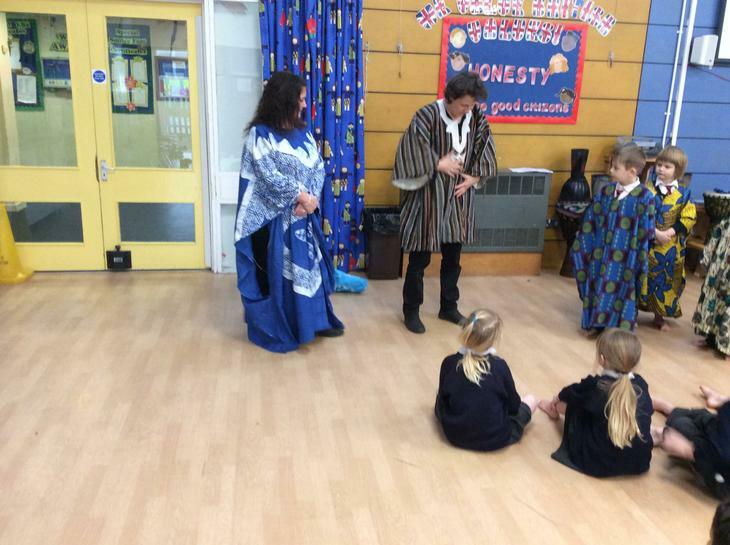 Finally, we had fun dressing up in some traditional African clothes. 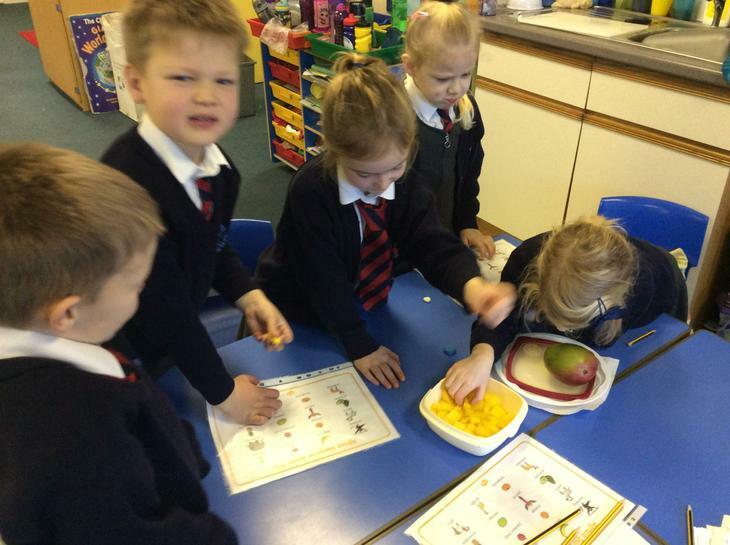 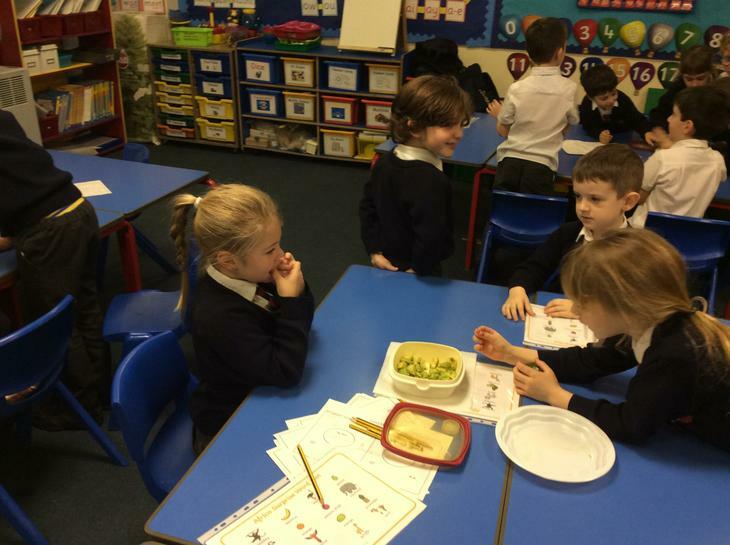 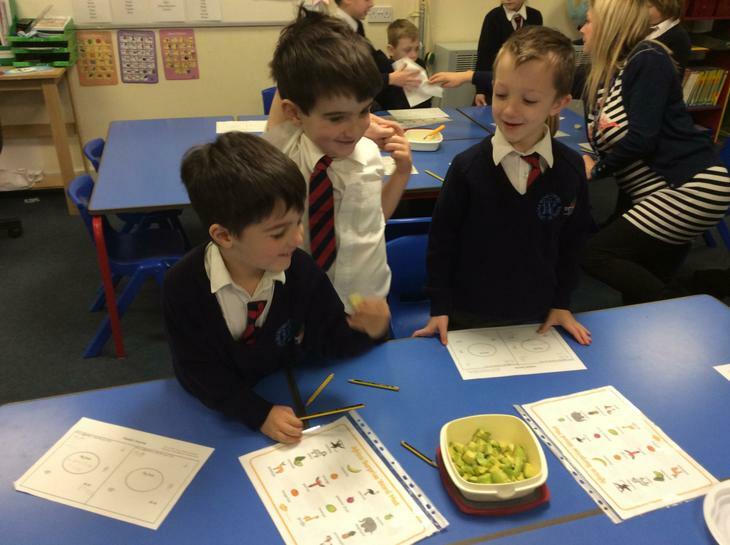 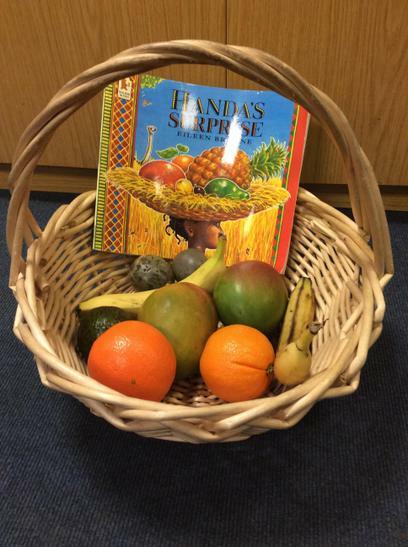 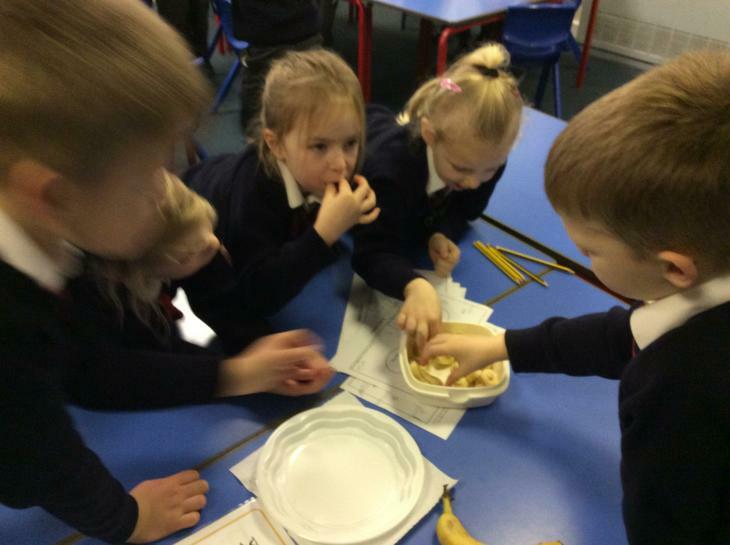 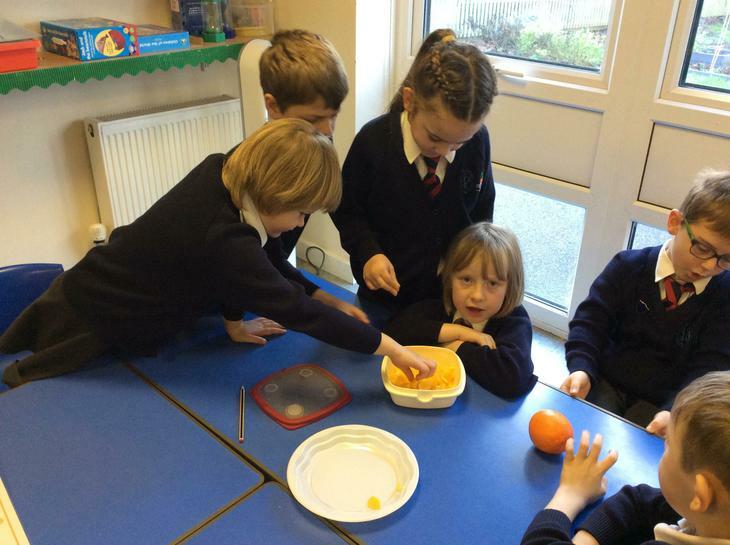 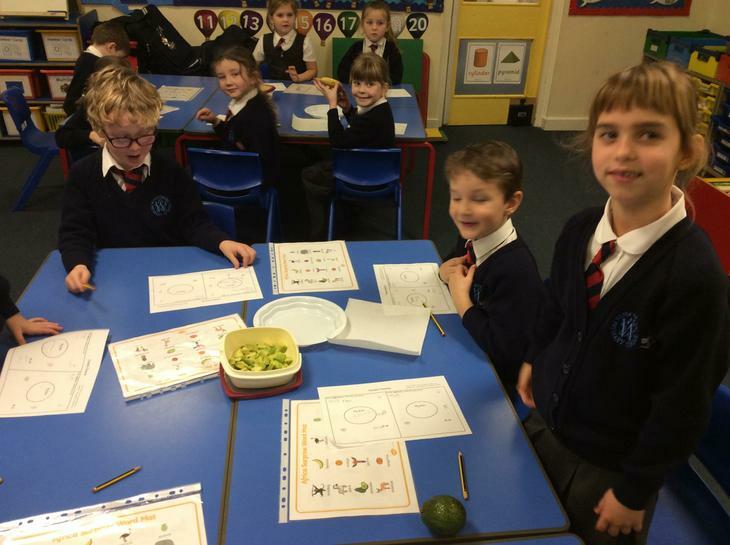 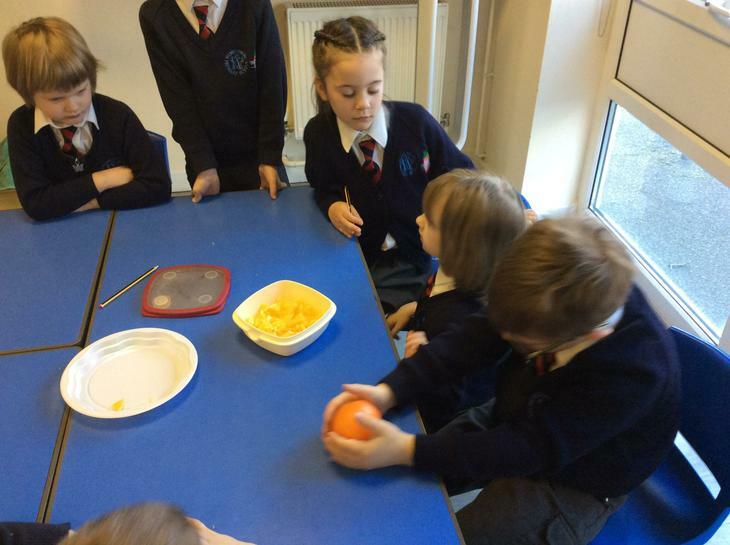 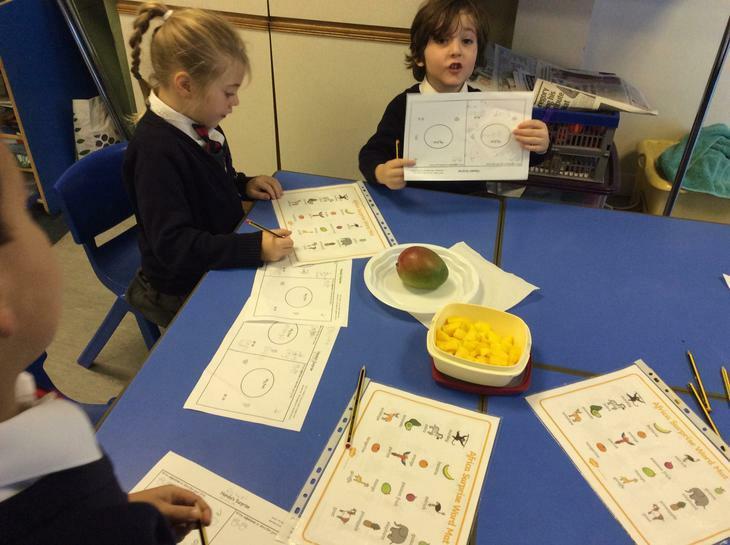 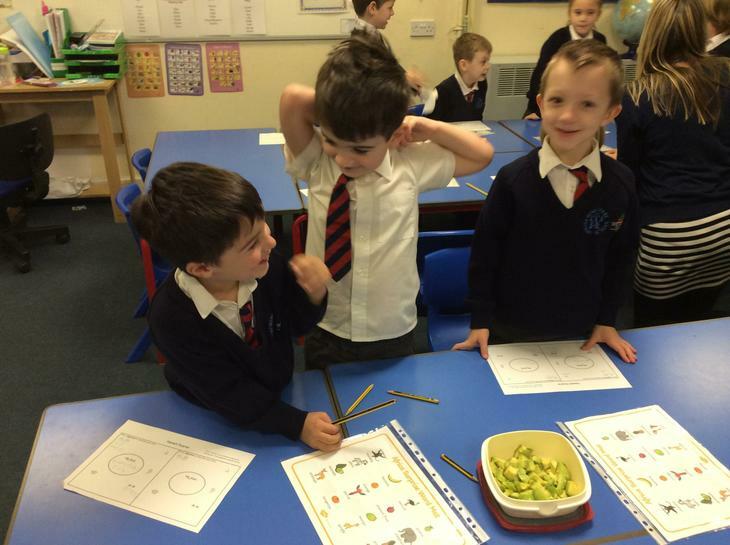 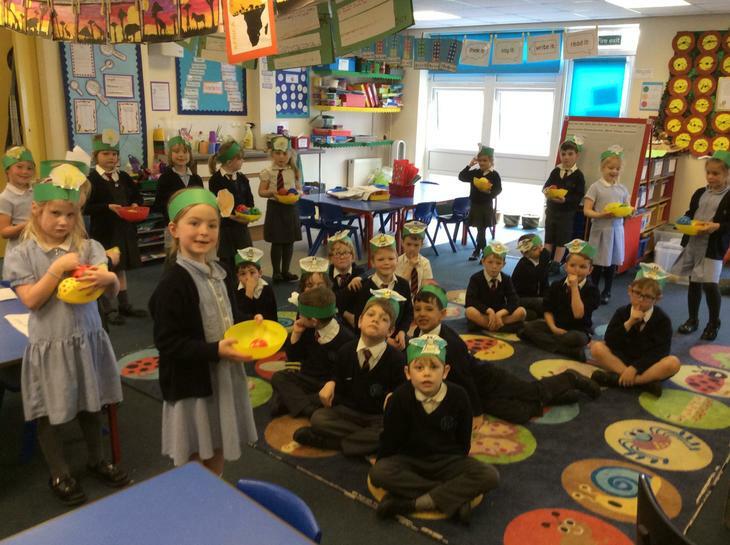 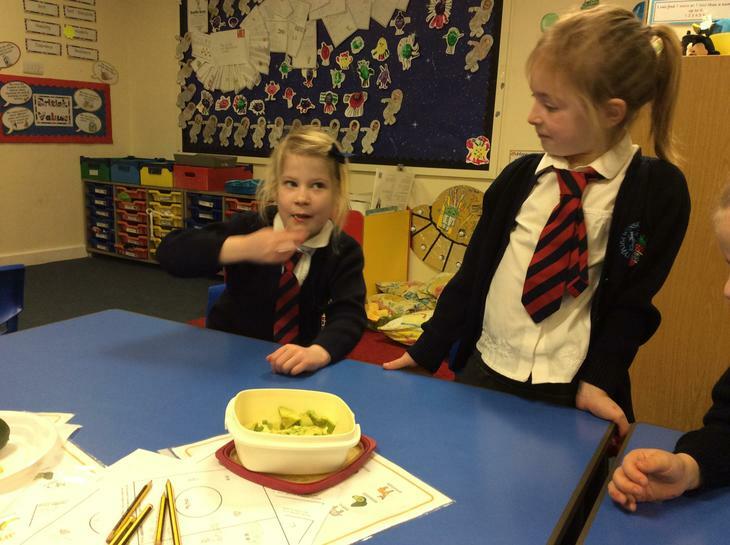 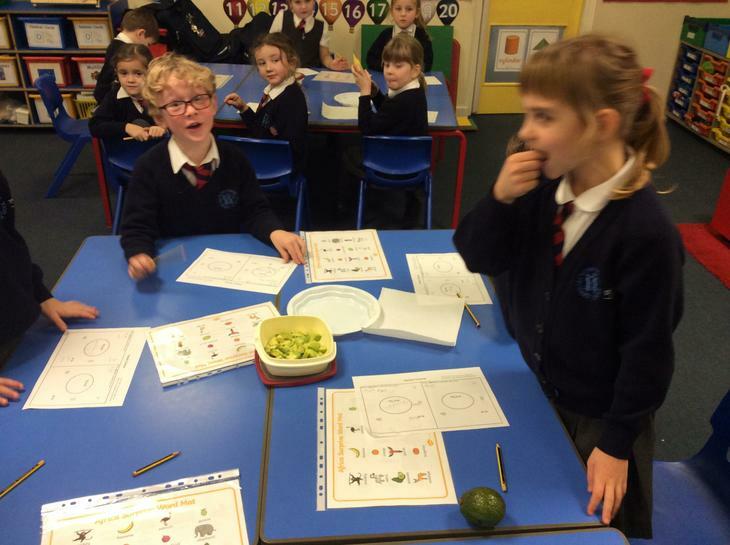 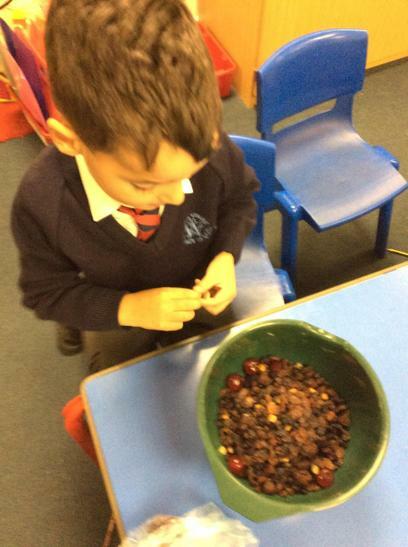 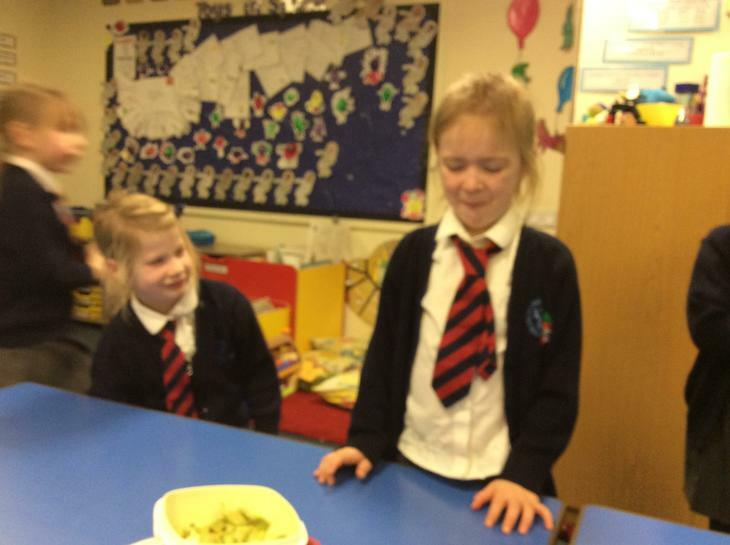 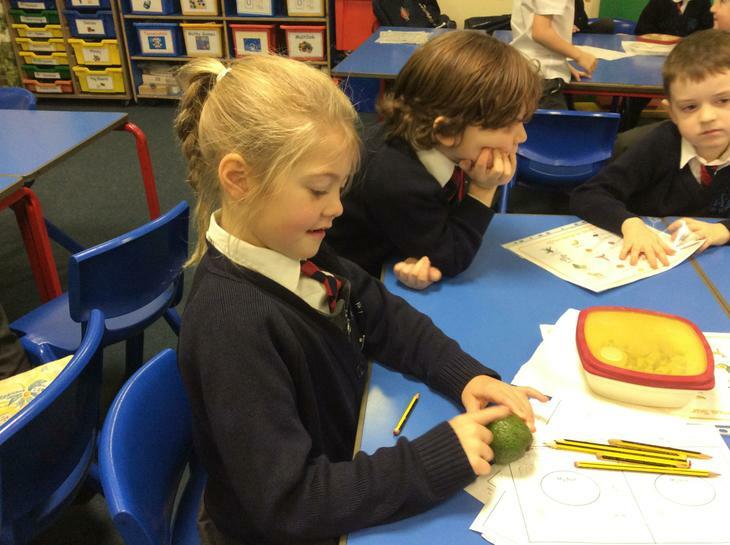 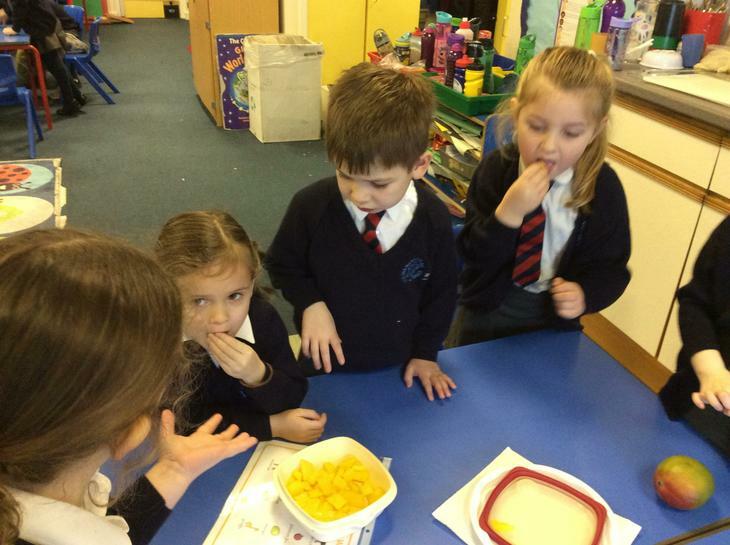 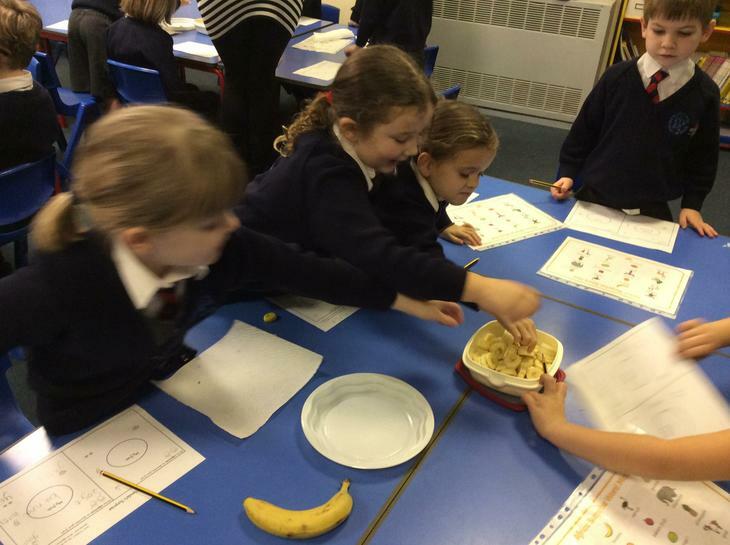 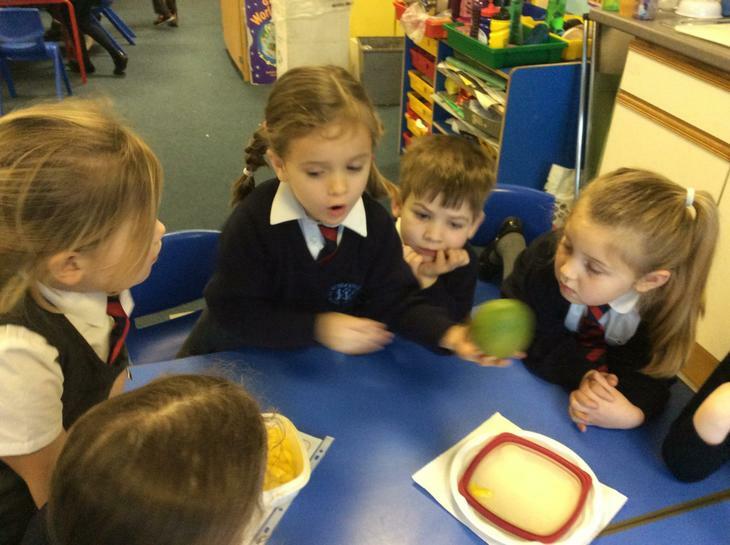 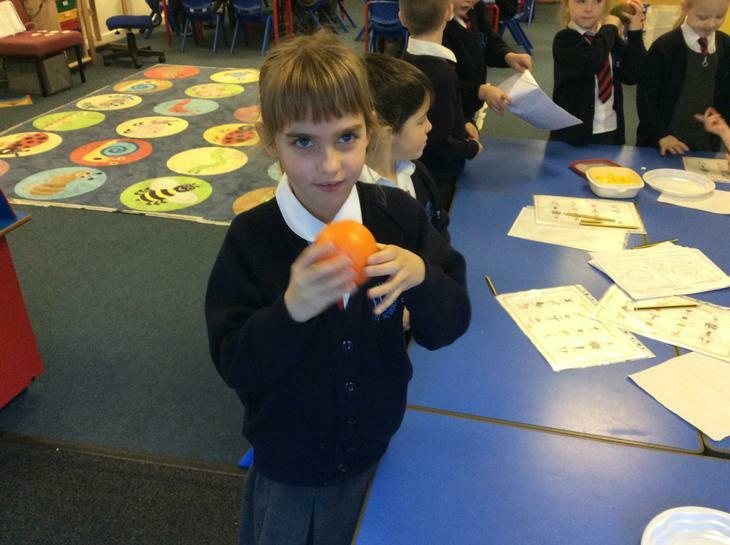 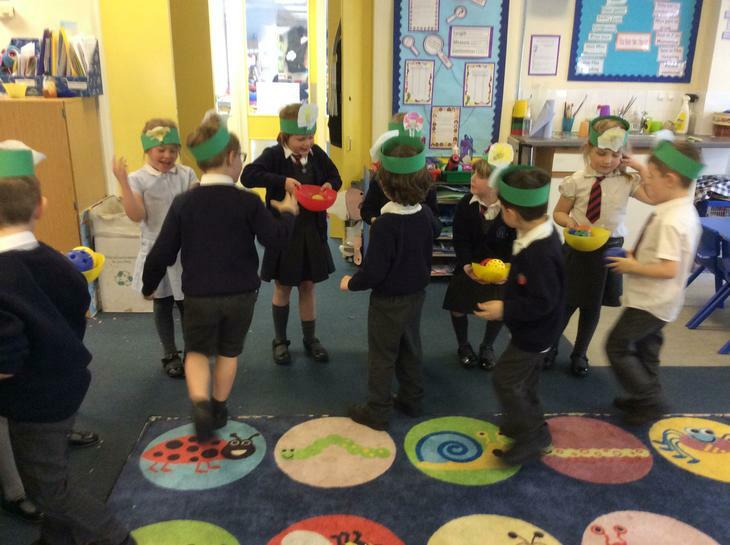 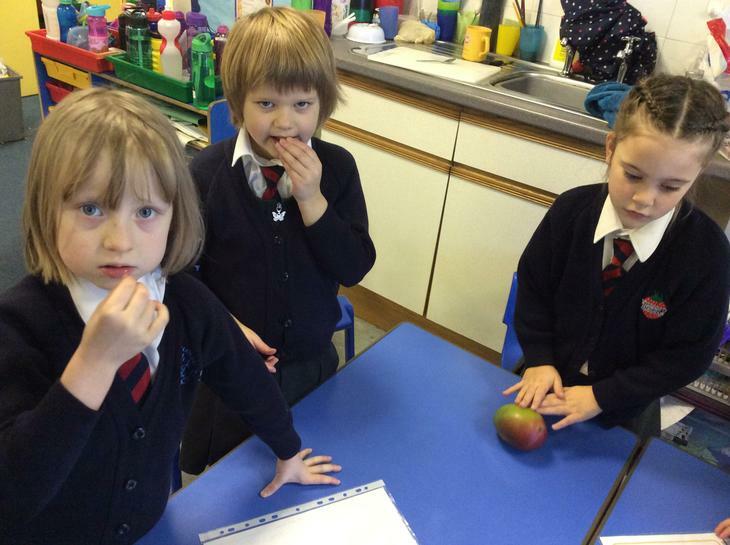 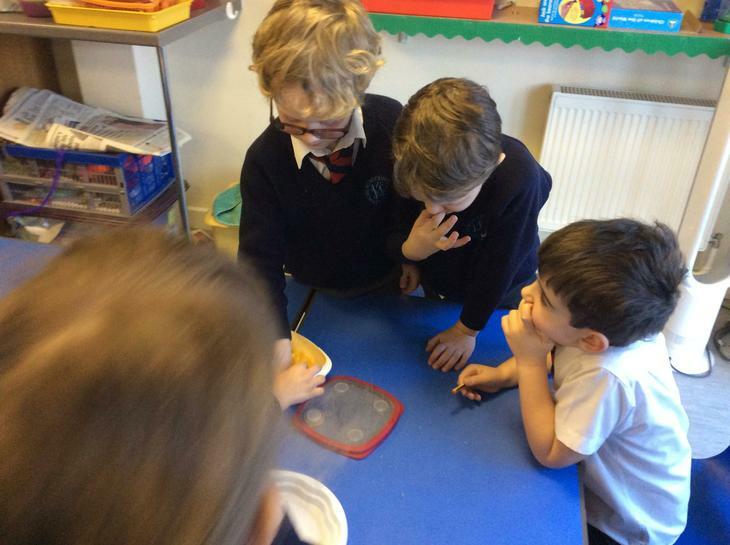 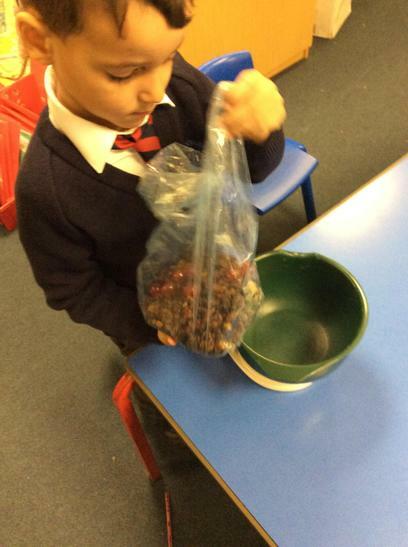 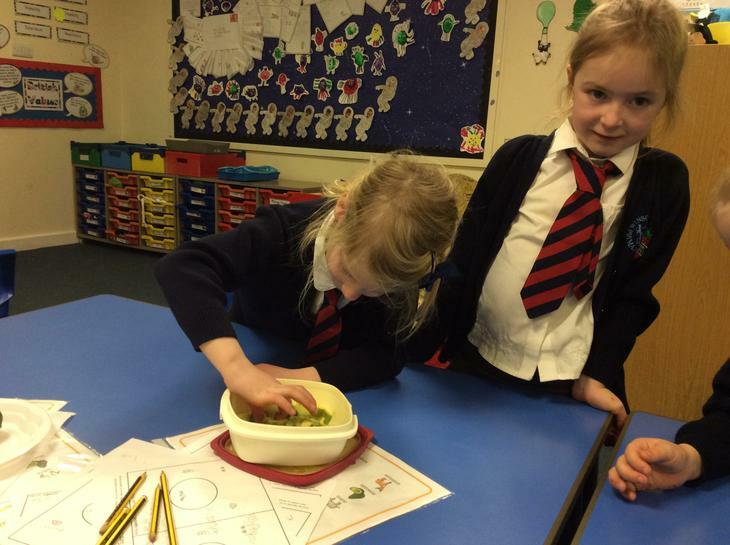 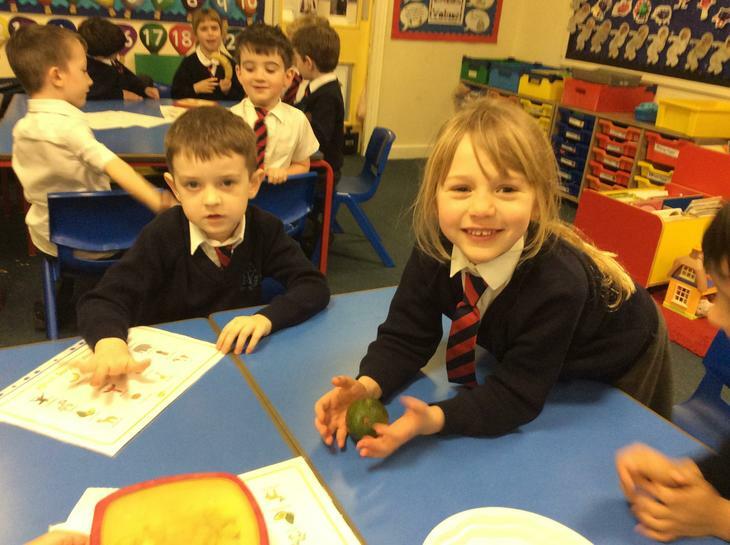 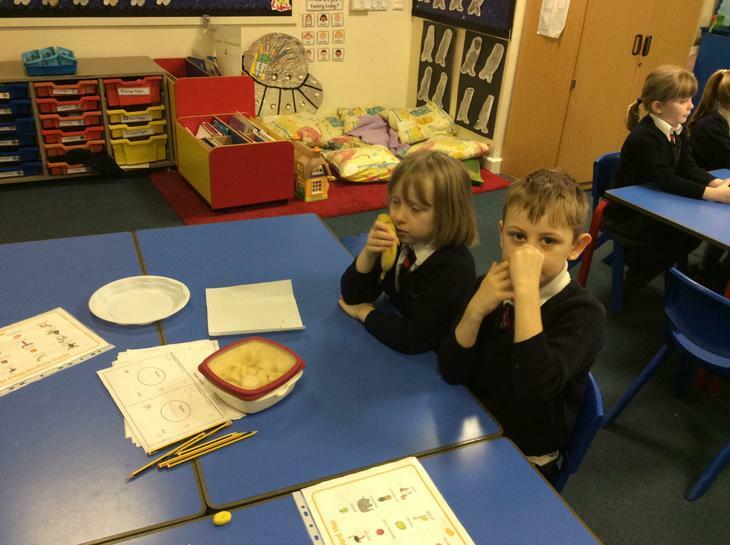 We have been using our senses to explore the different fruits in the story of 'Handa's Surprise'. 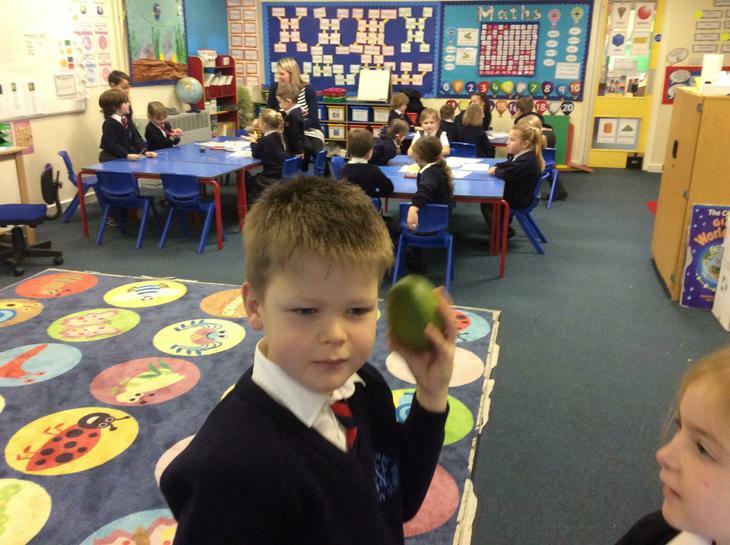 Our favourite fruit was the mango. 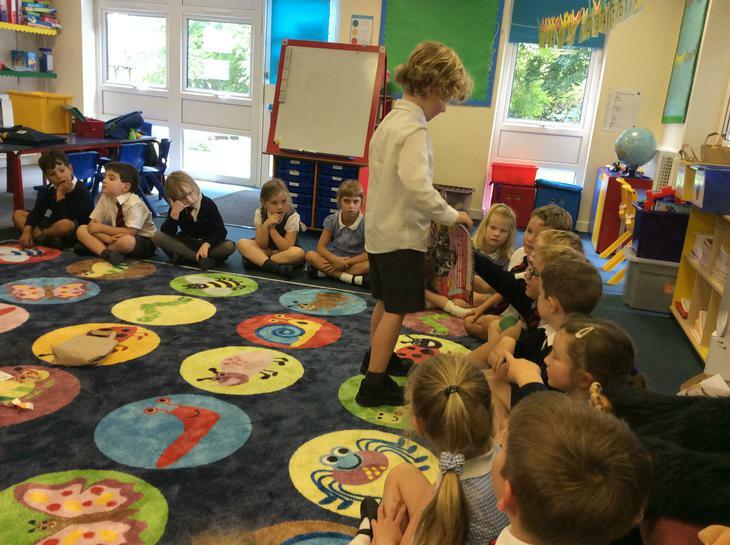 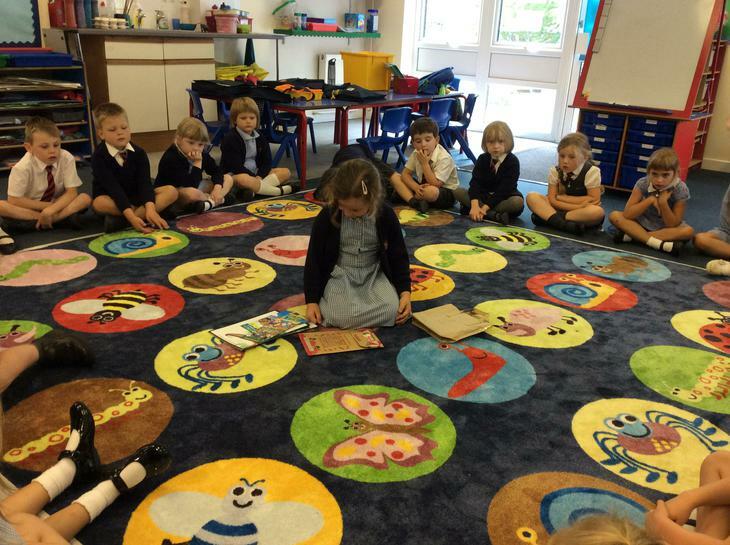 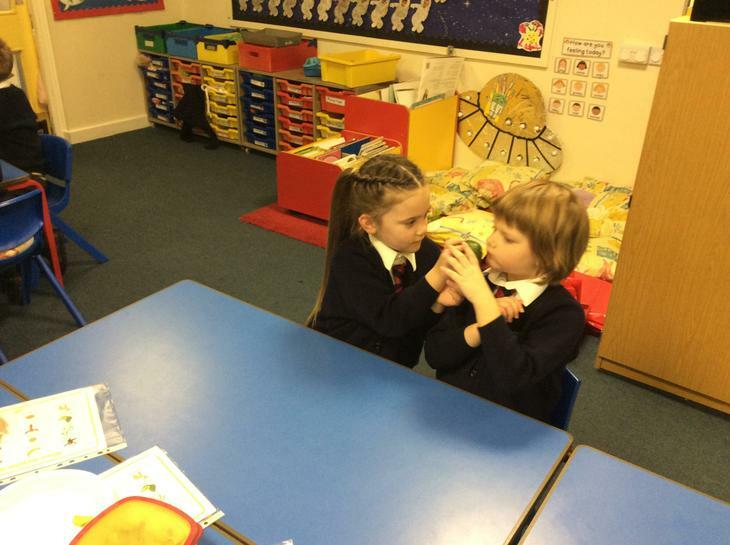 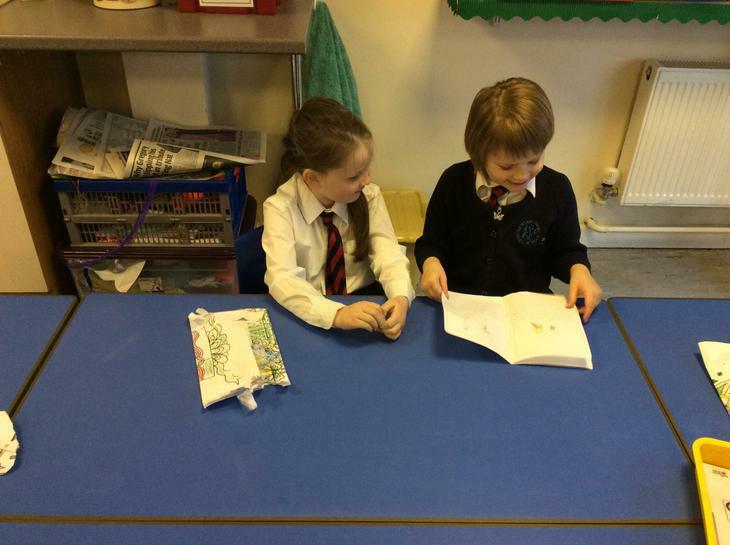 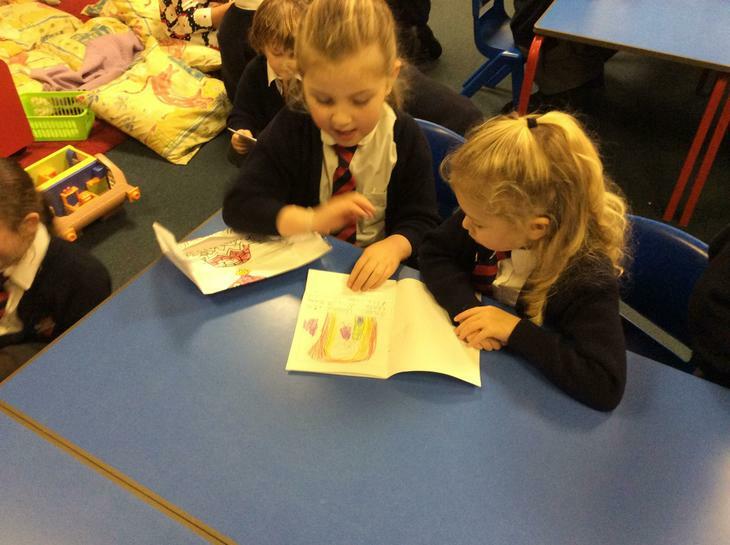 We really enjoyed sharing our fairy stories with Red Class. 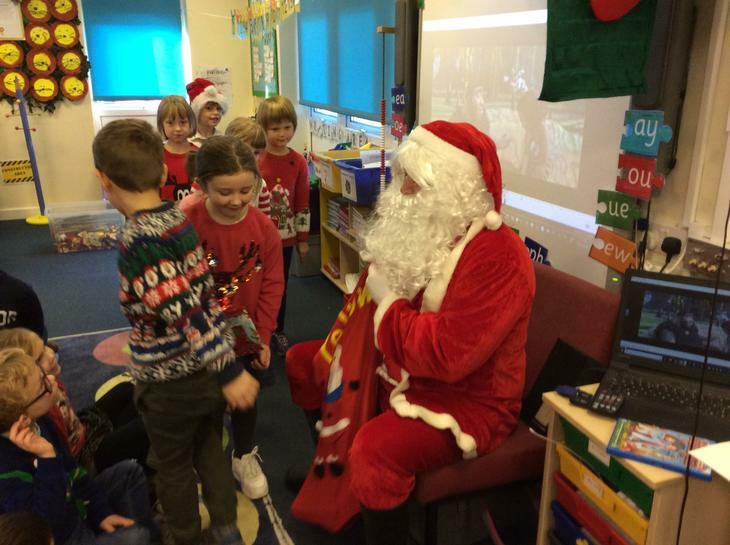 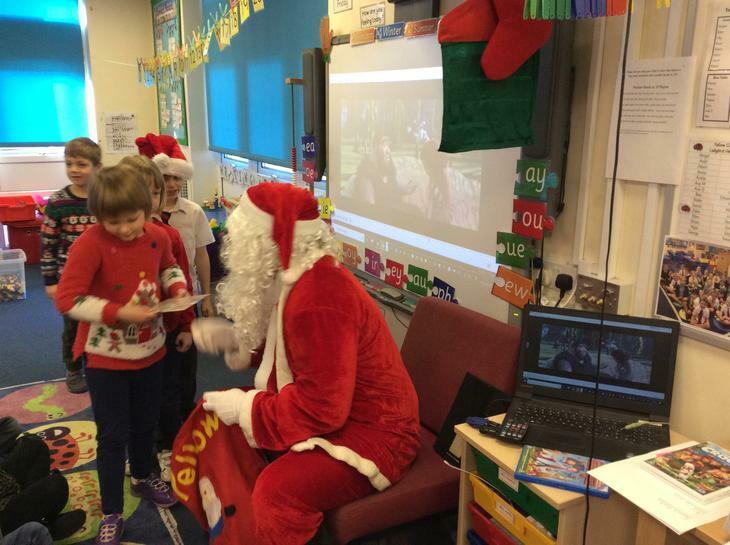 We have had a very special visitor in Yellow Class. 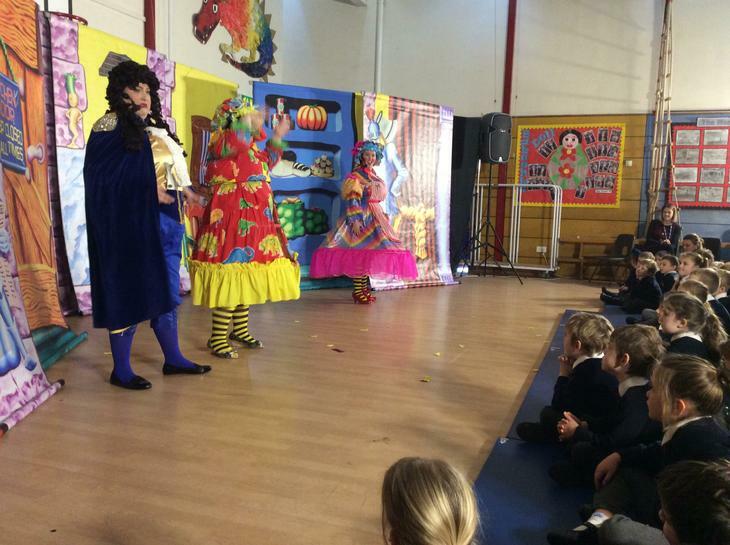 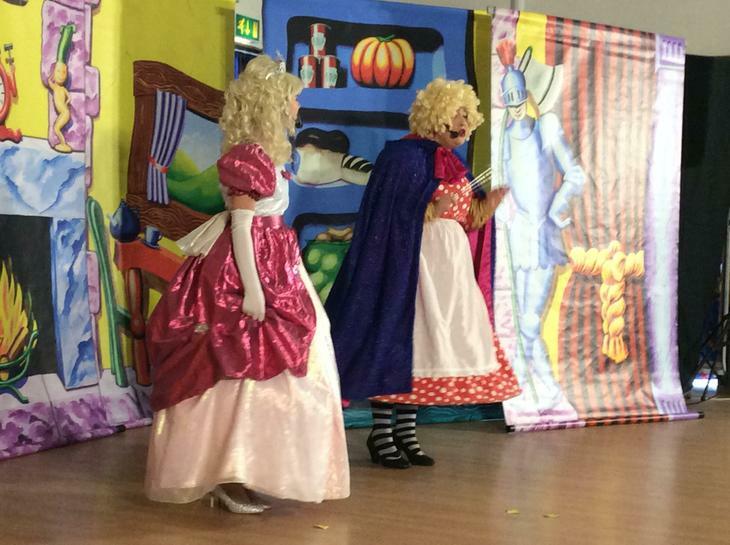 We loved the Pantomine - Cinderella. 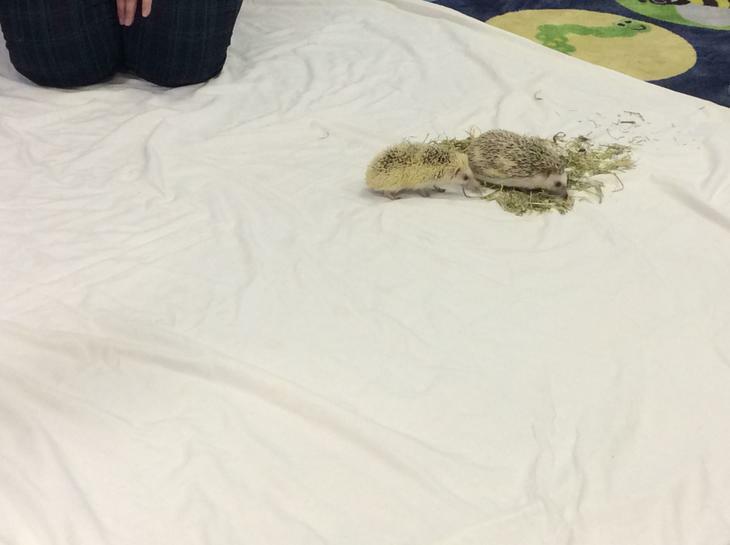 It was very funny. 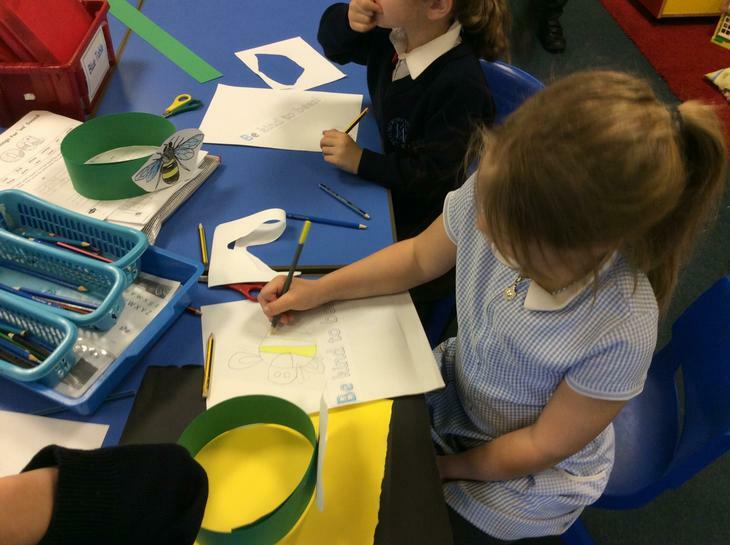 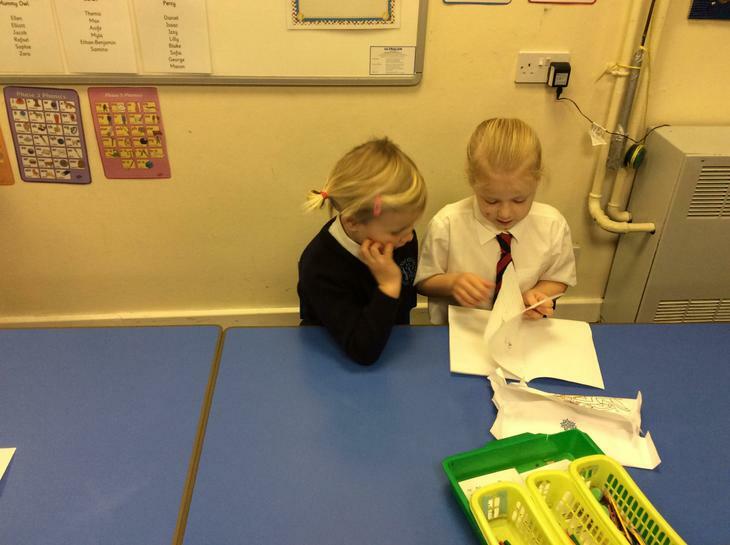 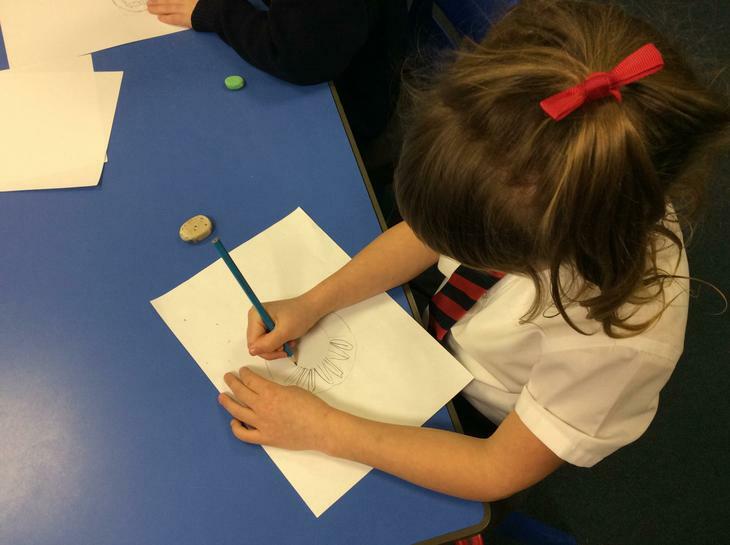 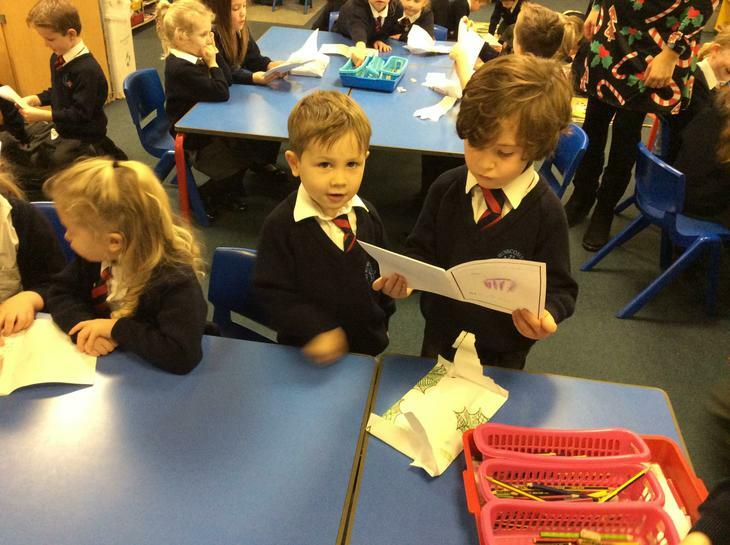 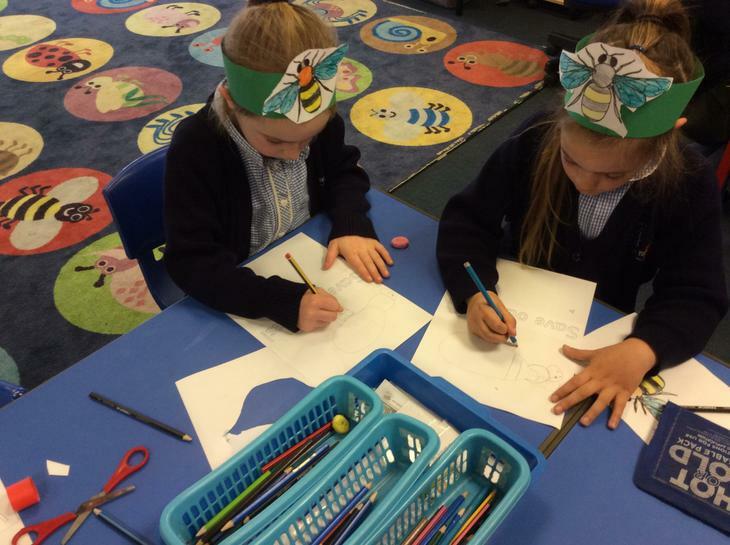 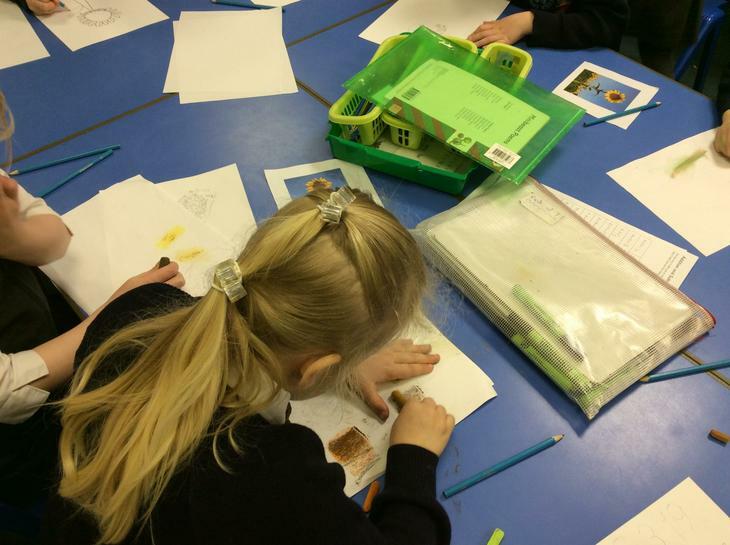 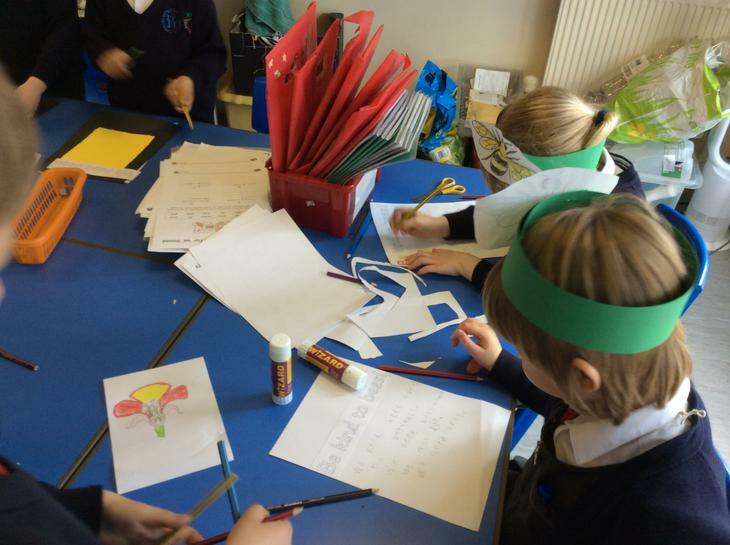 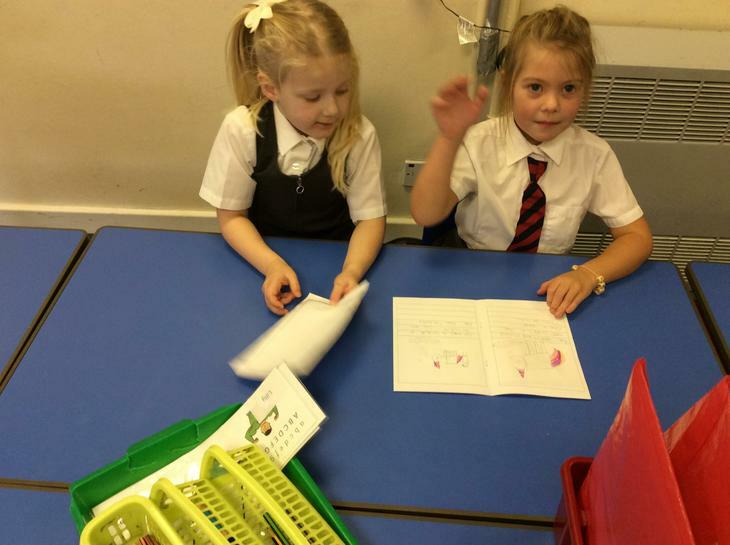 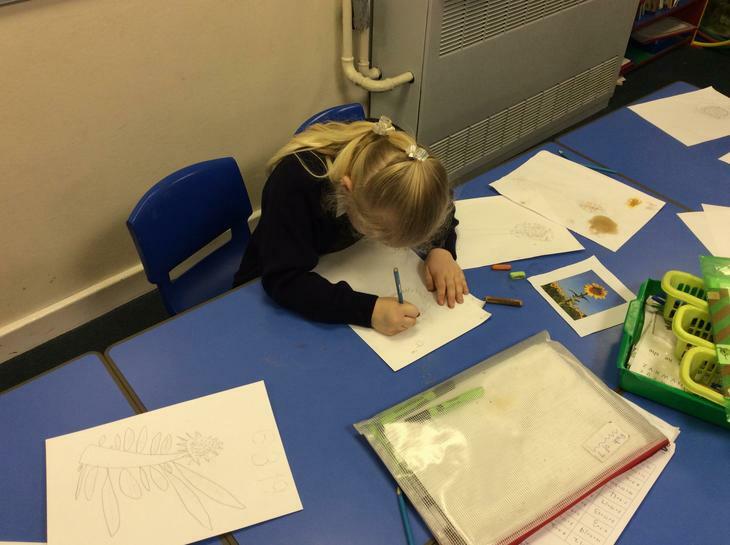 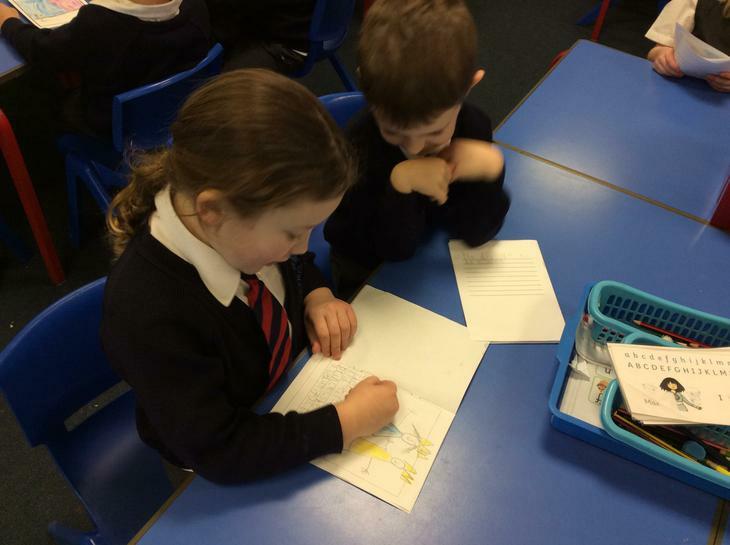 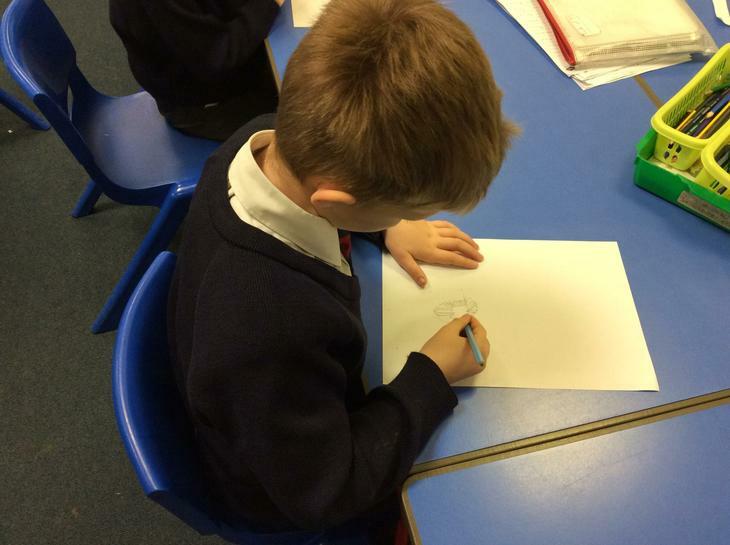 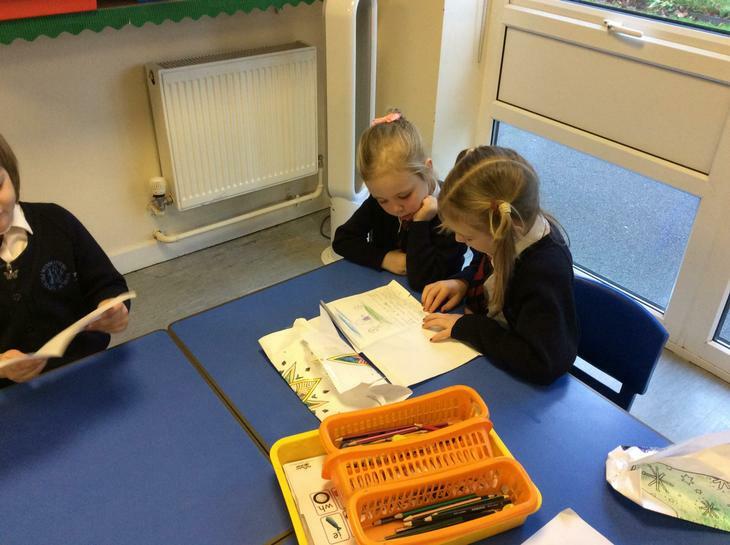 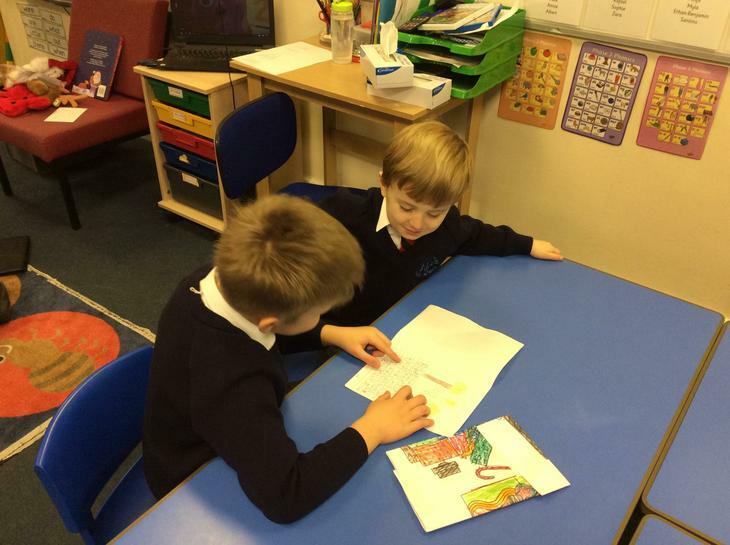 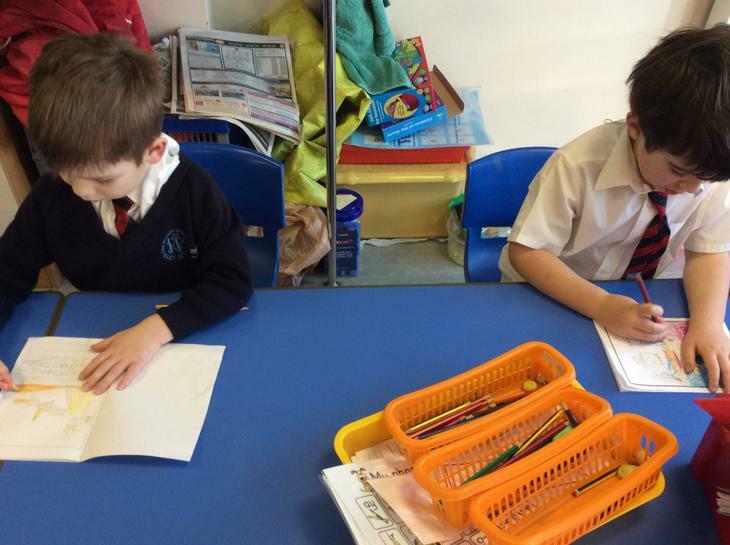 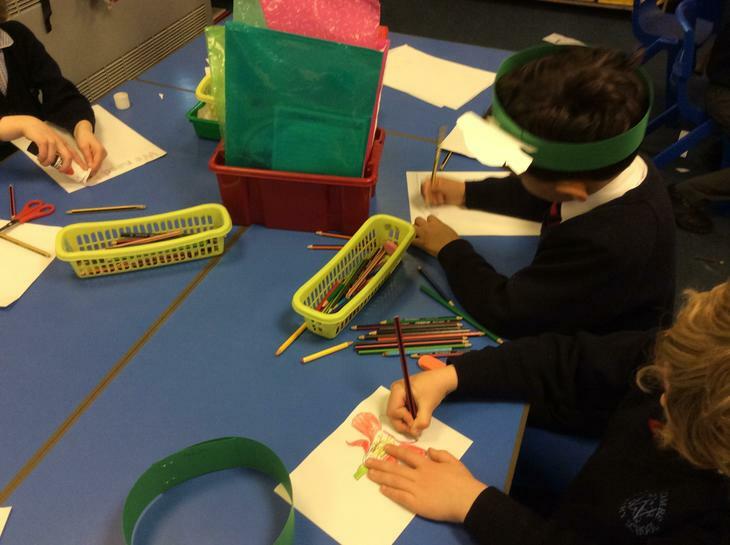 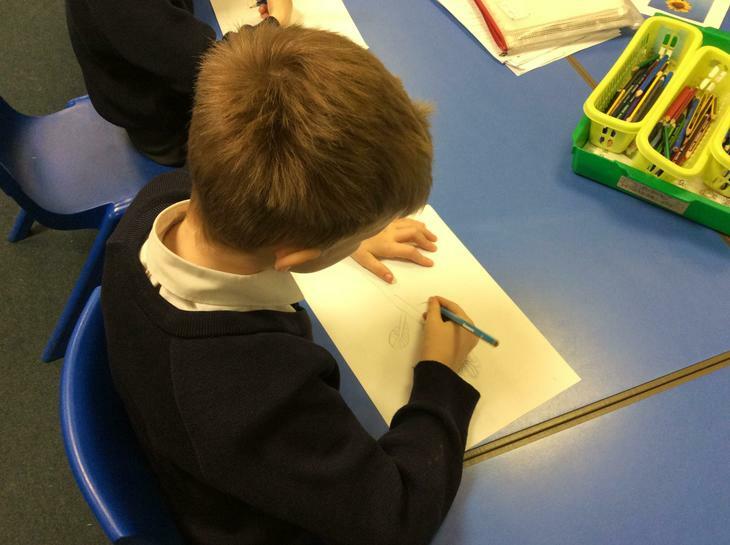 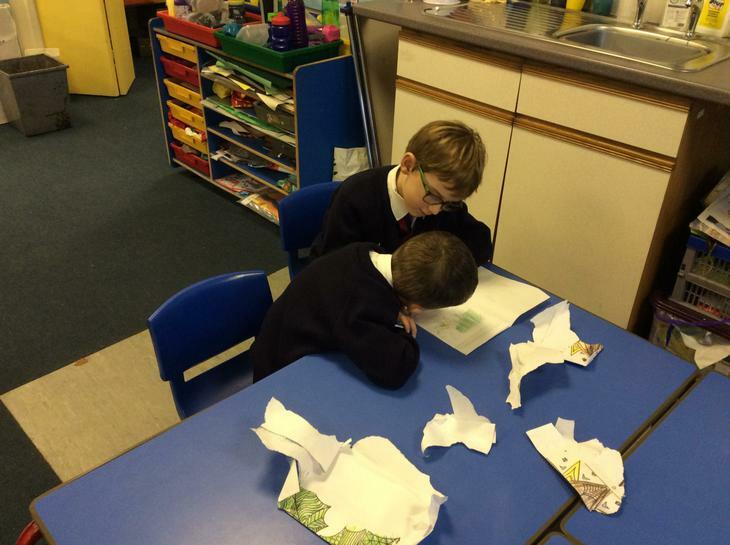 We have written and illustrated our own fairy tale books. 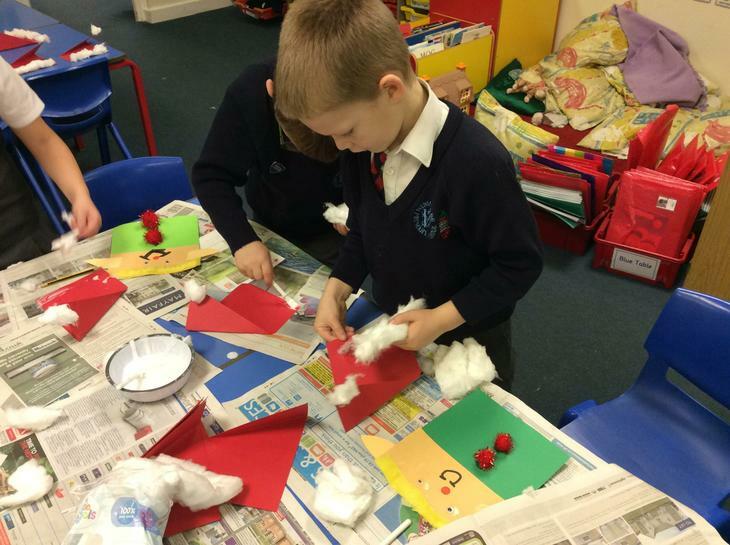 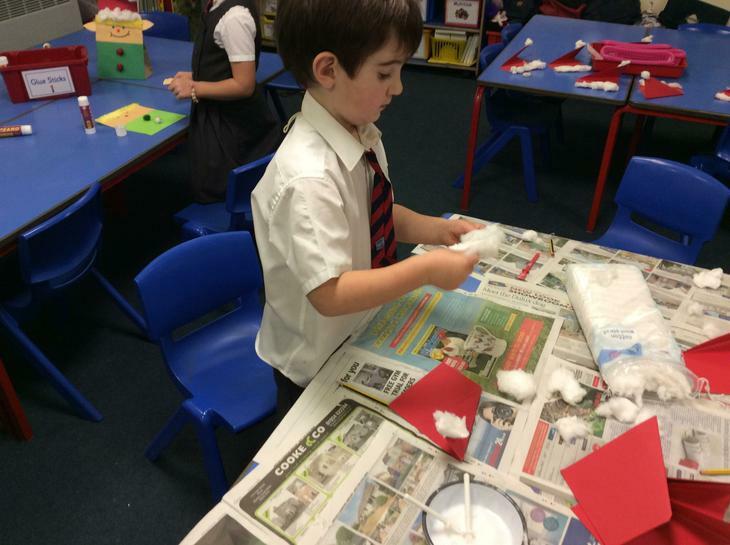 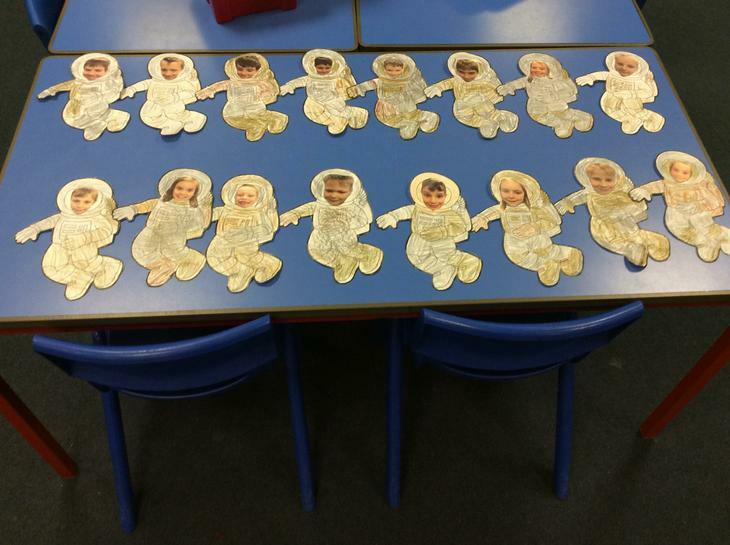 We have been making elves and angels ready for Christmas. 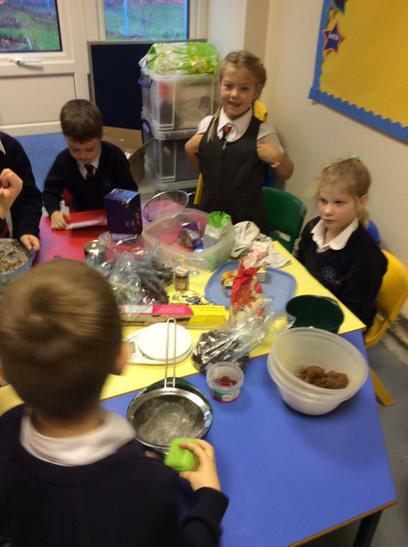 Our Christmas preparations have begun with some baking. 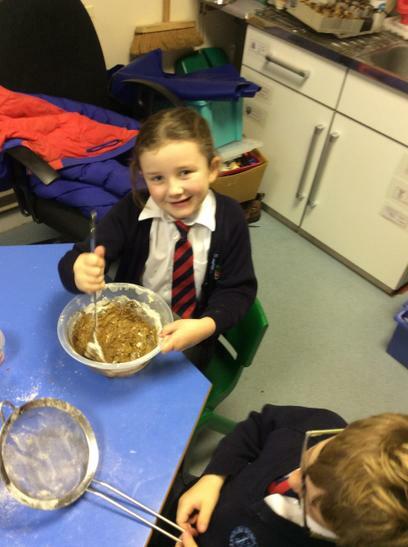 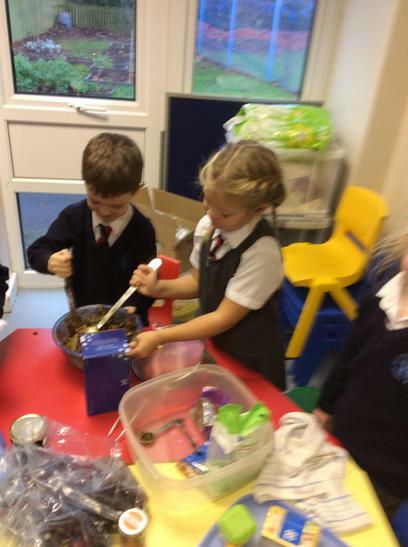 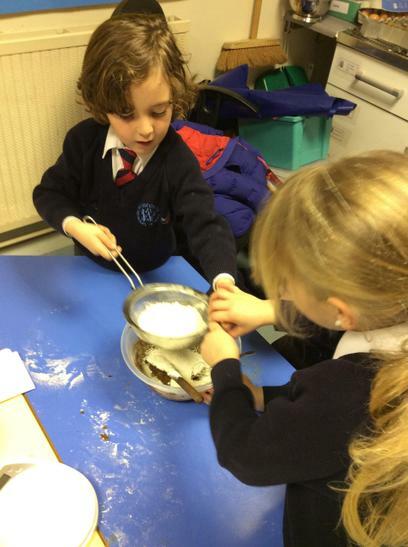 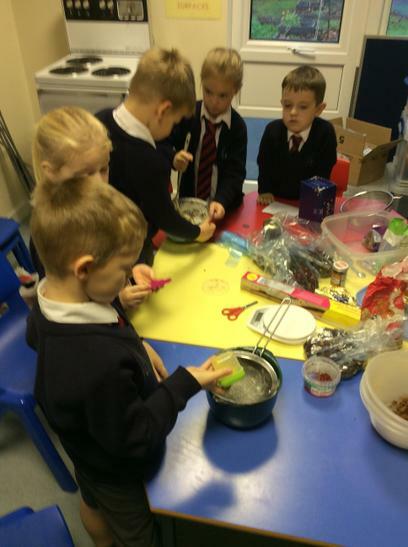 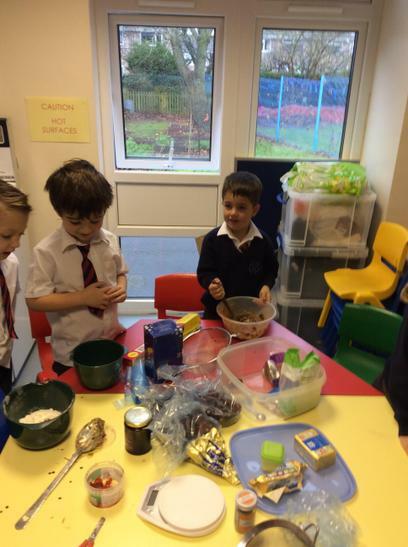 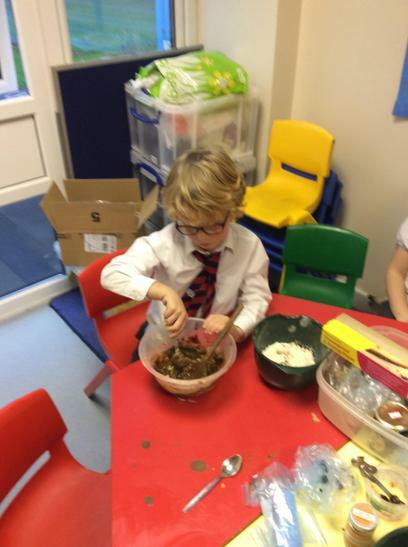 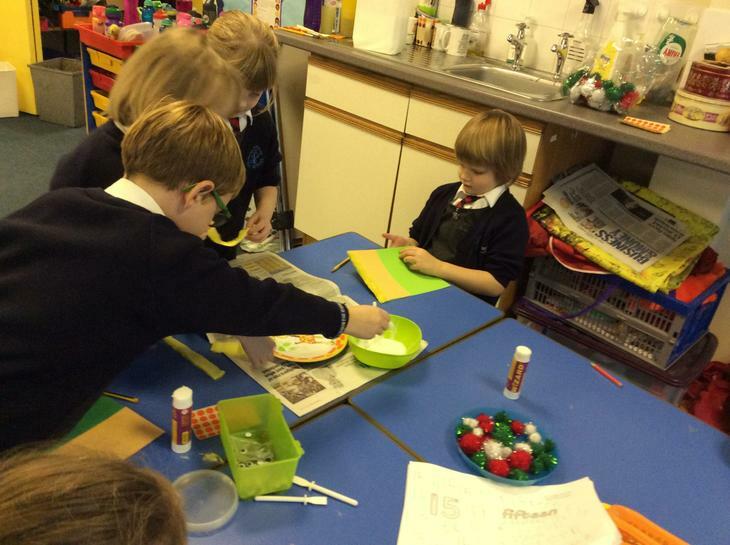 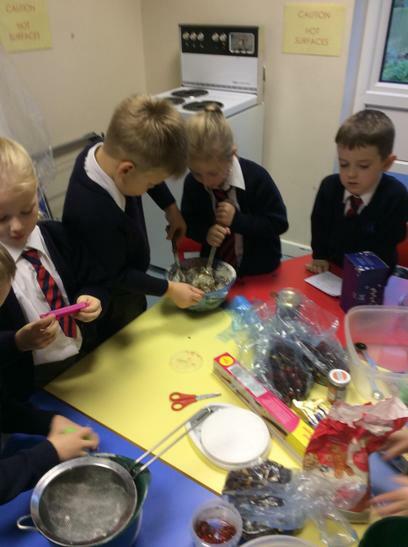 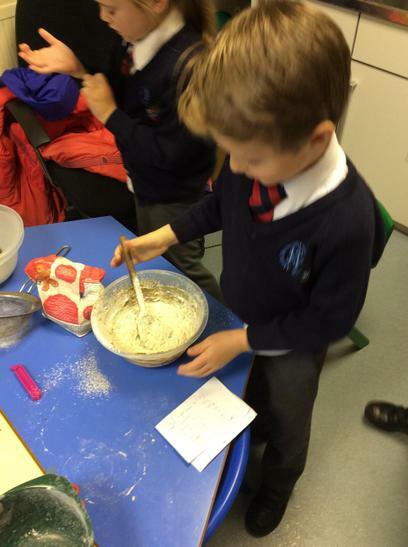 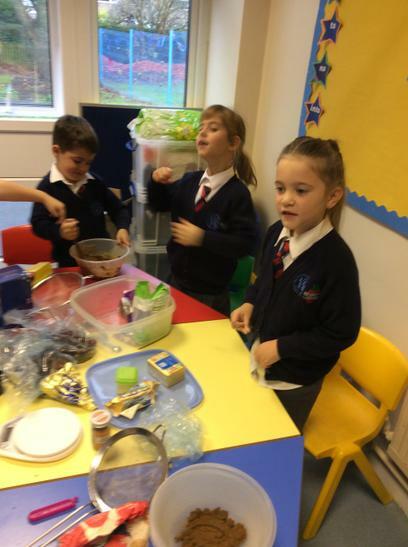 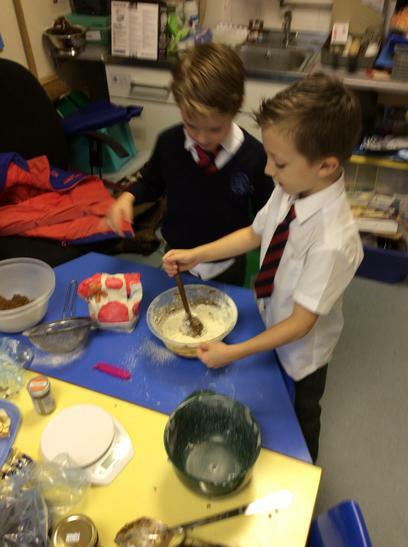 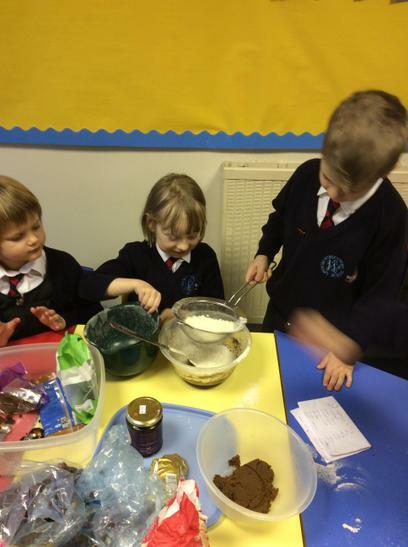 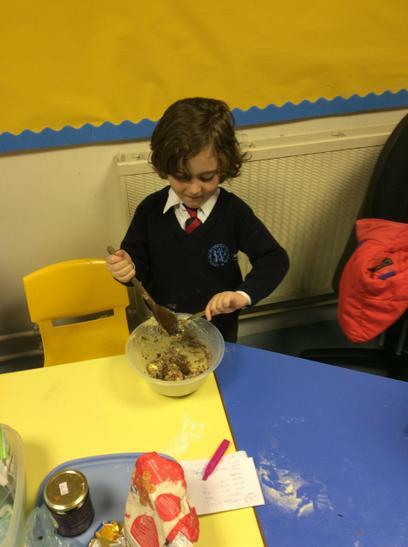 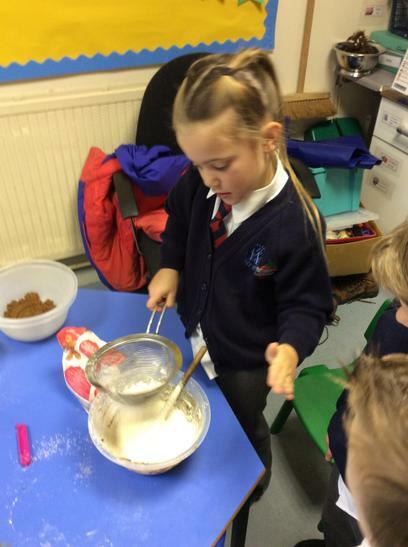 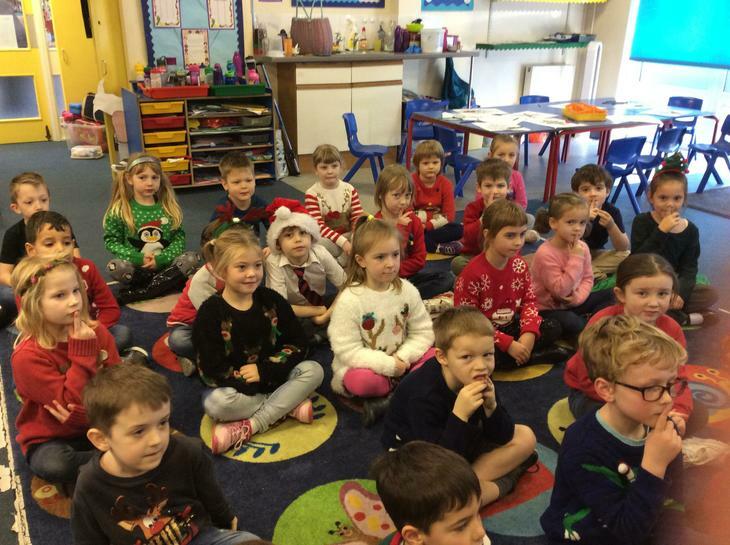 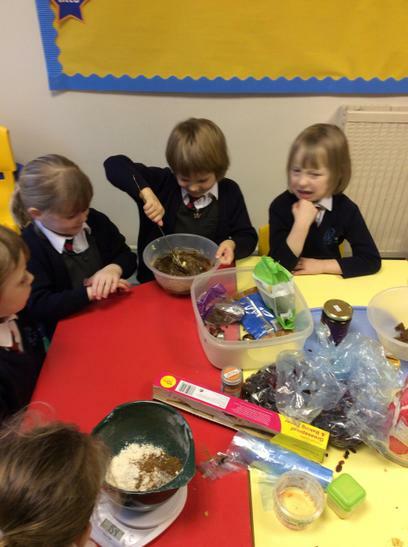 A big thank you to Mrs McCarthy for helping us to make our own Christmas cakes. 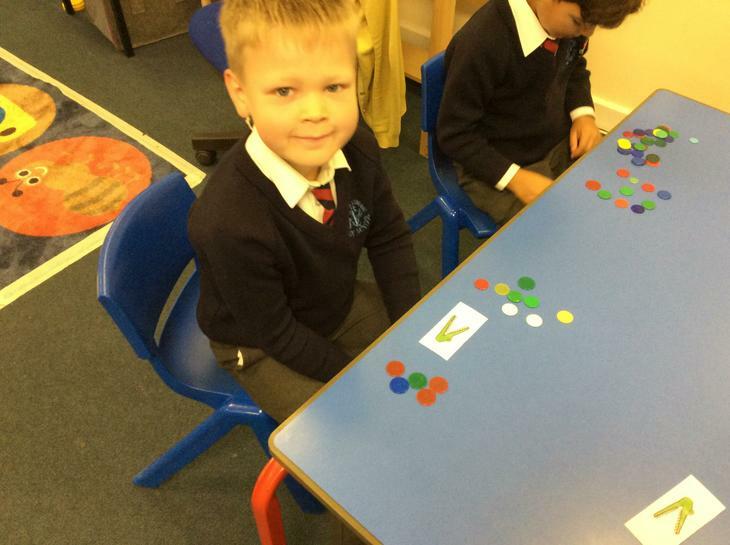 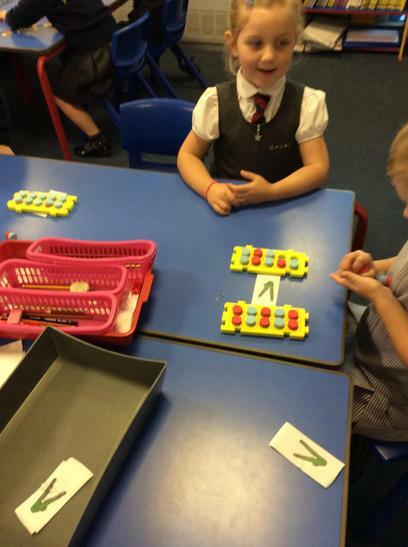 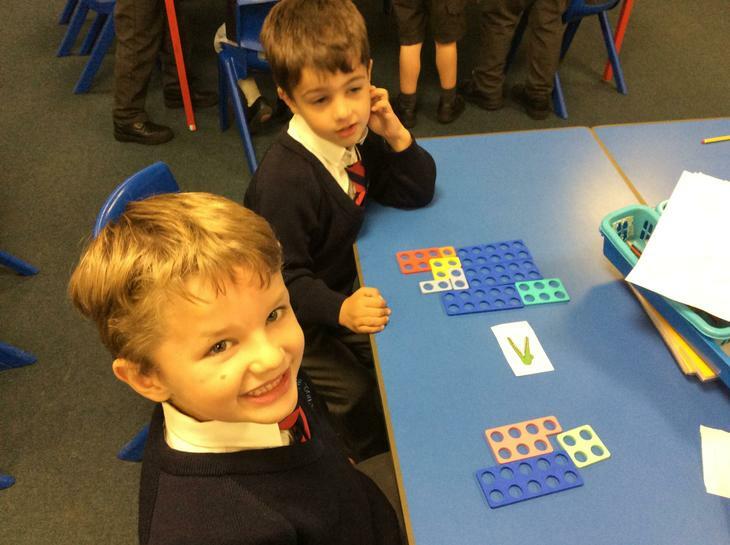 In Mathmatics we have been learning about place value. 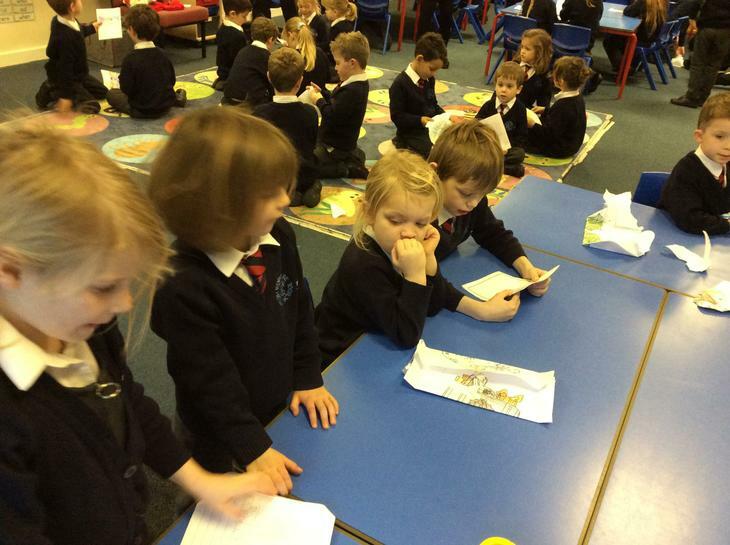 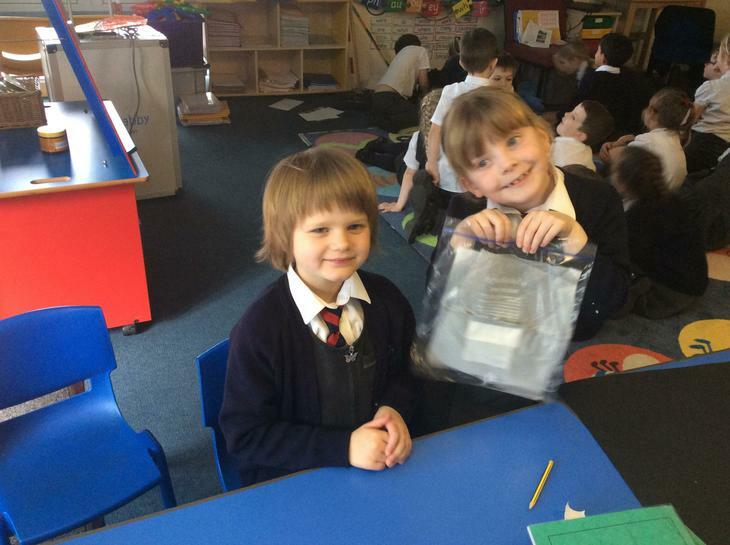 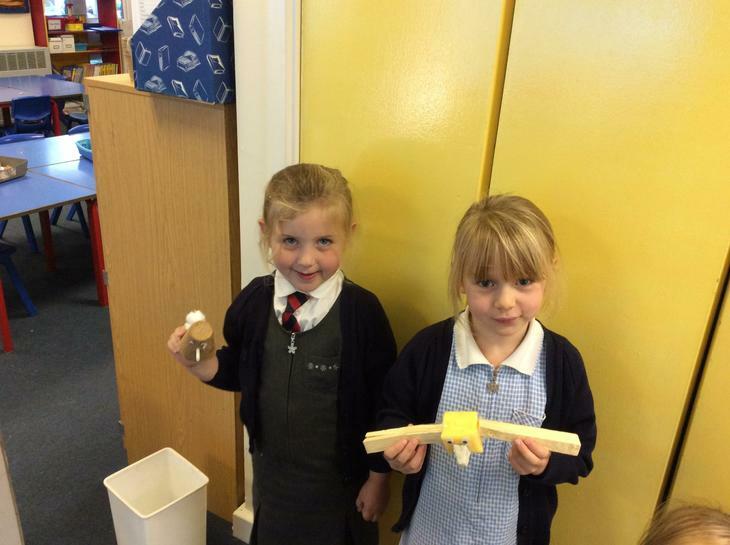 We have been reading Toys in Space. 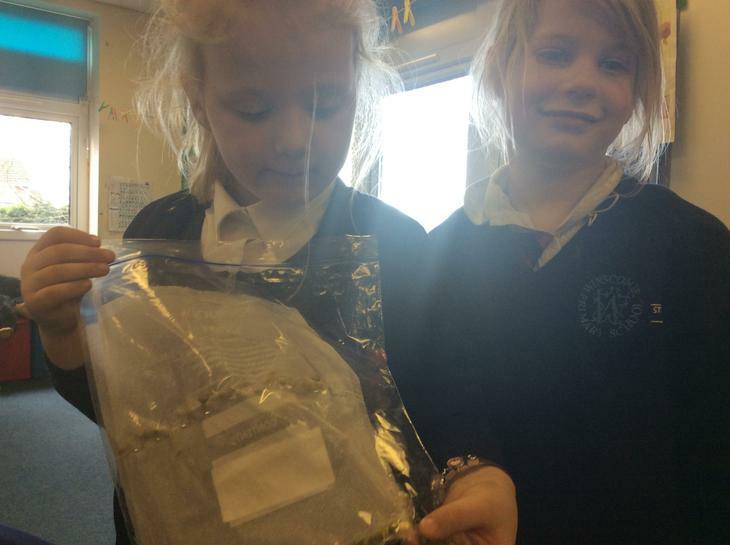 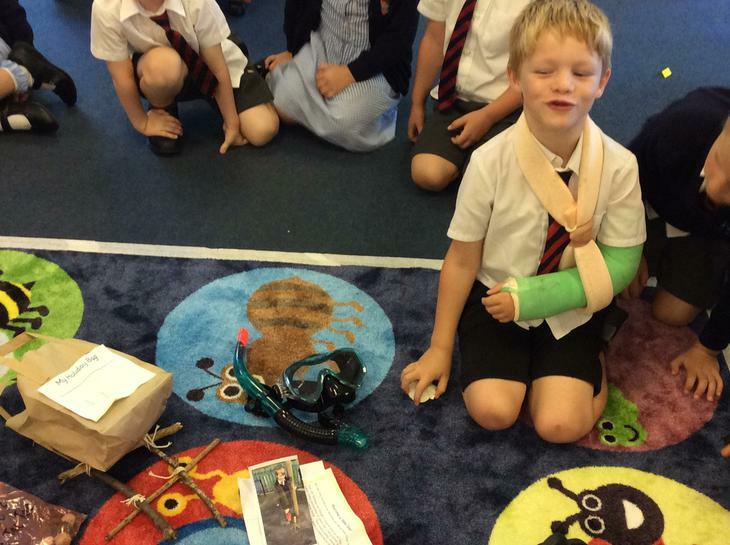 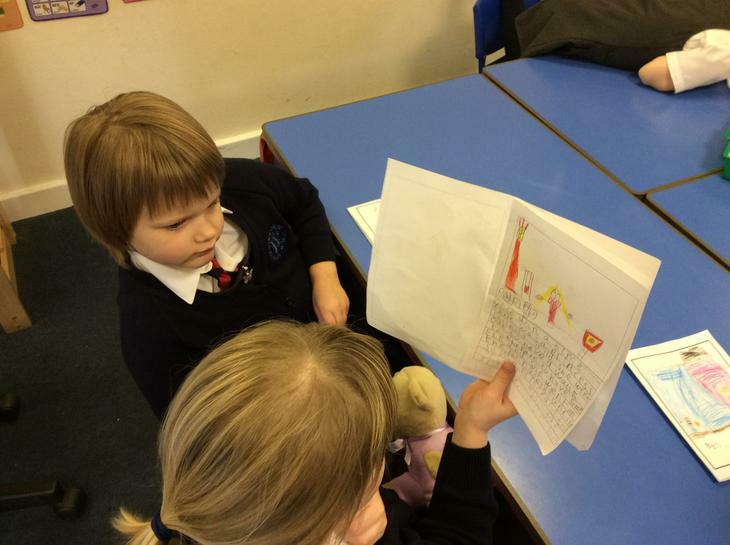 We have written letters explaining what happened to all the lost toys. 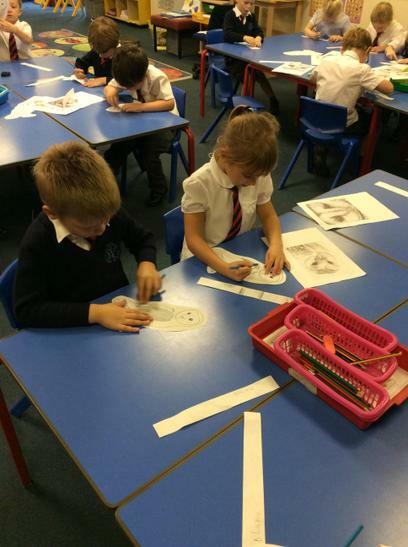 We also created our own wonderful aliens. 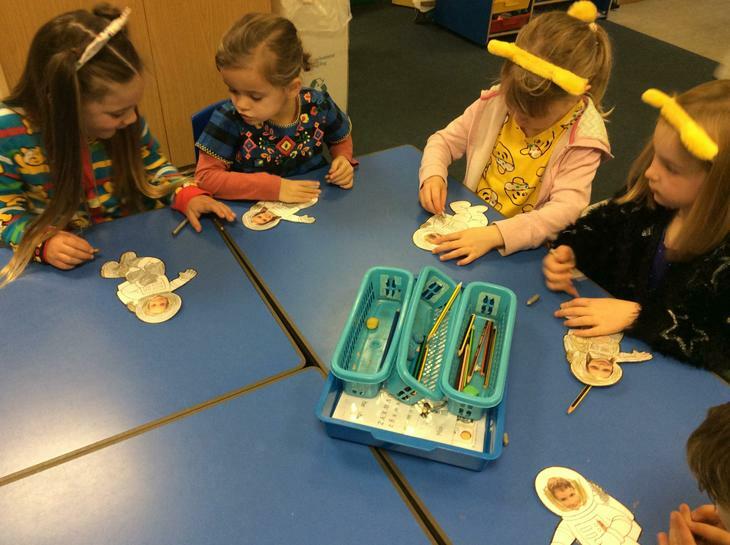 We had a lovely day raising money for Children in Need and creating wonderful aliens and astronauts for our 'Toys in Space' wall. 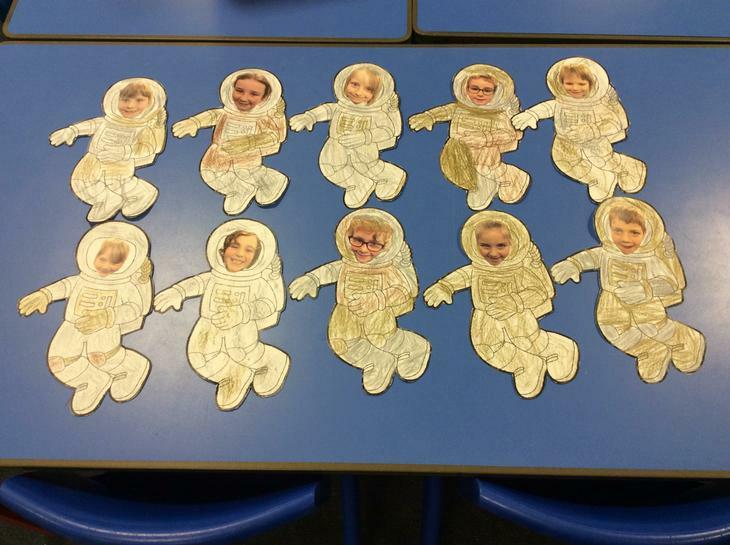 Can you see any astronauts you recognise? 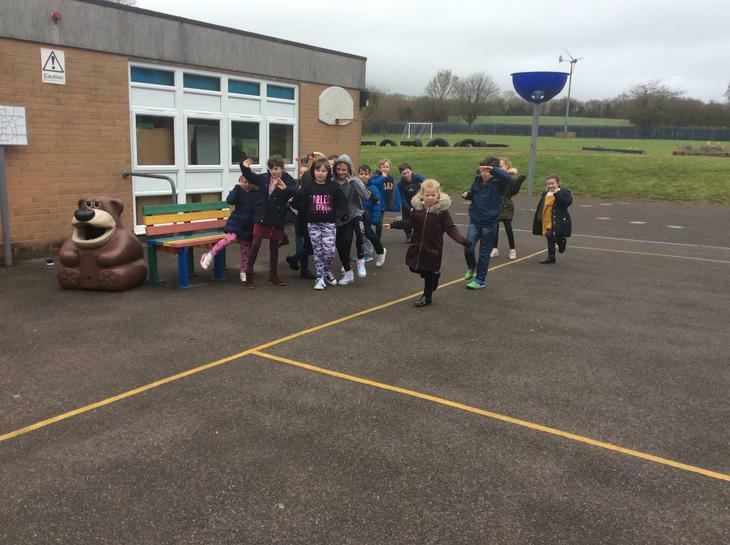 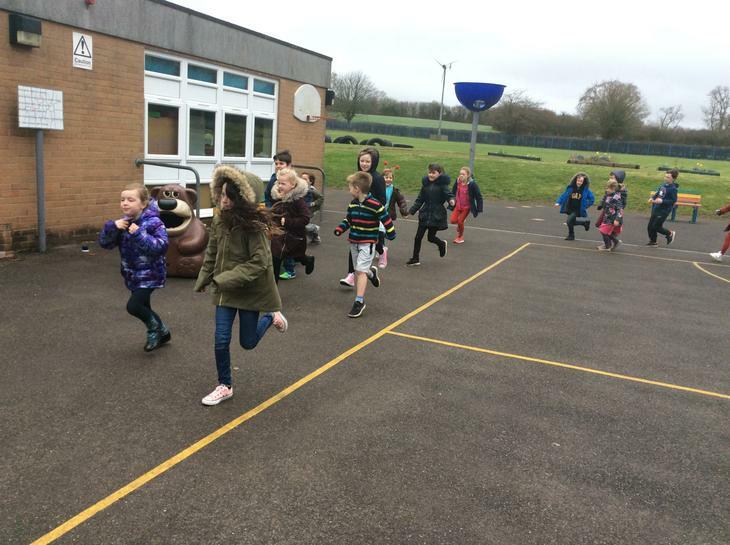 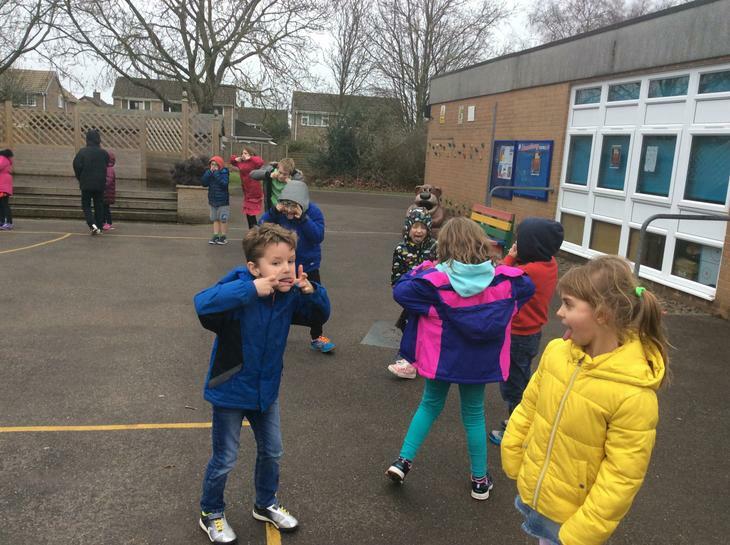 Ms Rees from Churchill Academy has been teaching us a woodland animal dance in PE. 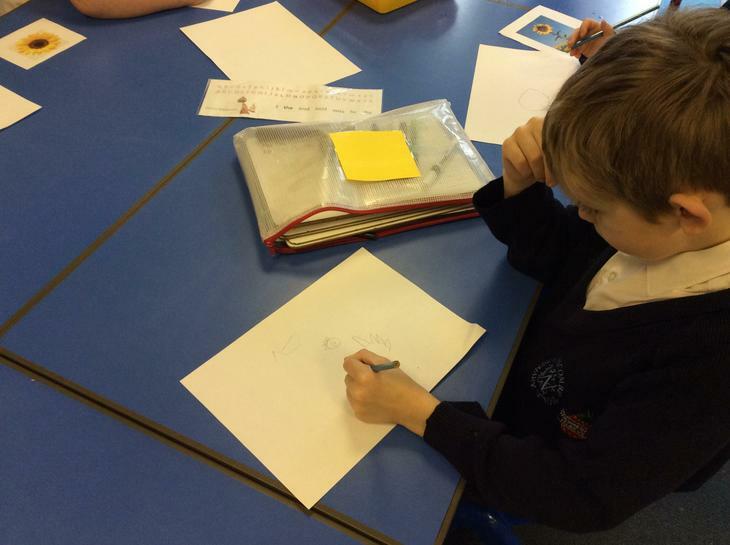 We have been looking at the work of Gary Hodges. 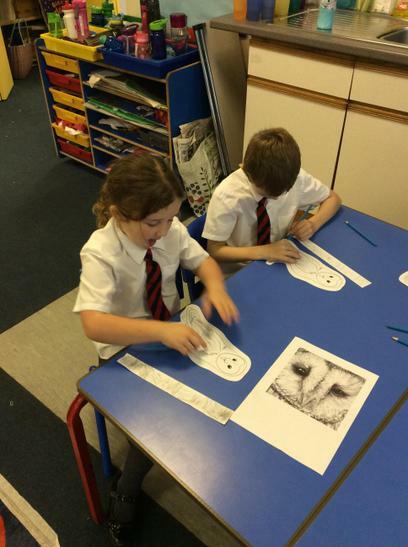 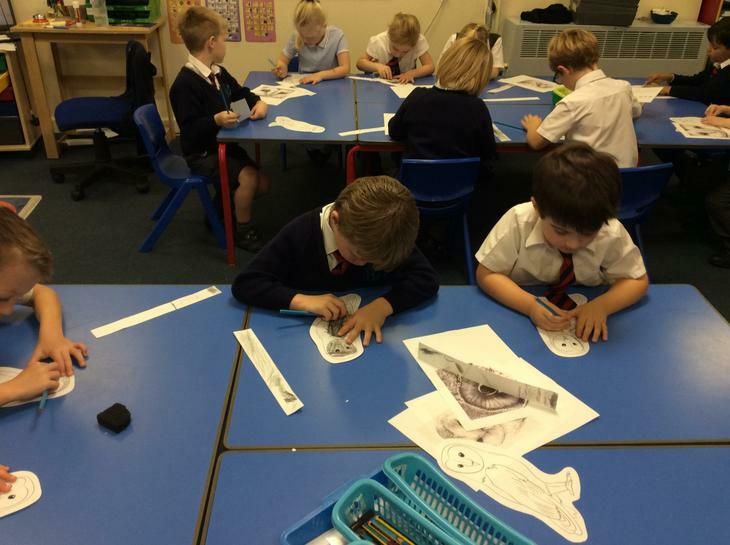 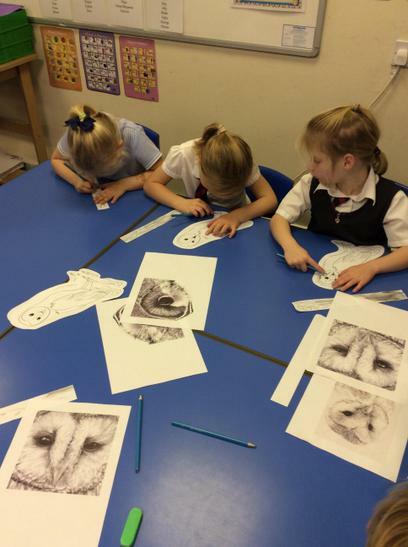 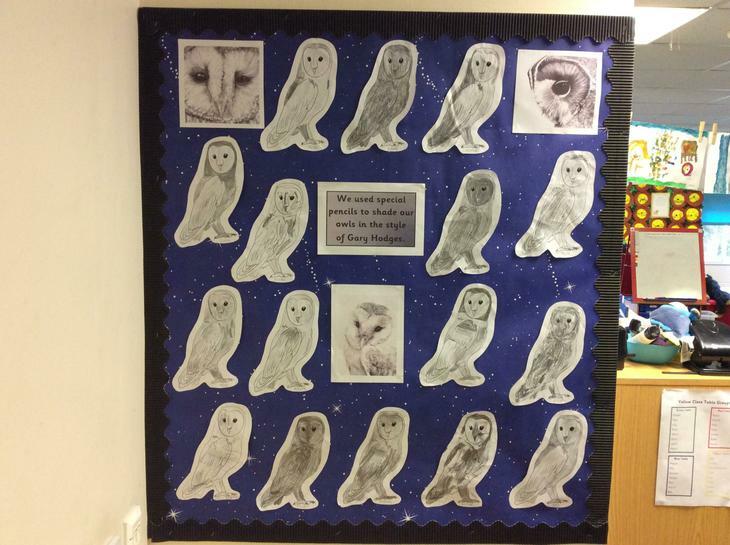 We used different pencil techniques to shade our owls. 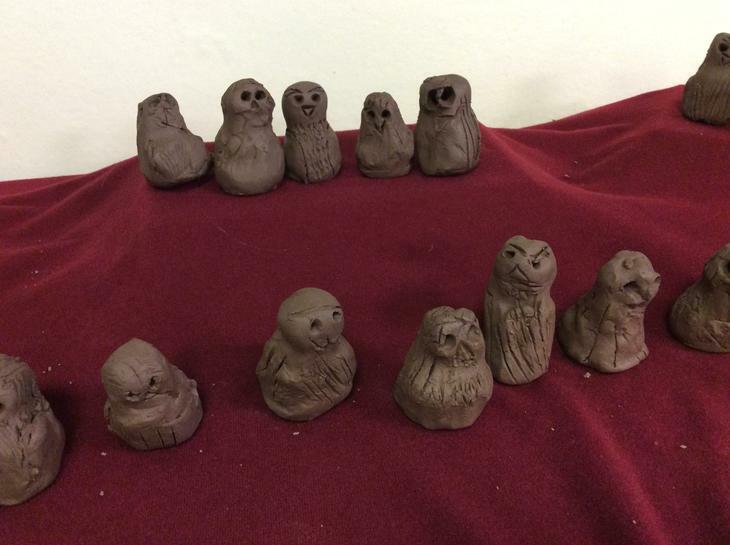 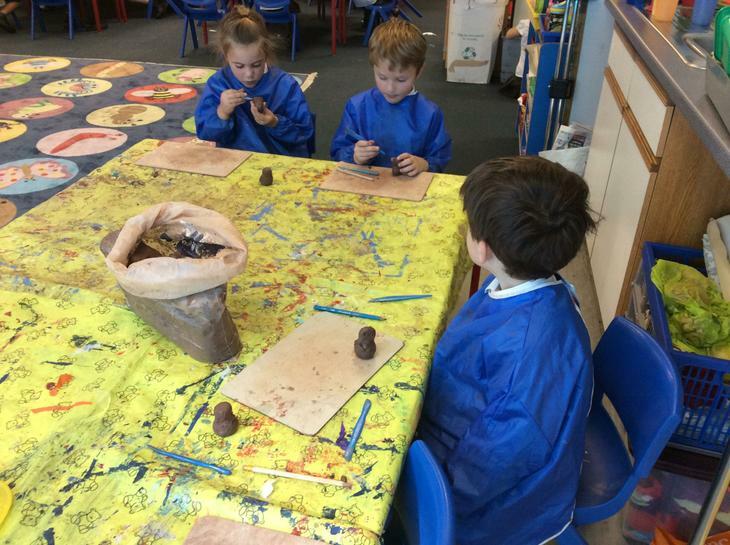 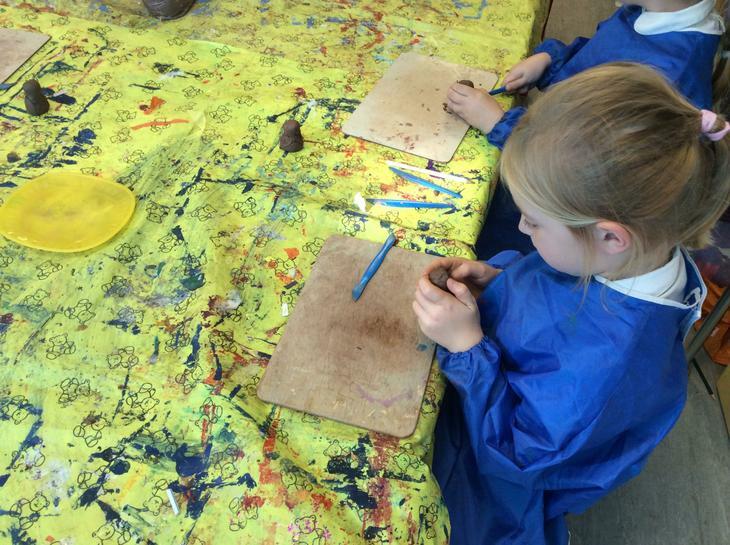 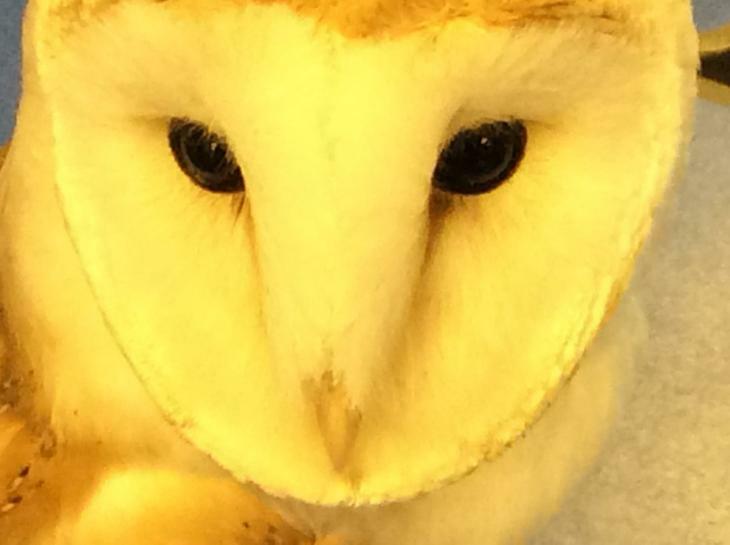 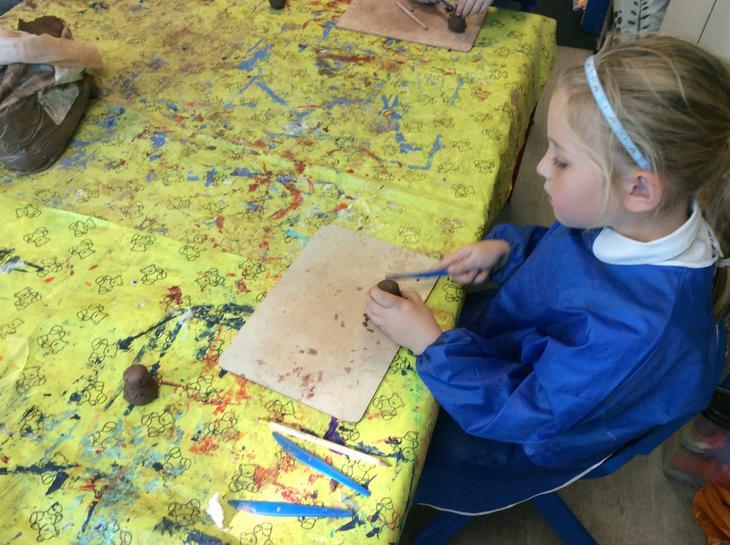 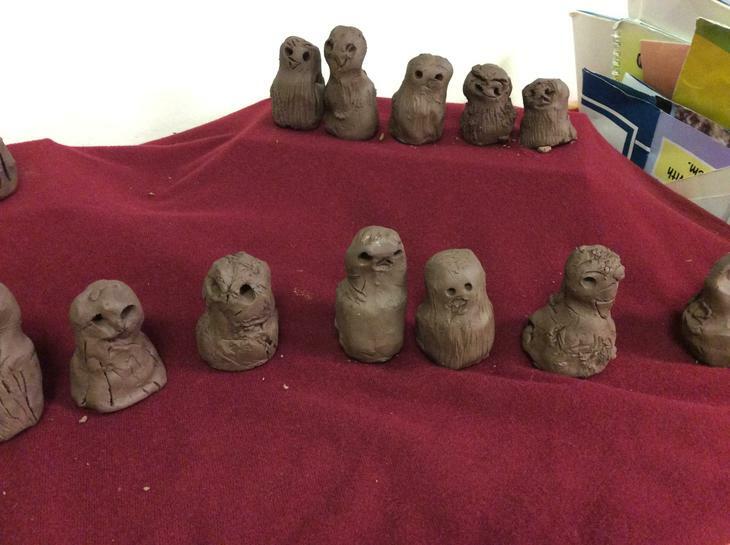 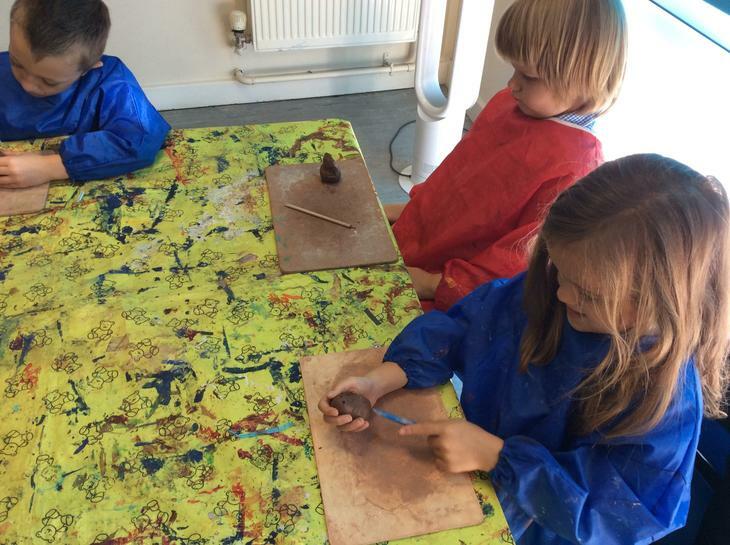 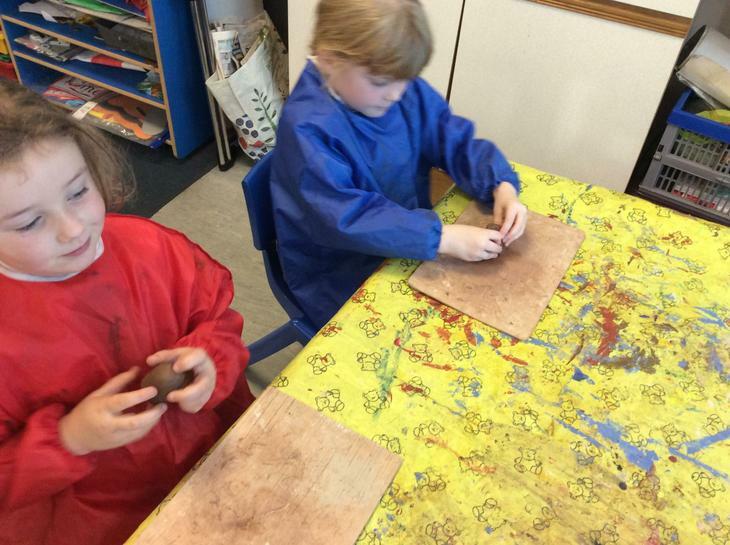 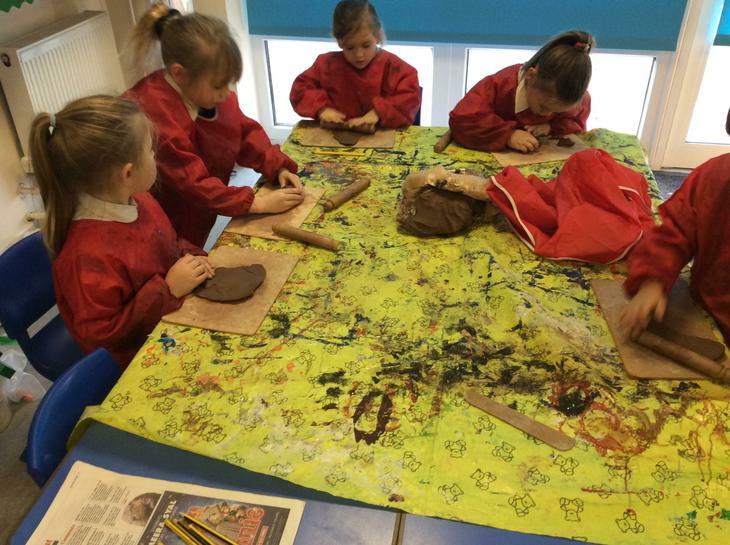 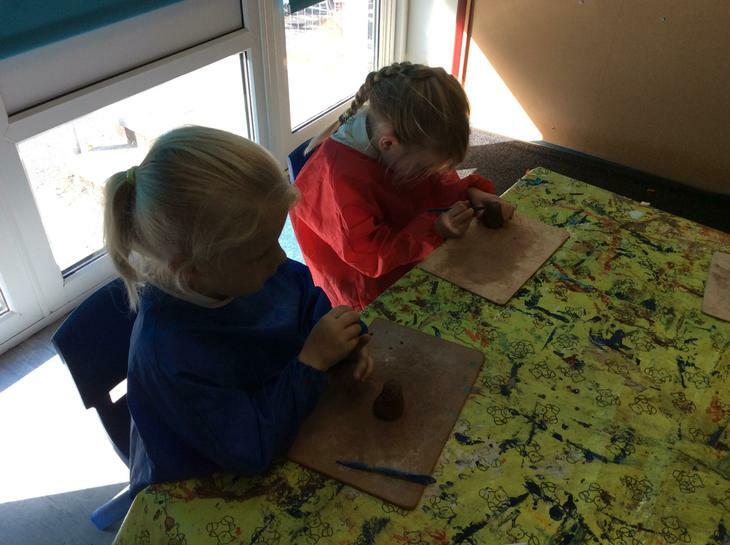 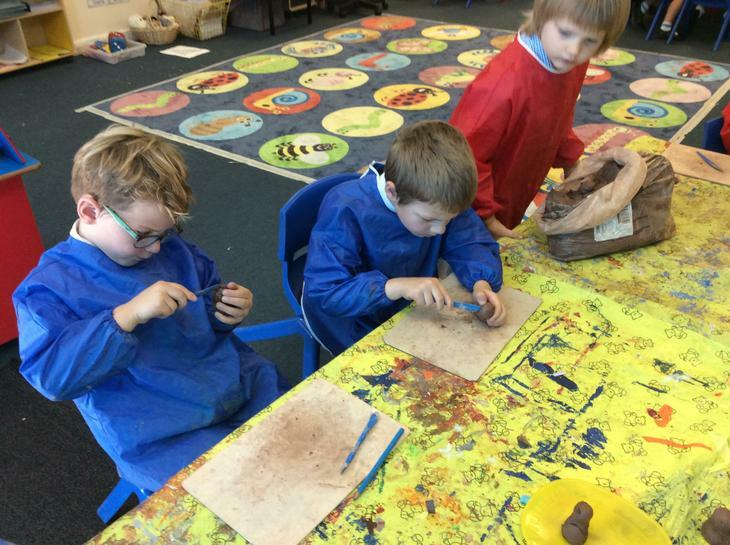 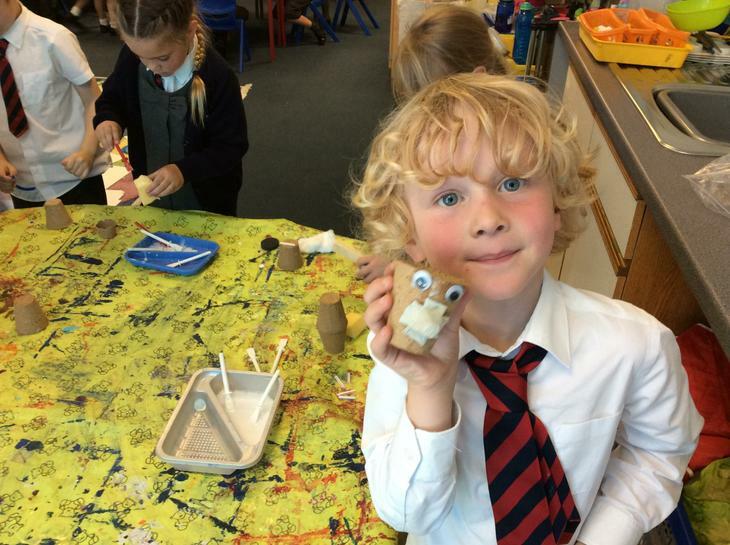 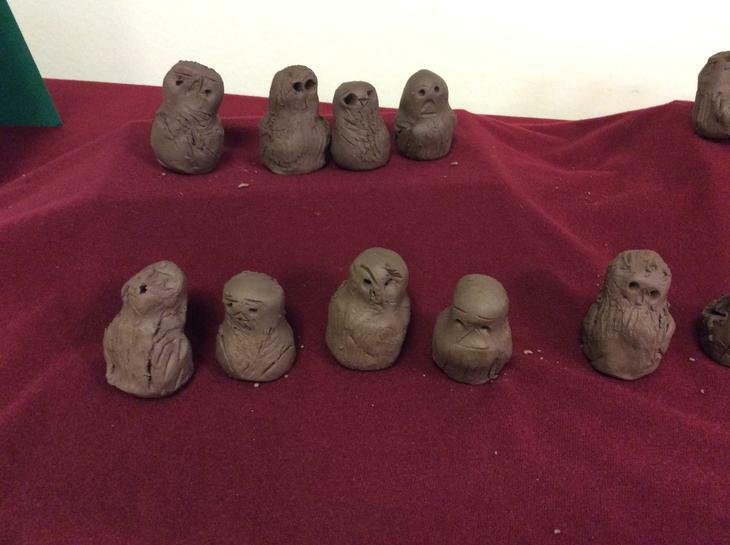 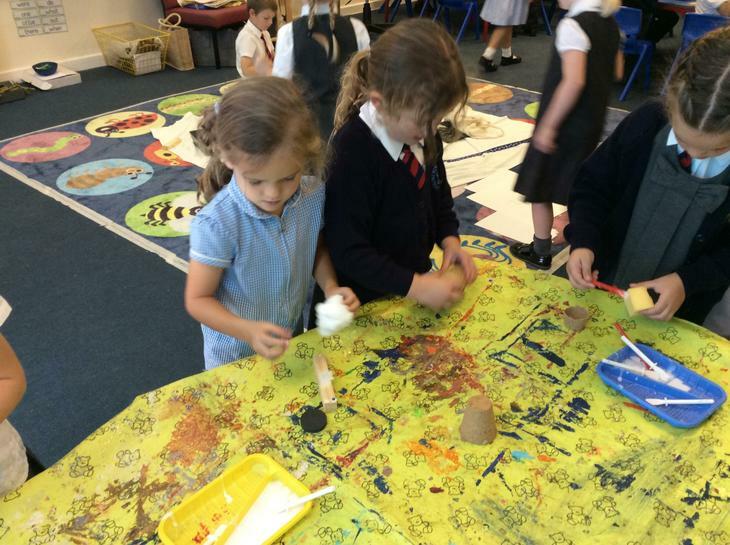 We have used clay to create our own wonderful Owl Babies. 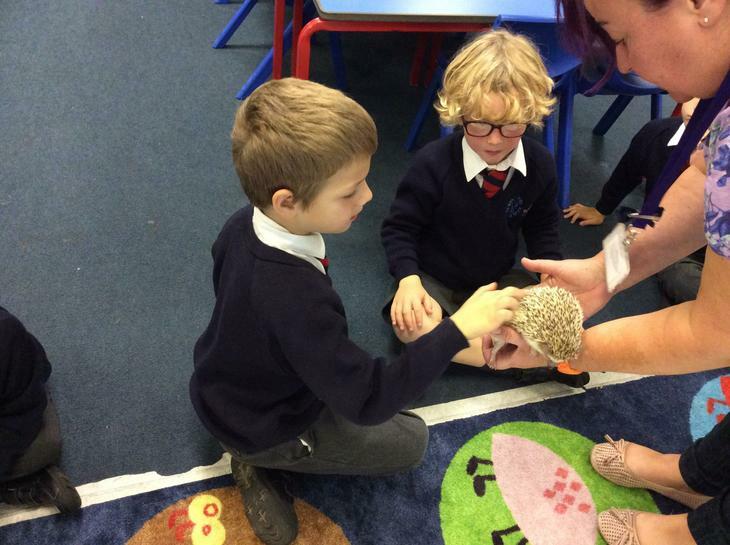 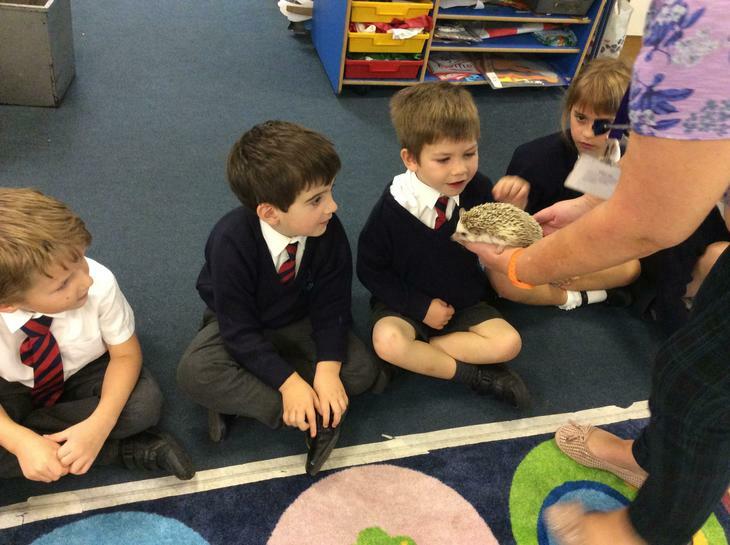 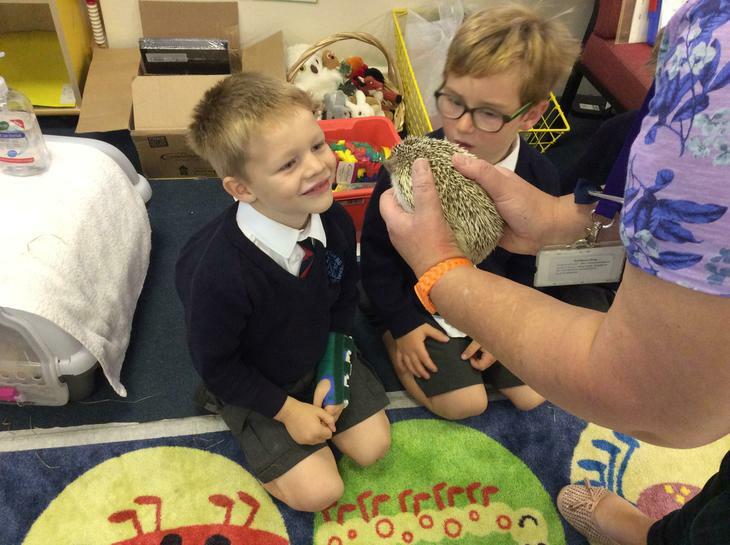 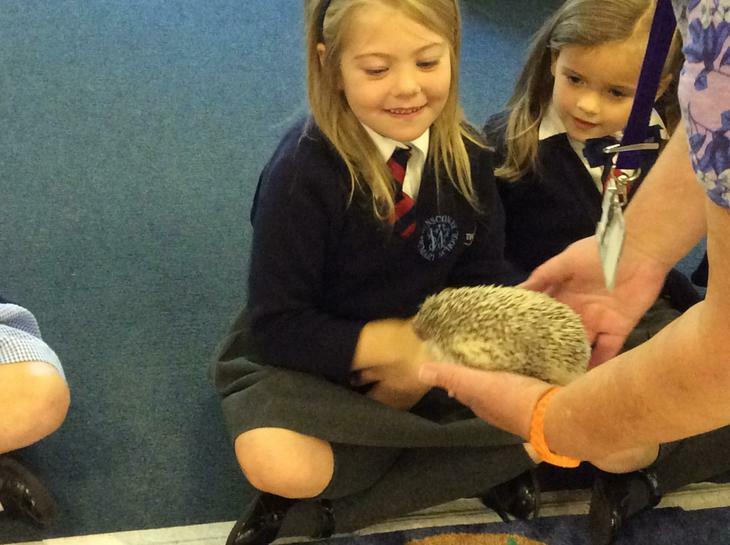 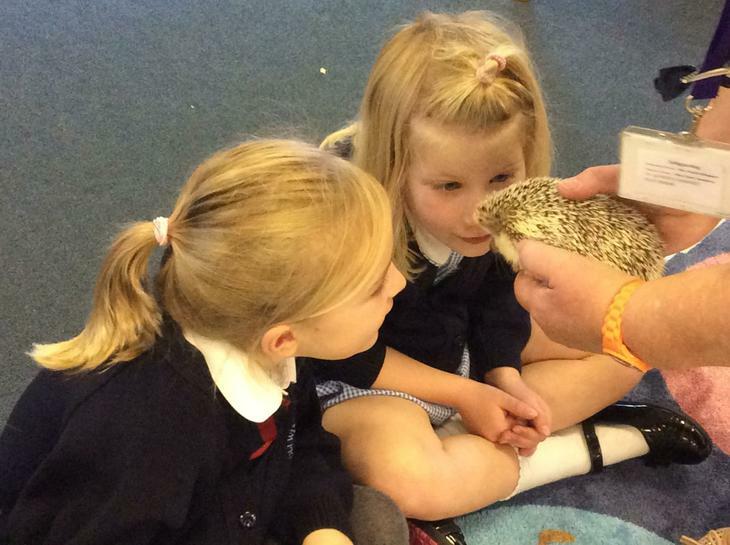 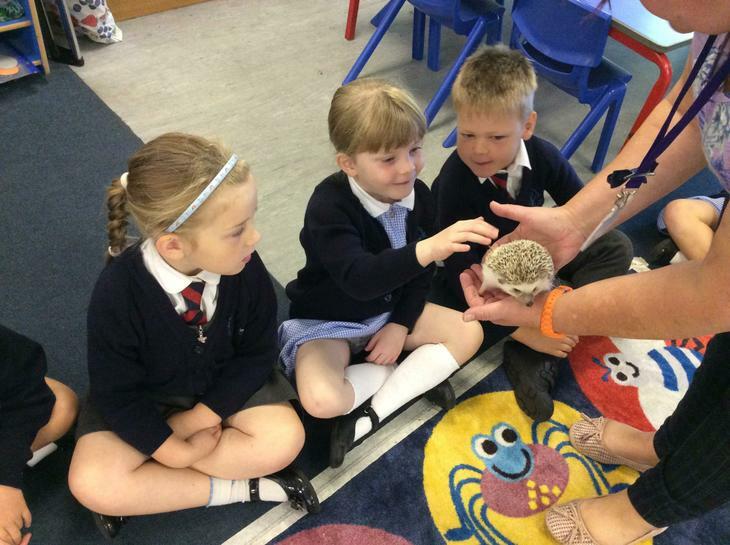 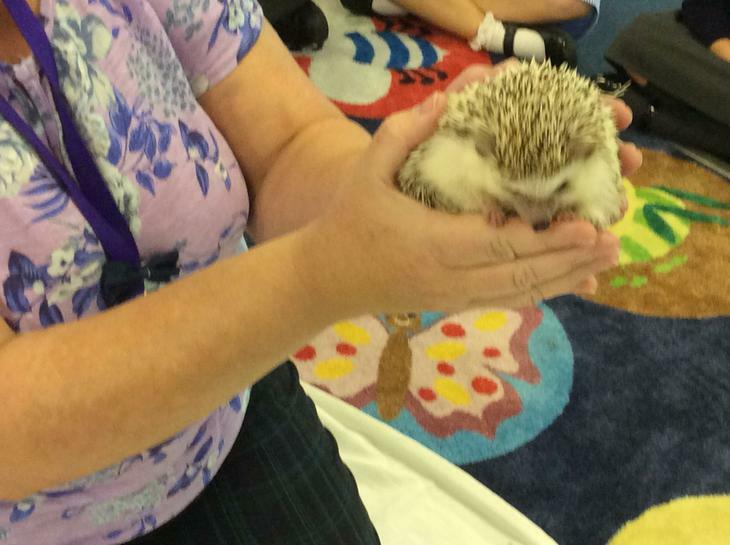 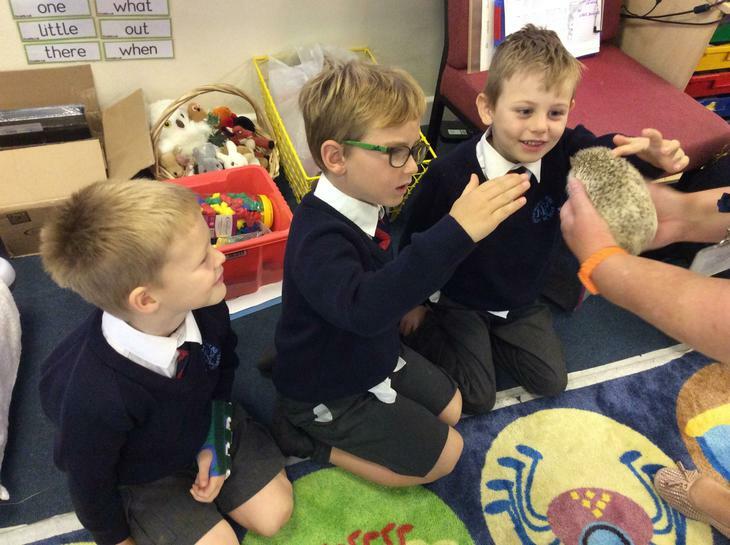 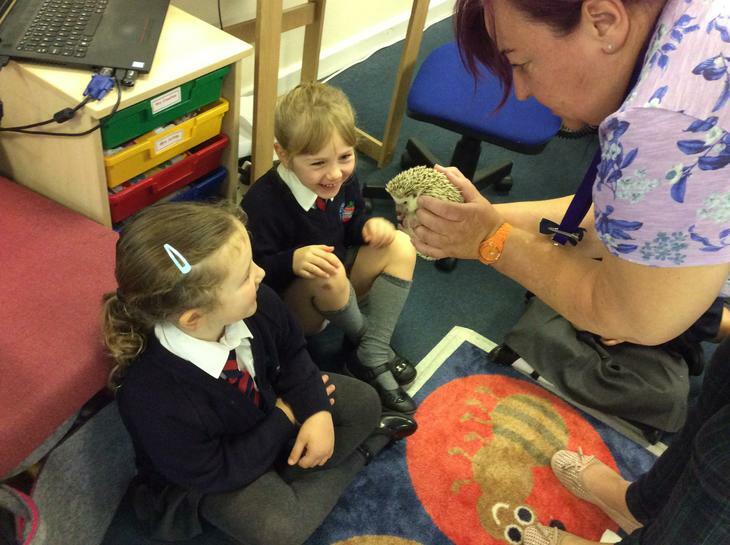 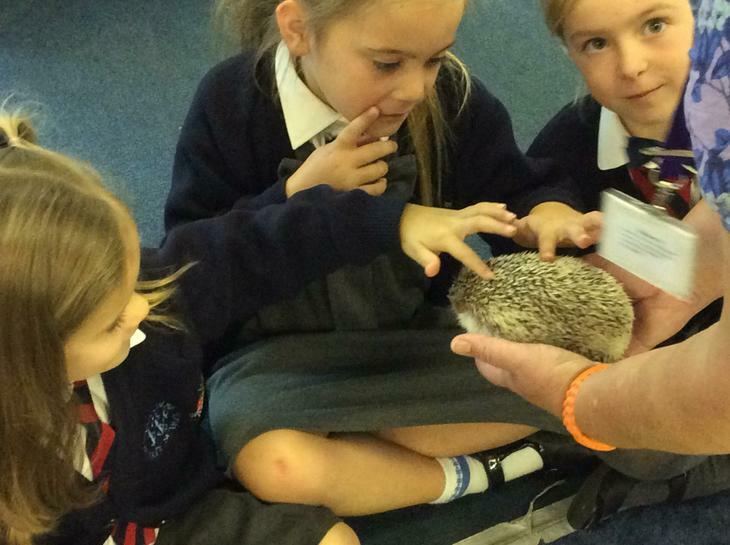 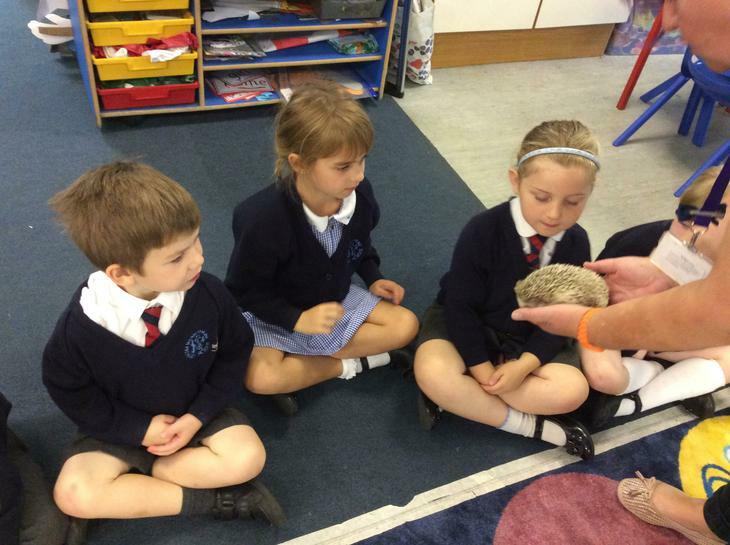 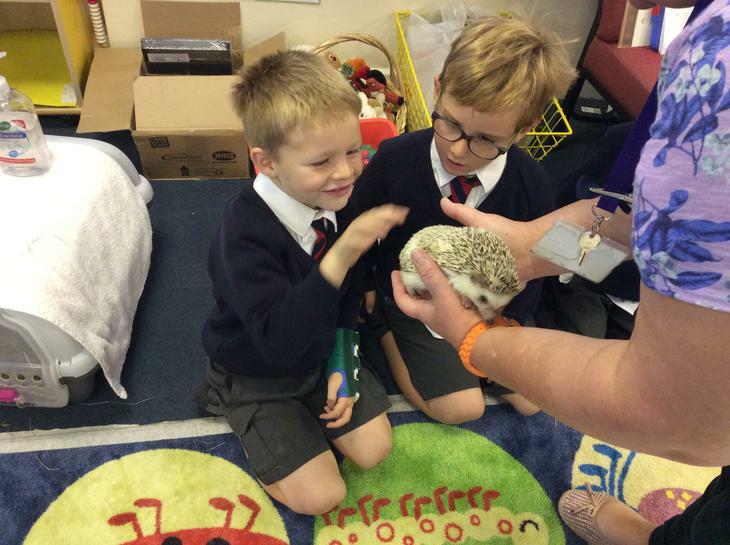 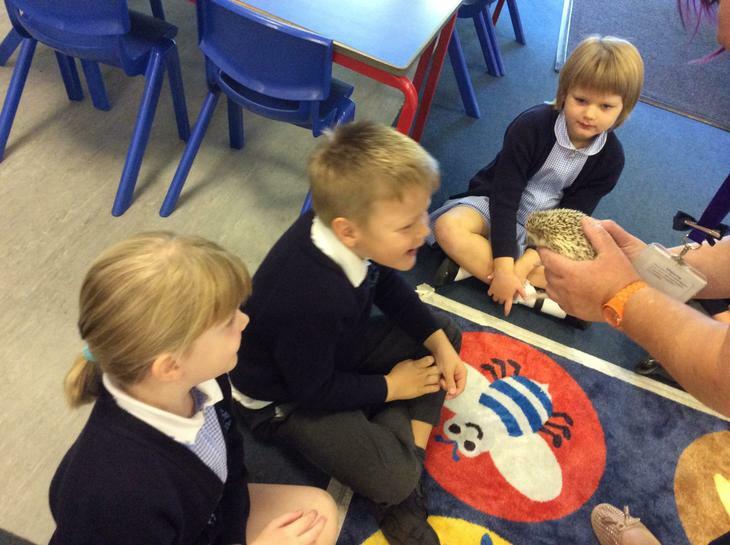 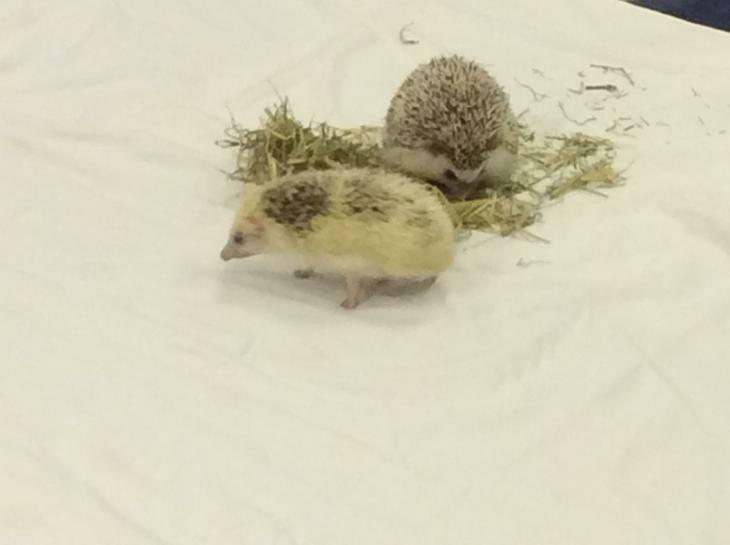 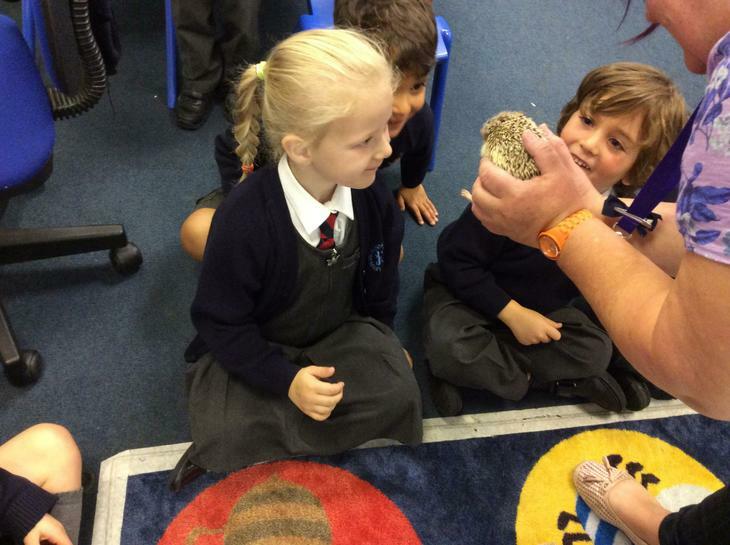 We also met some African pigmy hedgehogs. 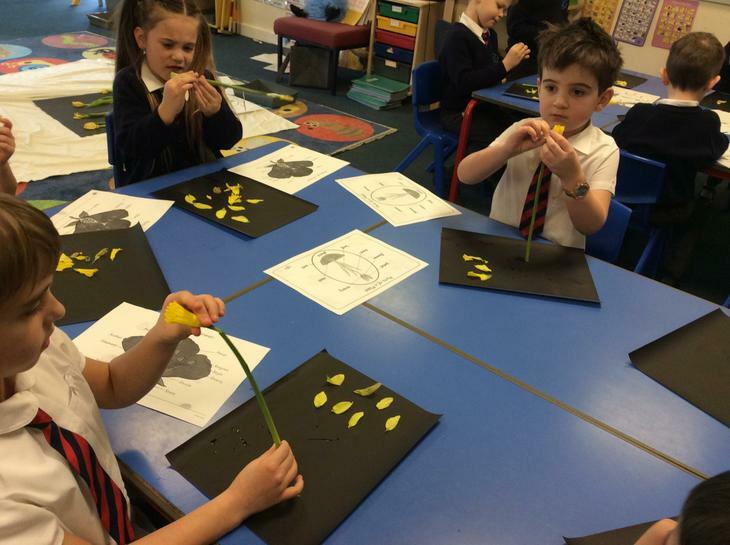 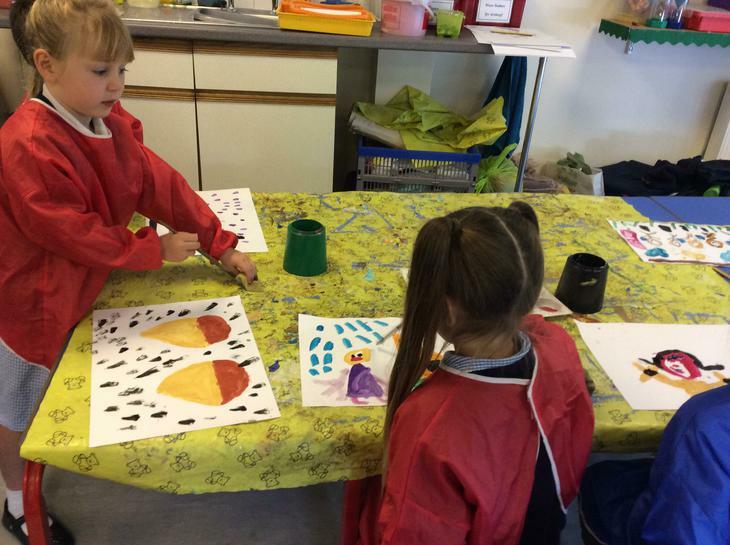 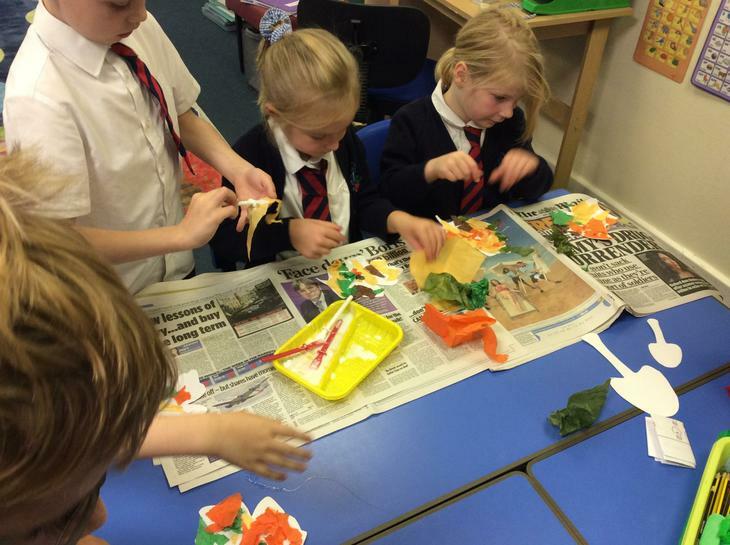 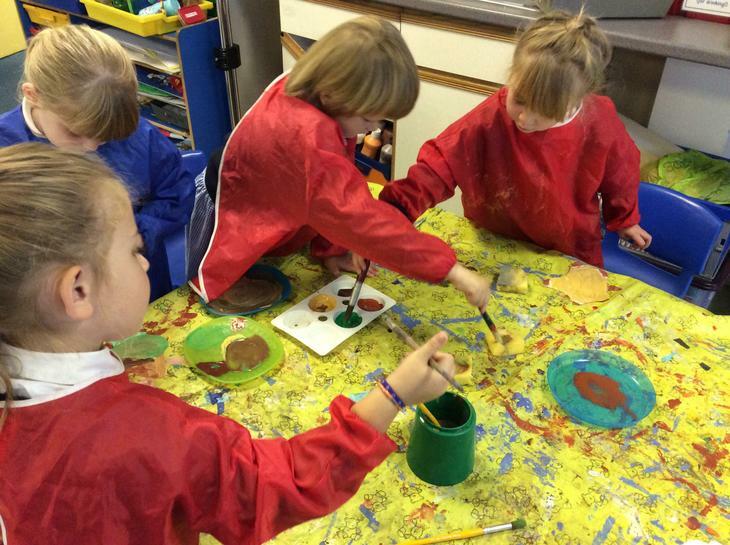 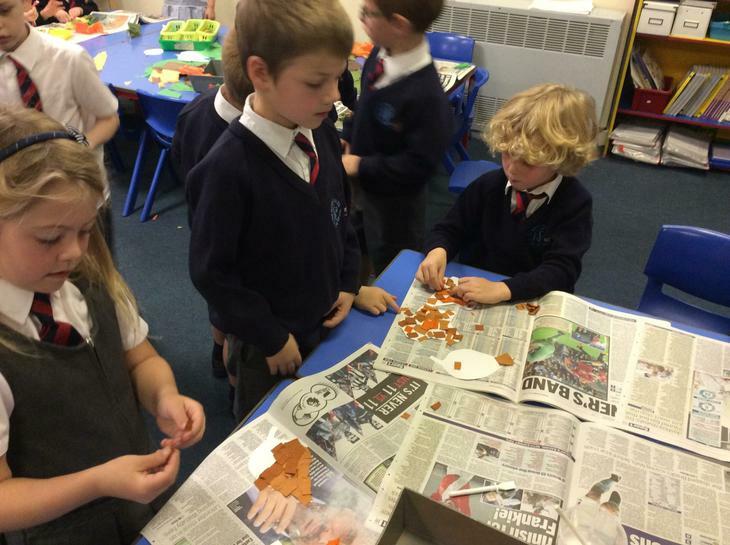 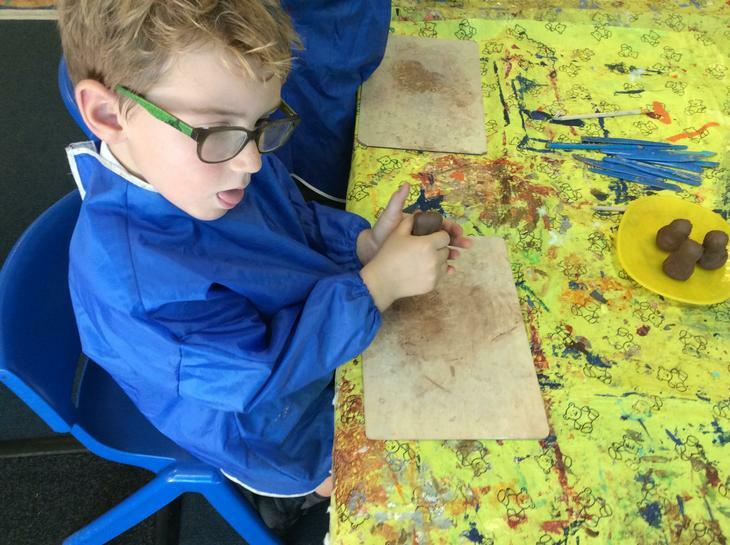 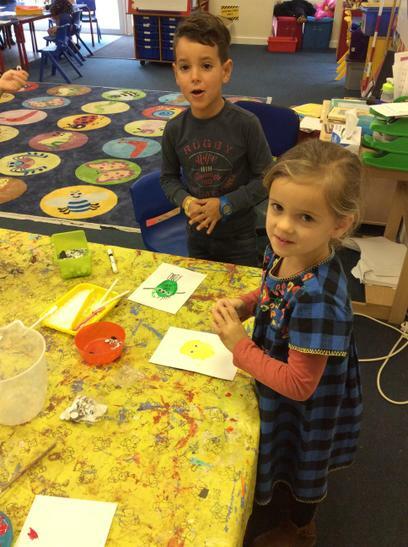 We have been using different techniques to create beautiful autumn leaves for our Owl Babies wall. 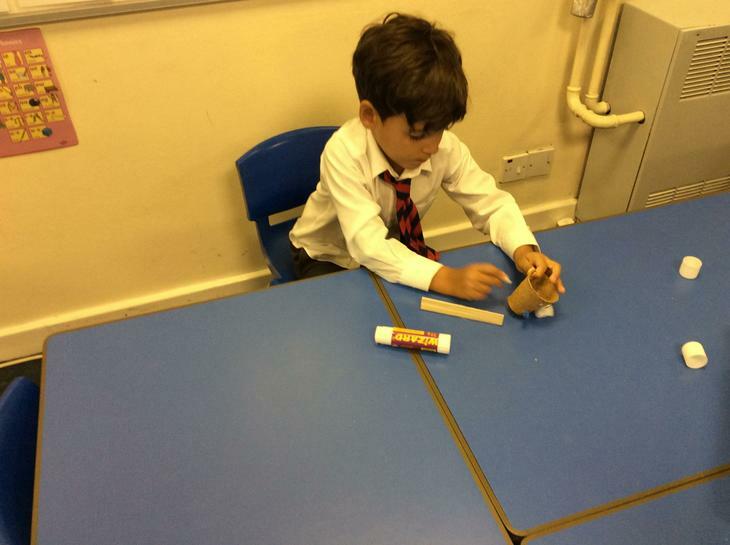 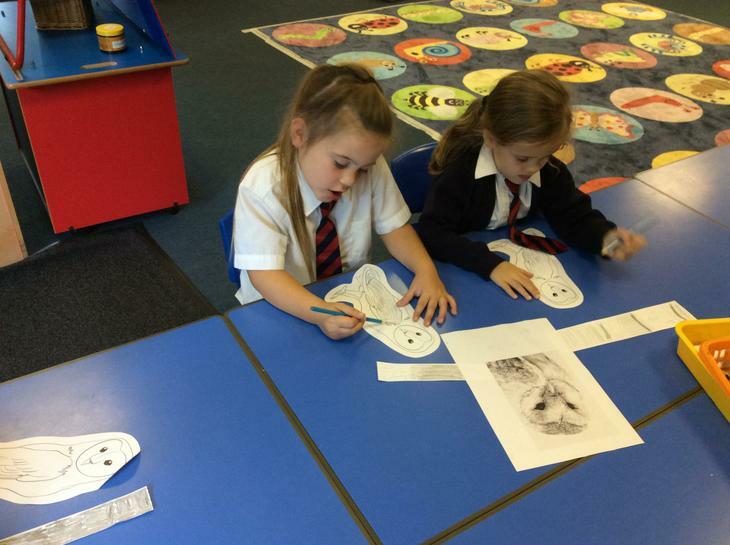 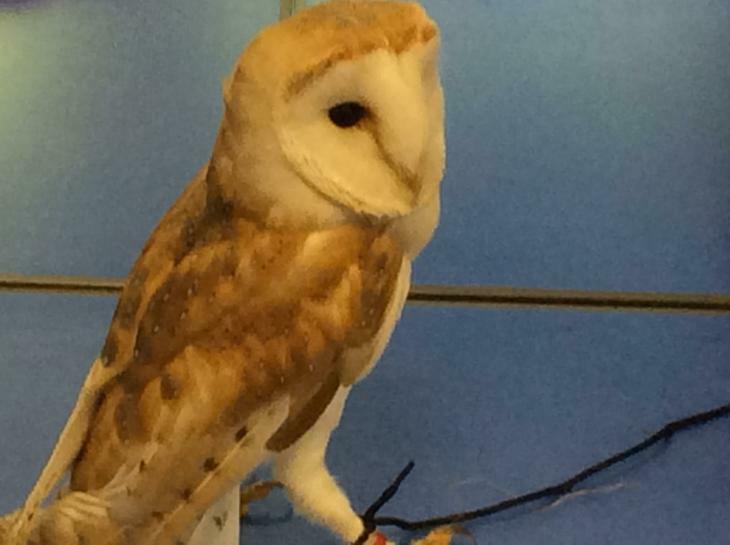 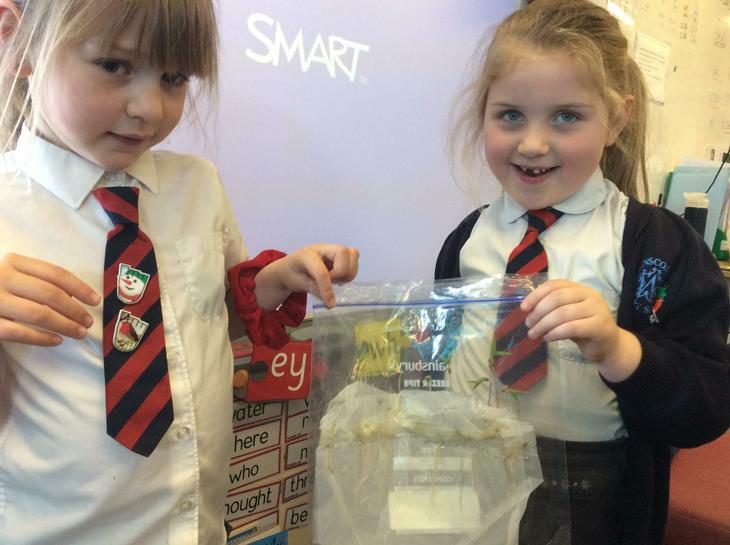 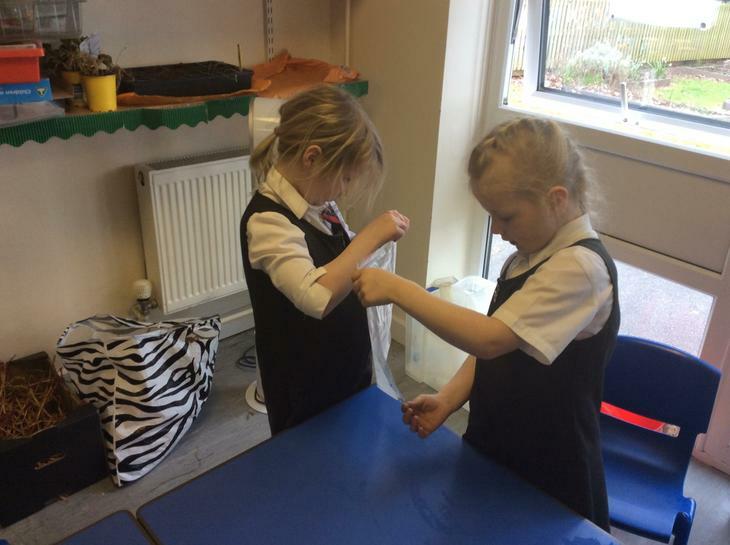 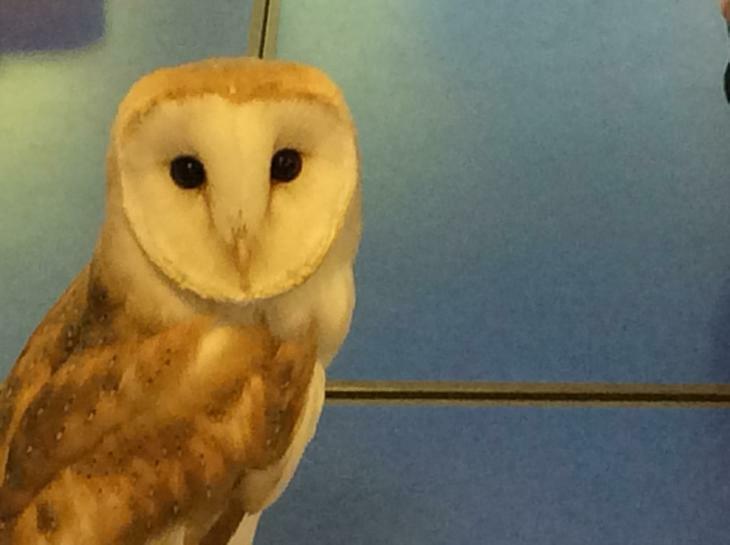 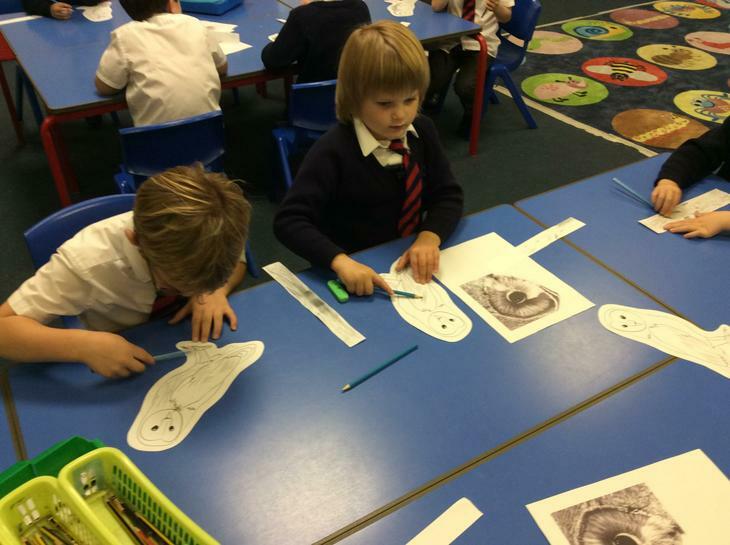 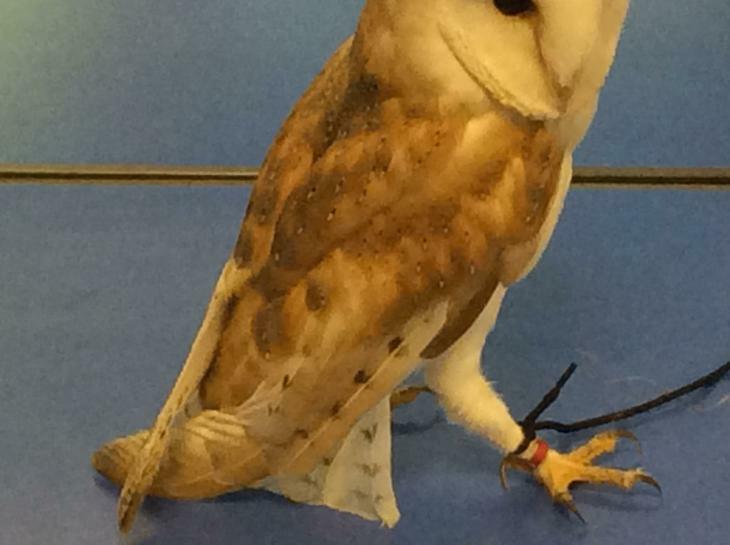 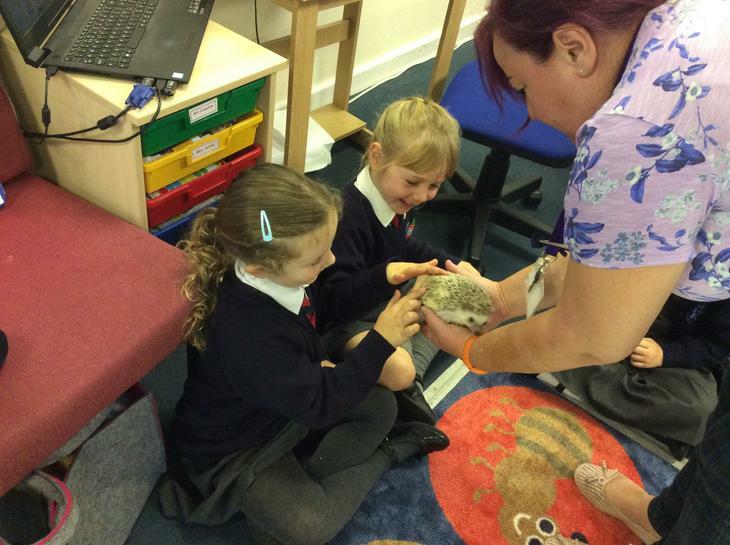 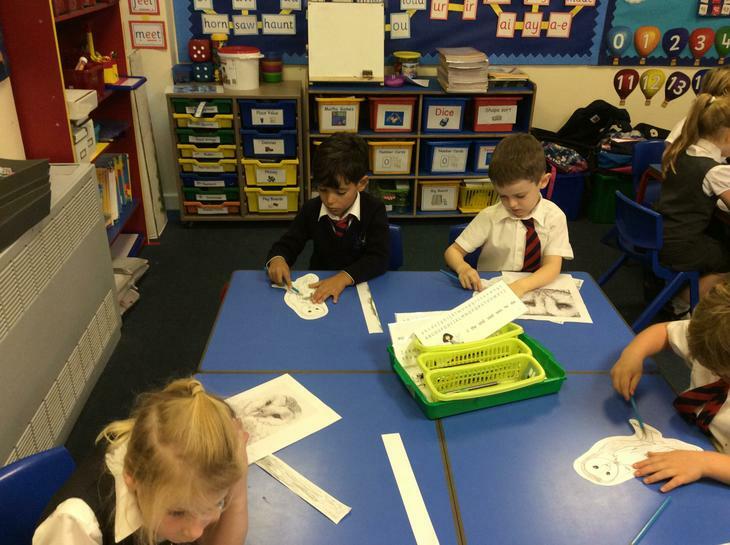 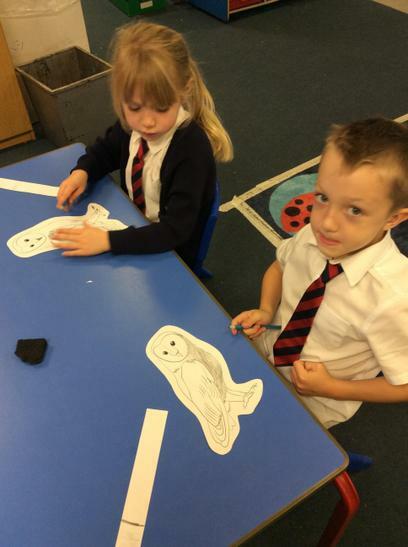 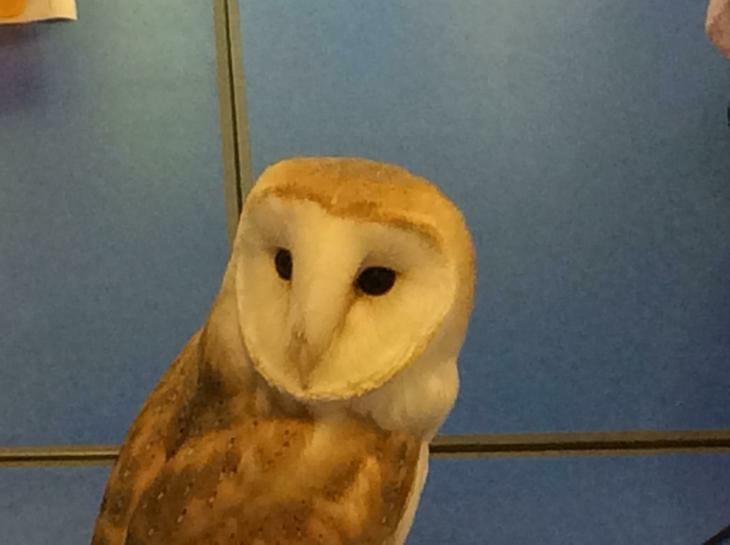 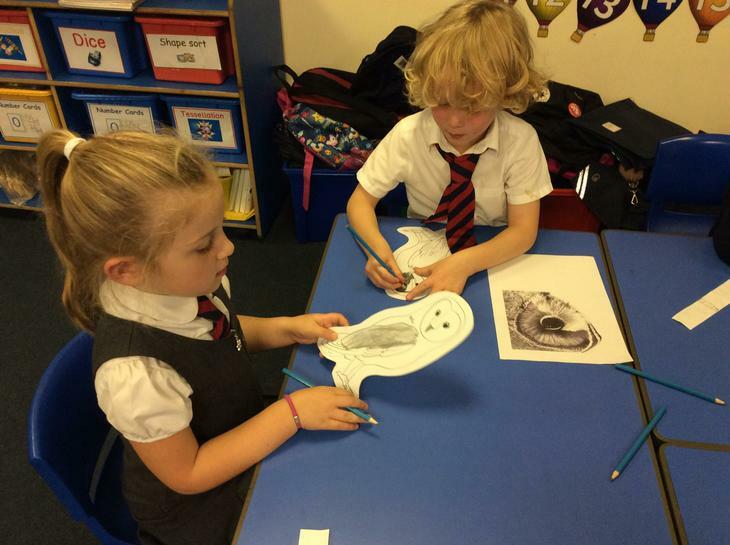 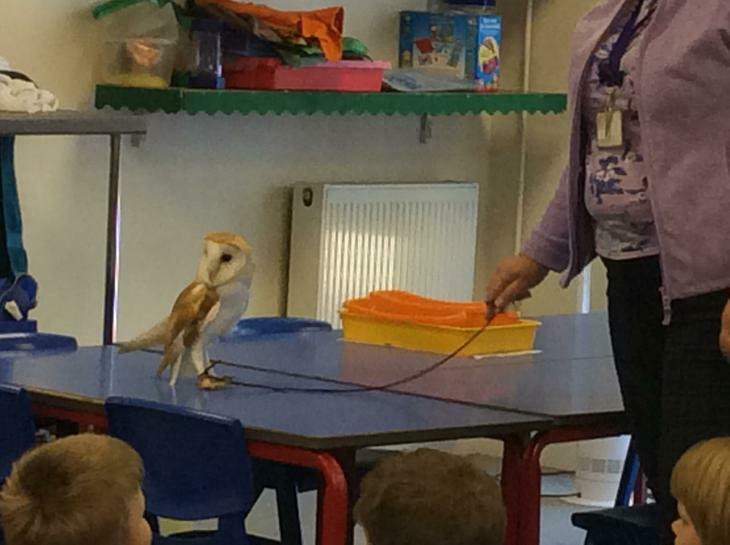 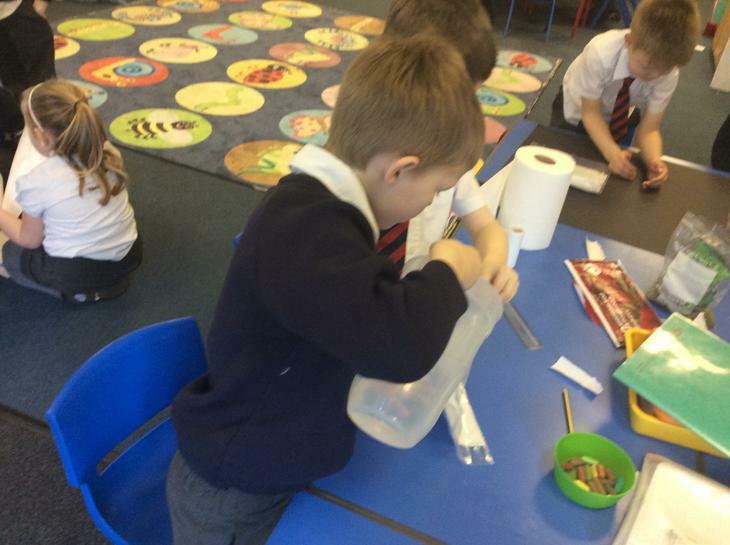 In science we are learning about animals. 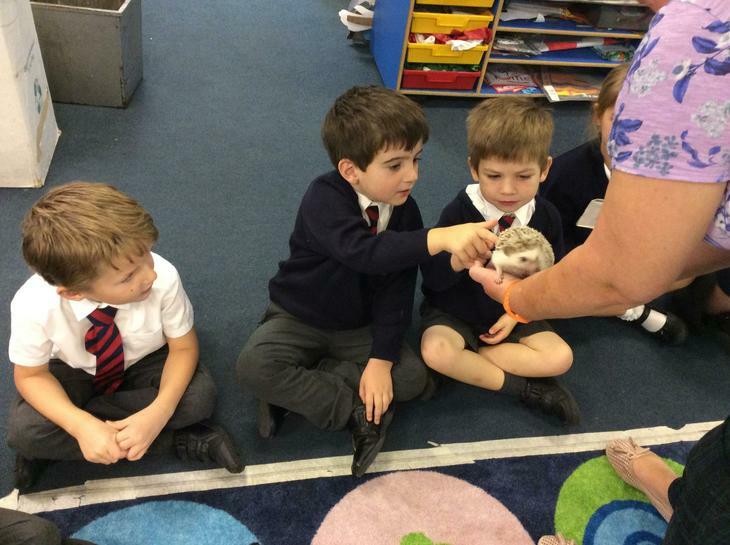 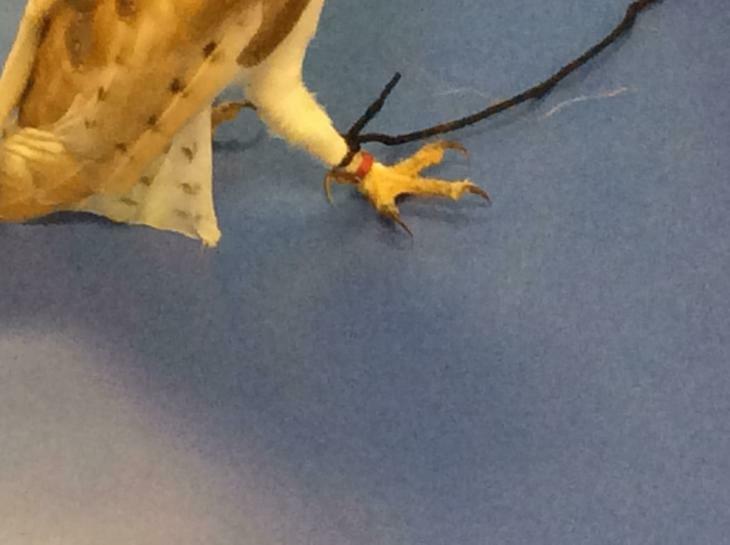 We have been thinking about keeping our pets healthy and happy. 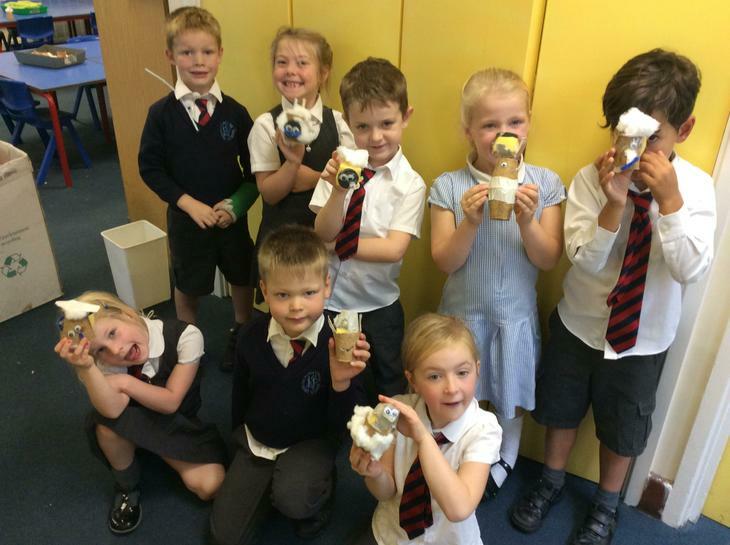 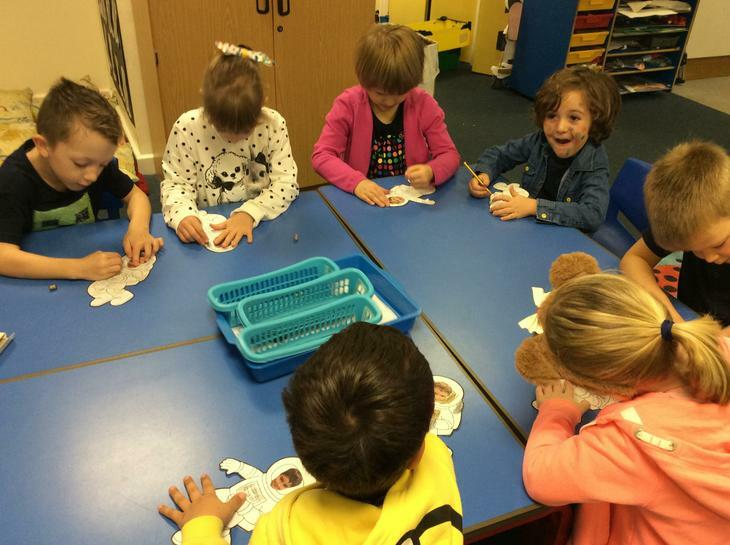 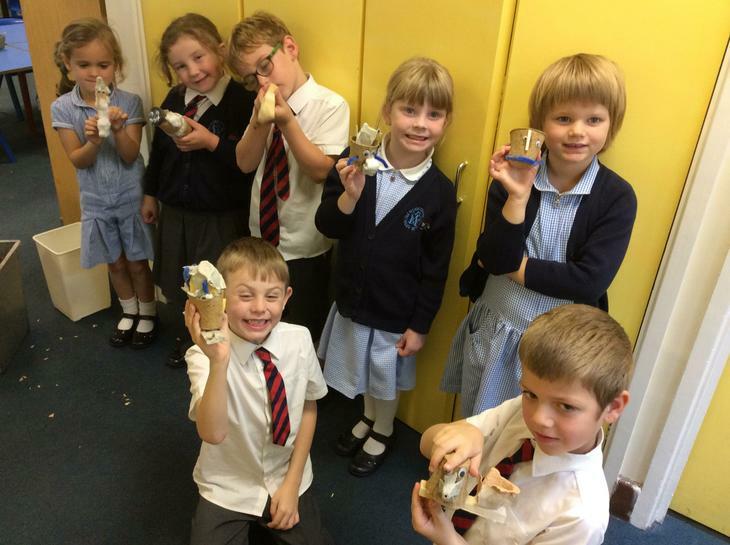 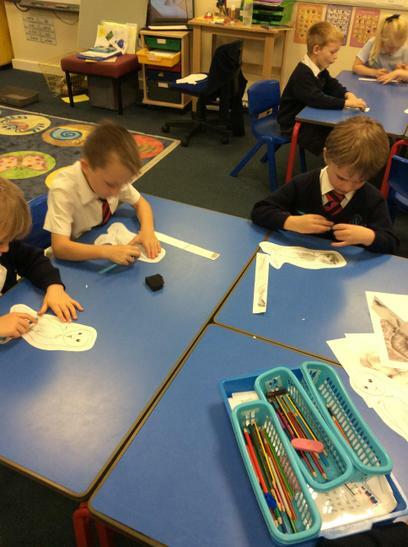 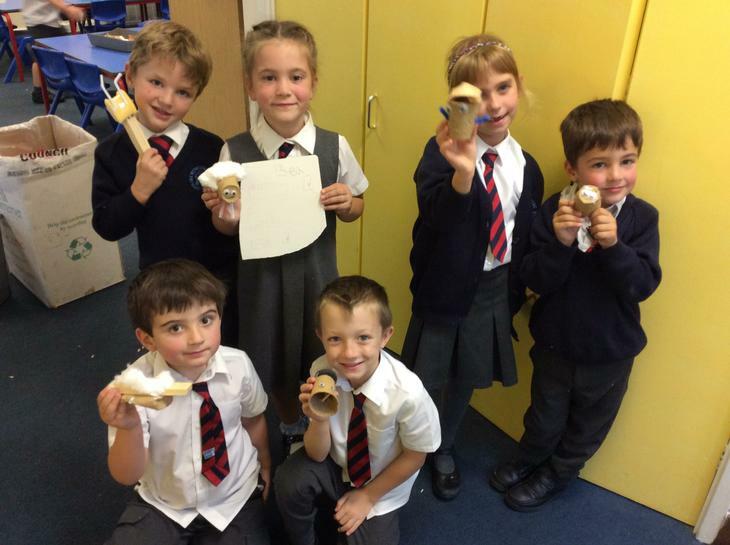 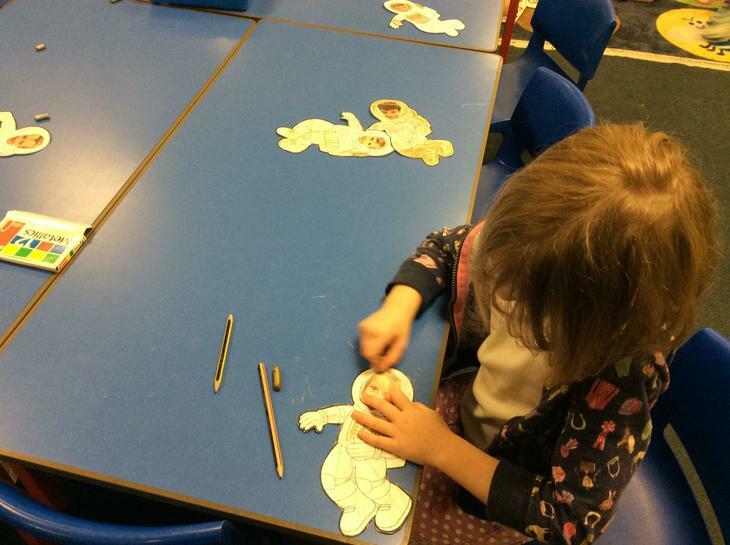 We made our own fantastic pets and thought about what they need. 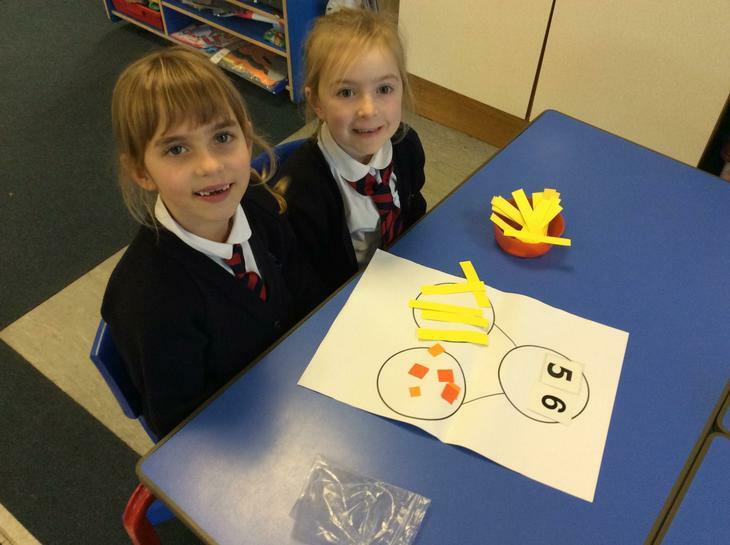 In Mathematics we are learning about greater than and less than. 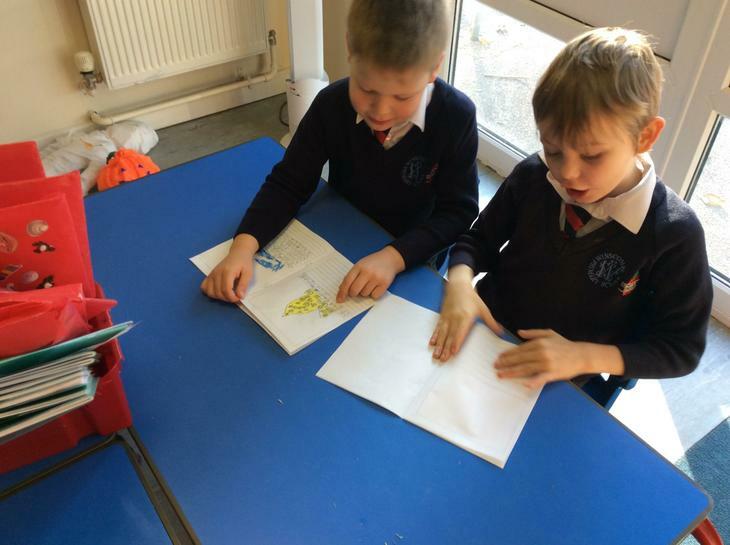 We have been using Charlie Crocodile to help us. 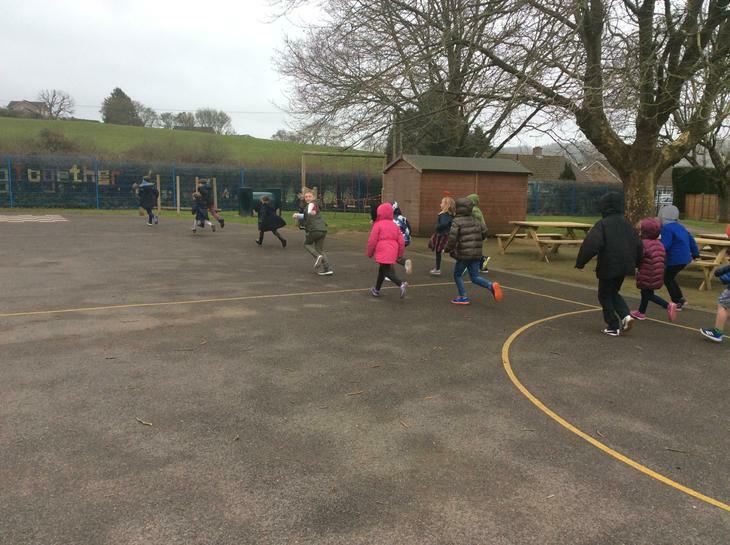 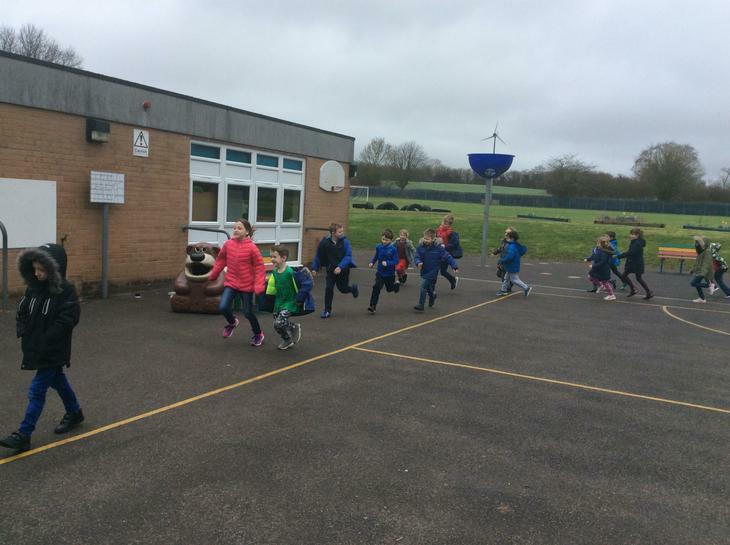 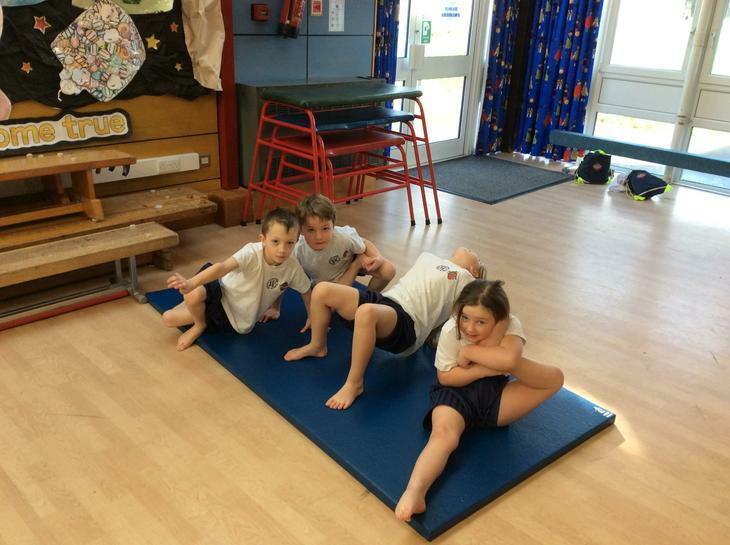 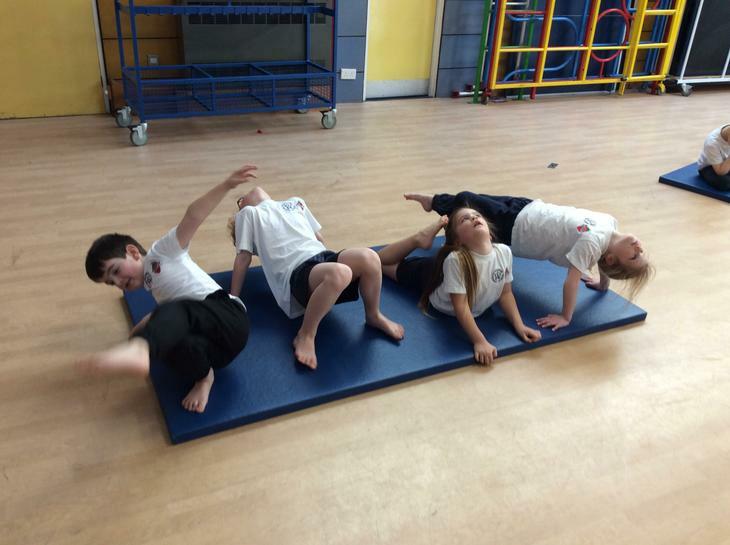 We have been working with partners in PE to create different shapes. 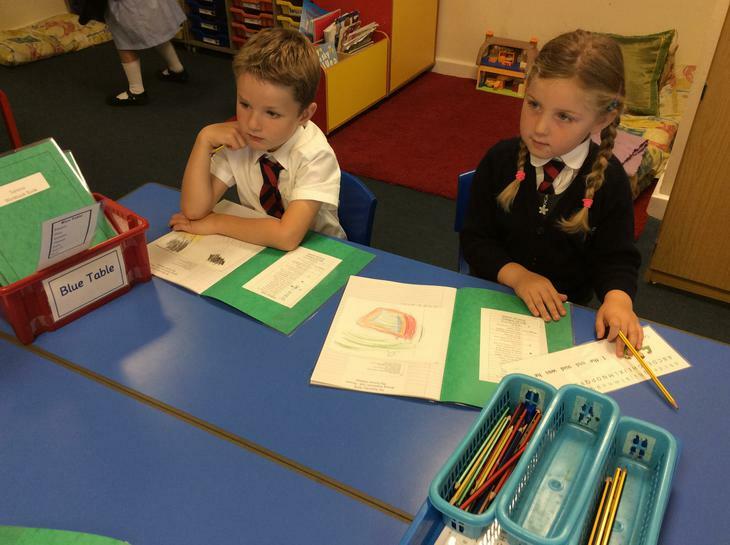 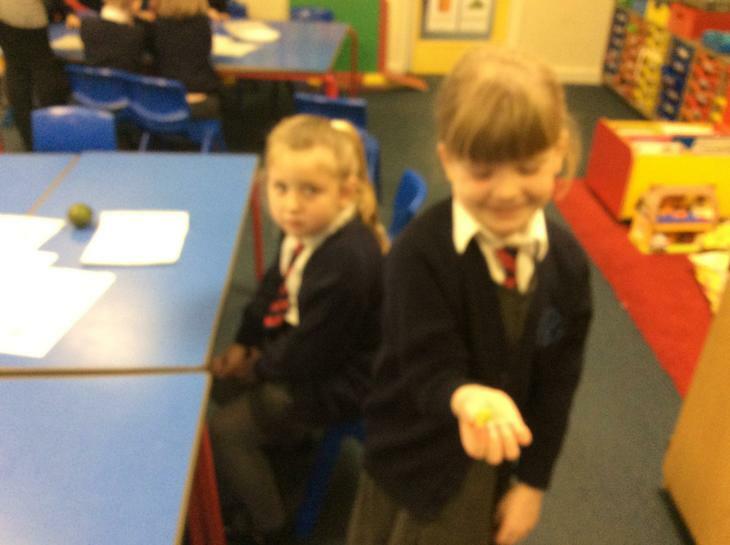 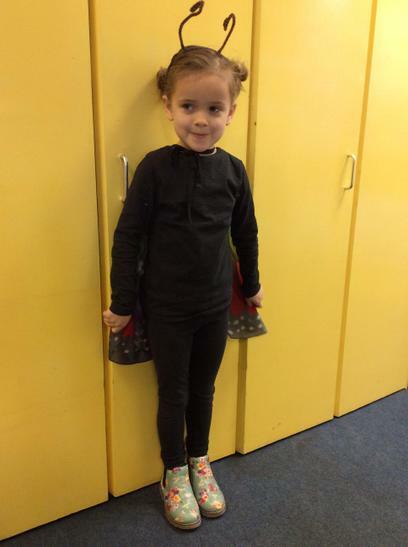 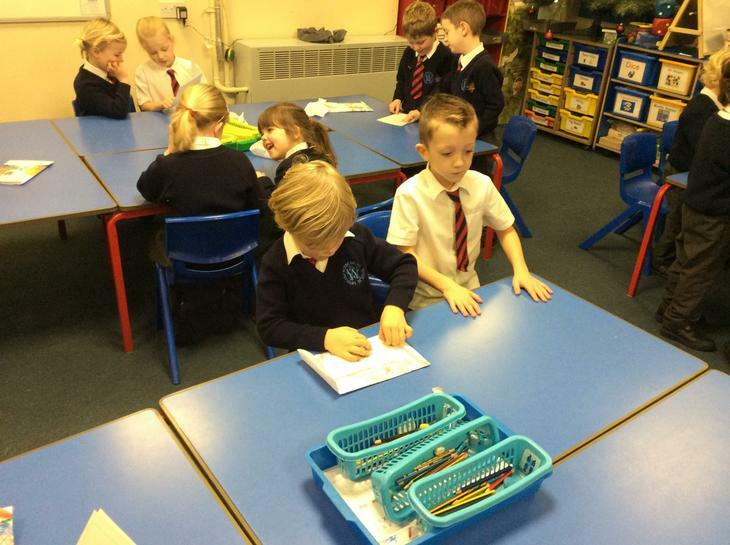 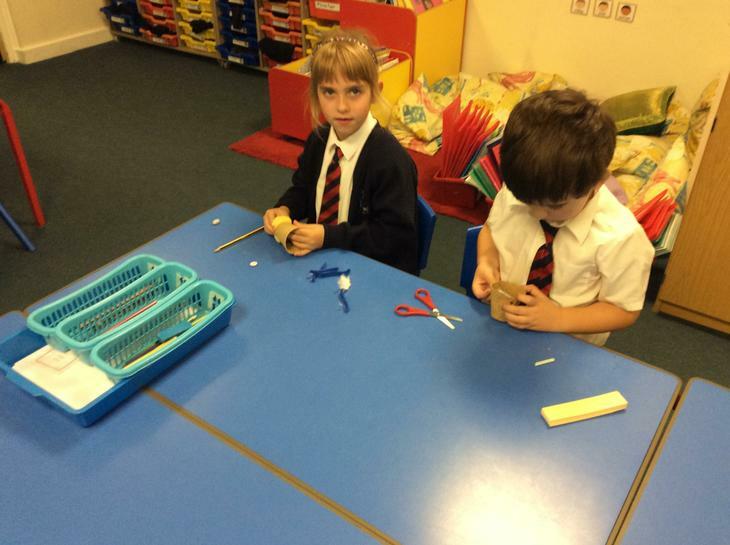 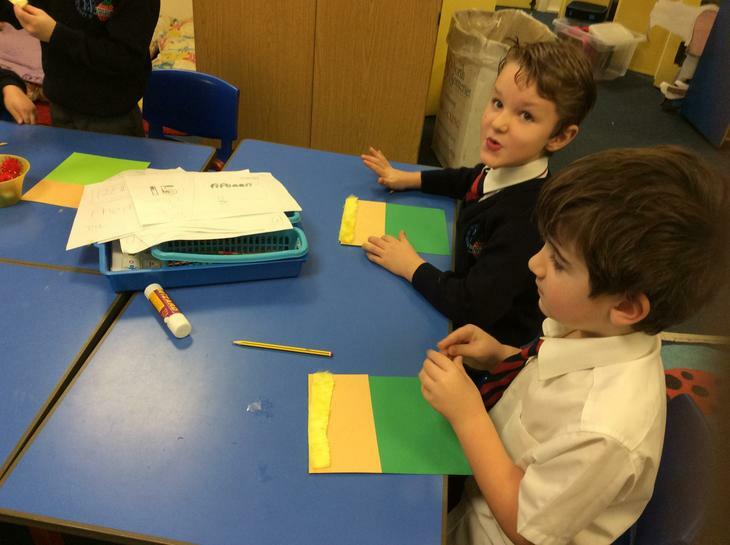 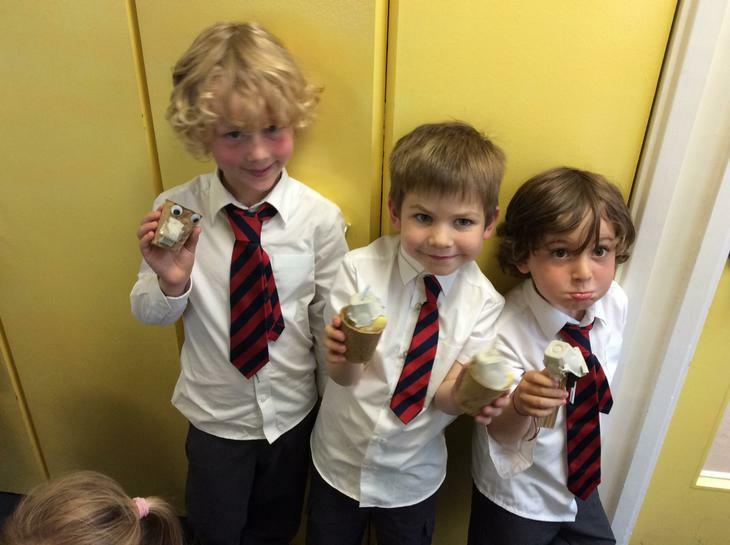 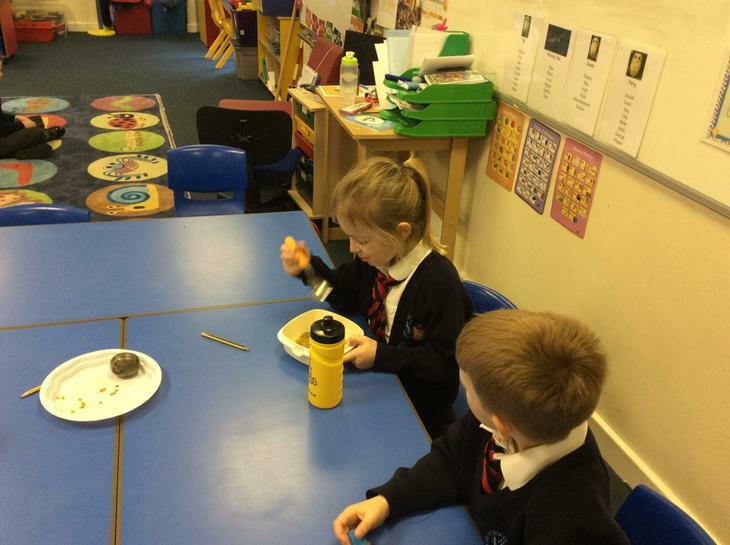 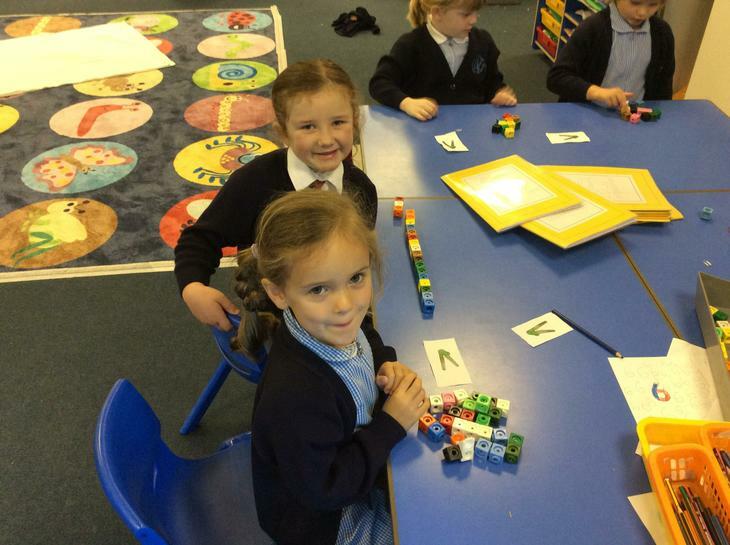 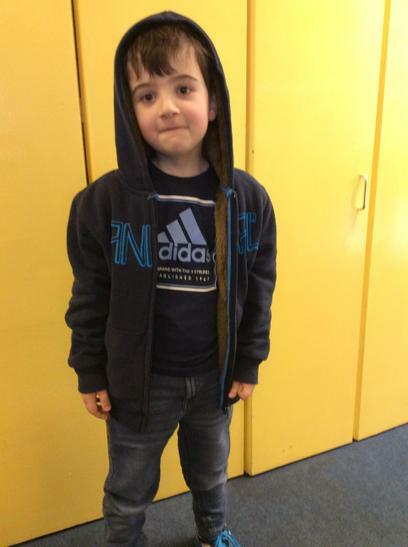 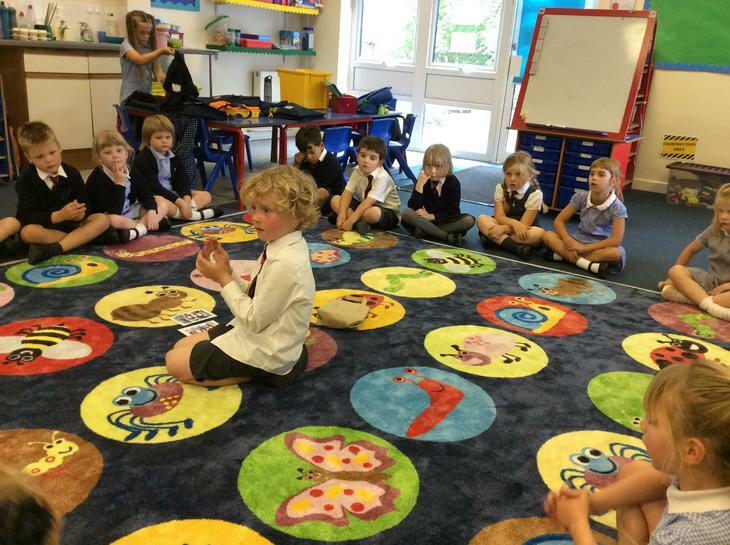 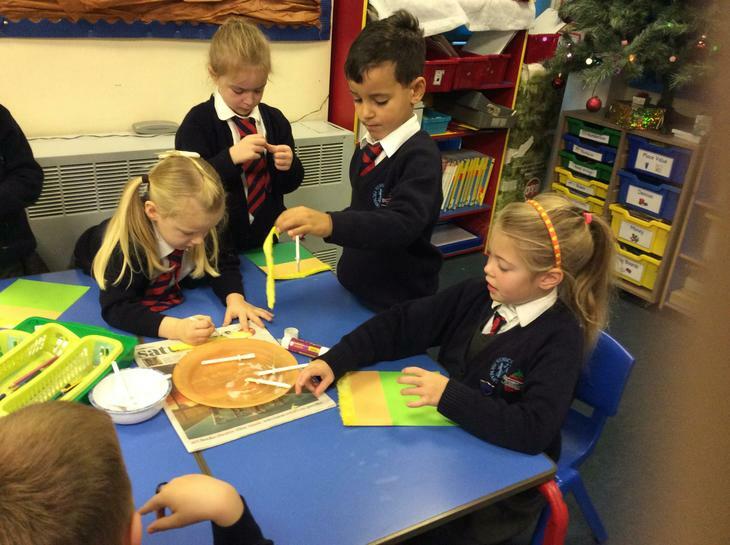 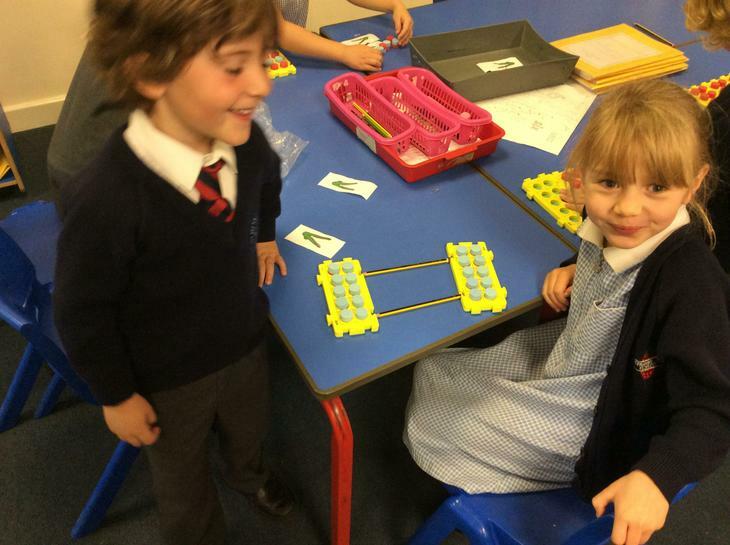 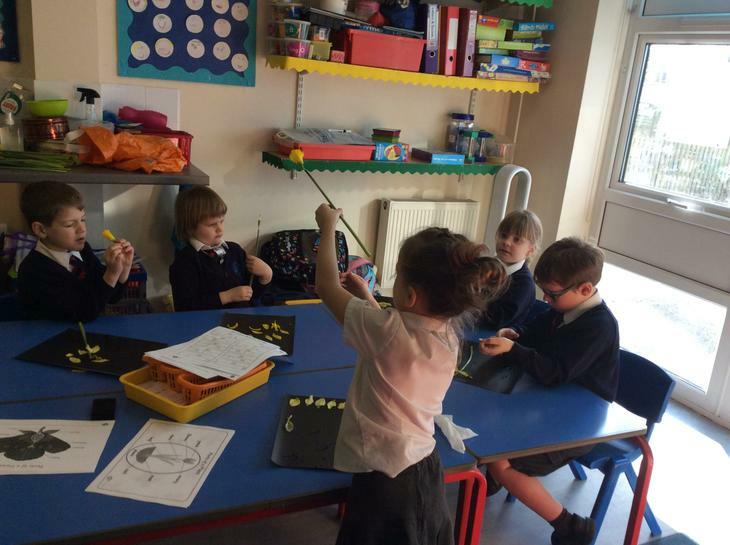 We are really enjoying our first week in Yellow Class. 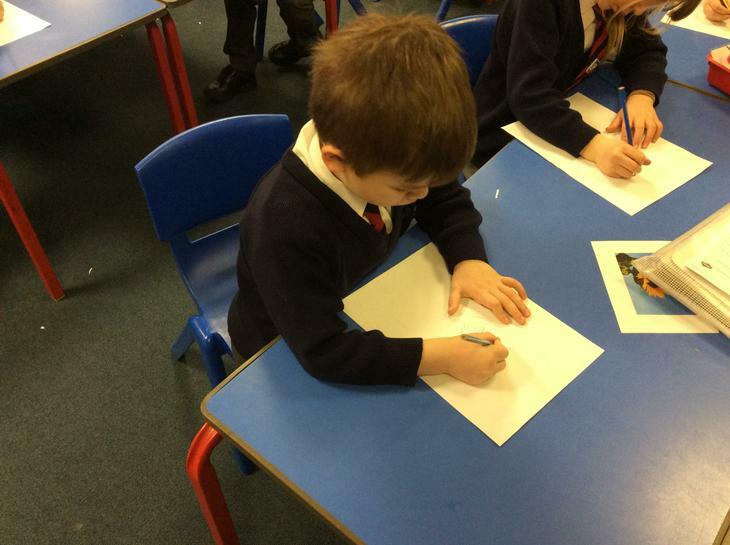 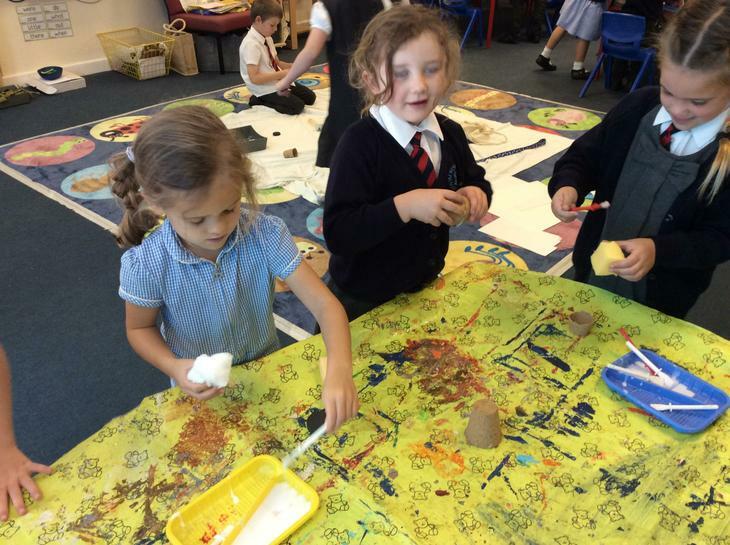 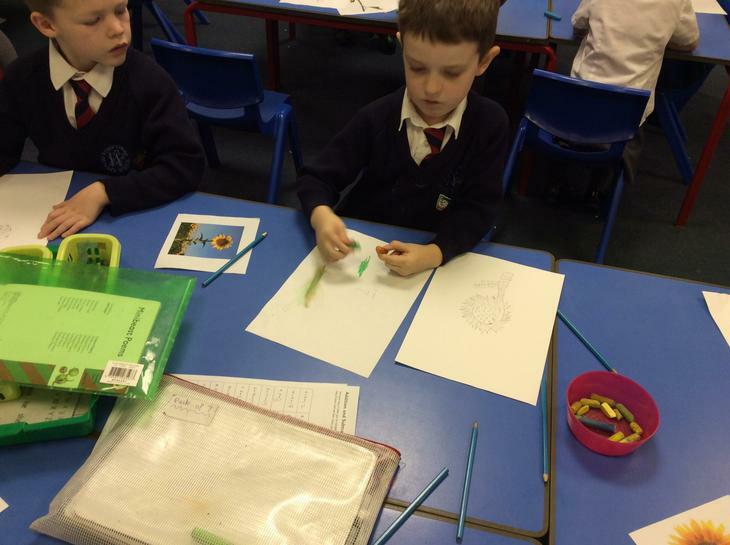 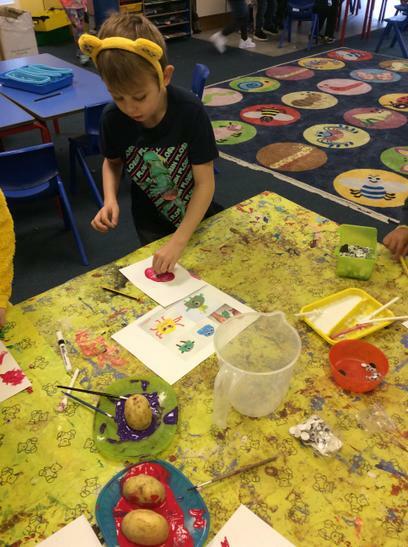 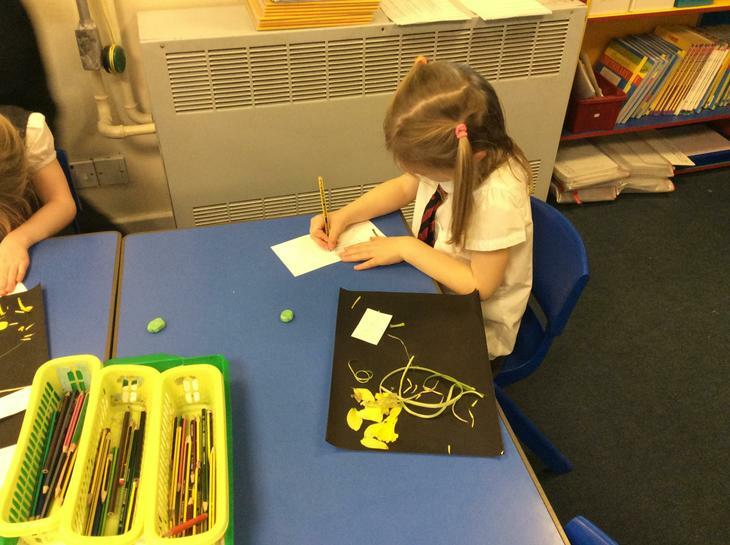 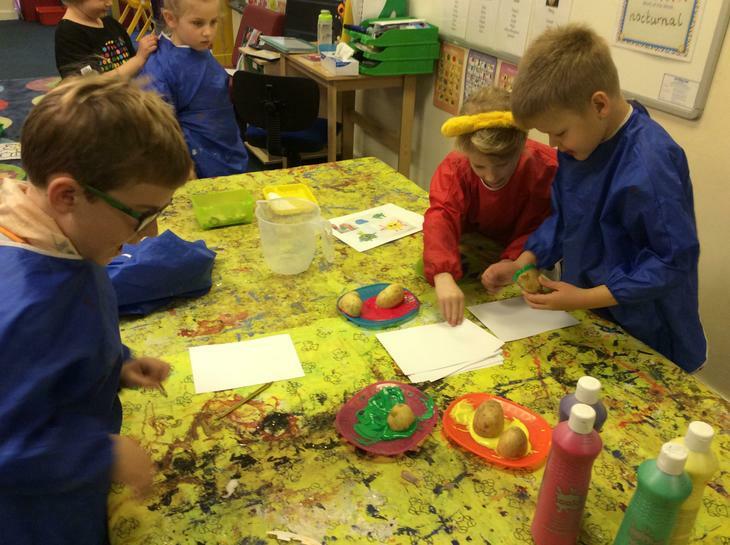 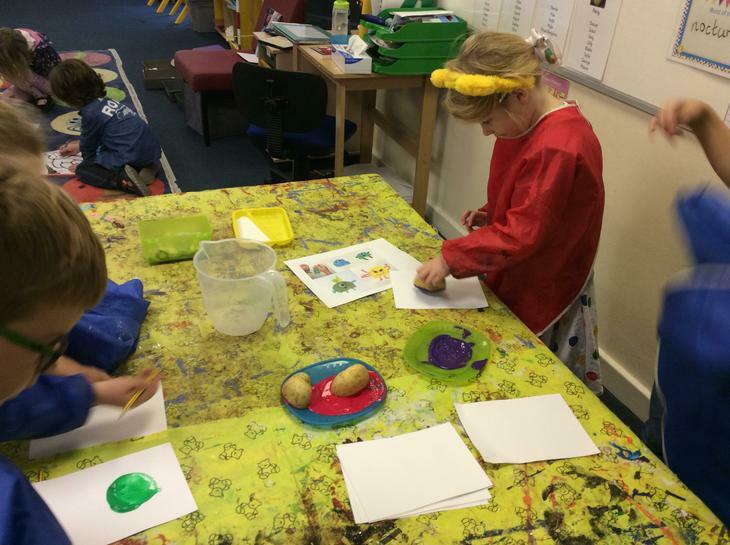 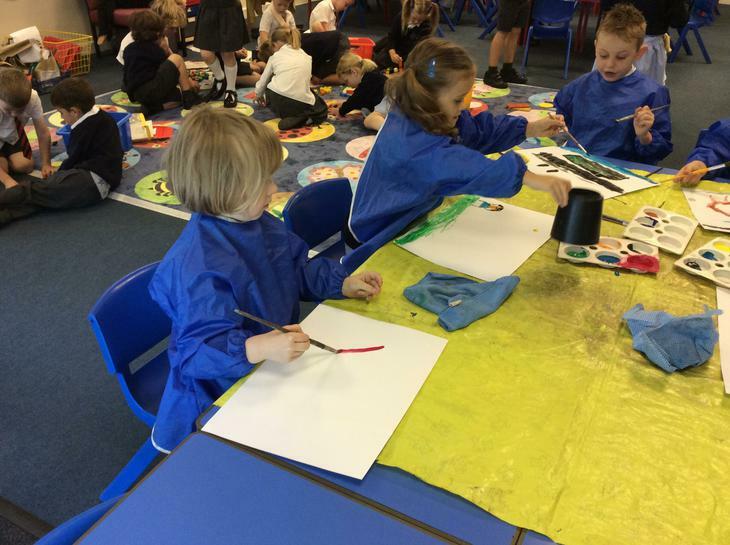 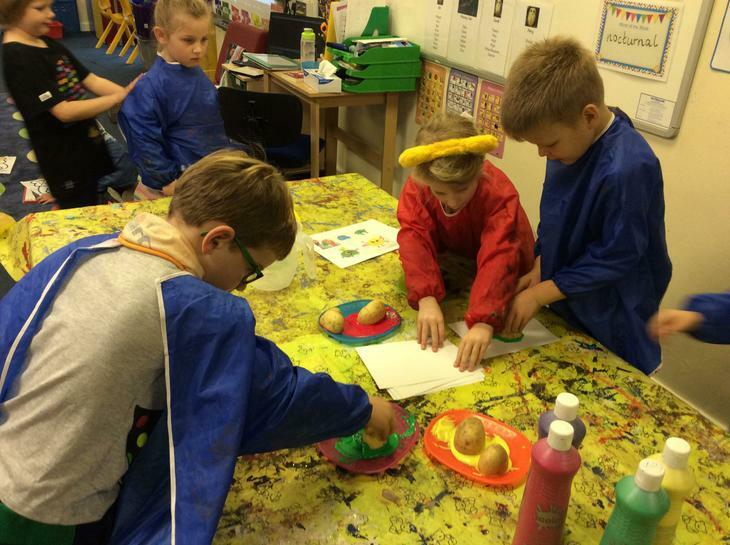 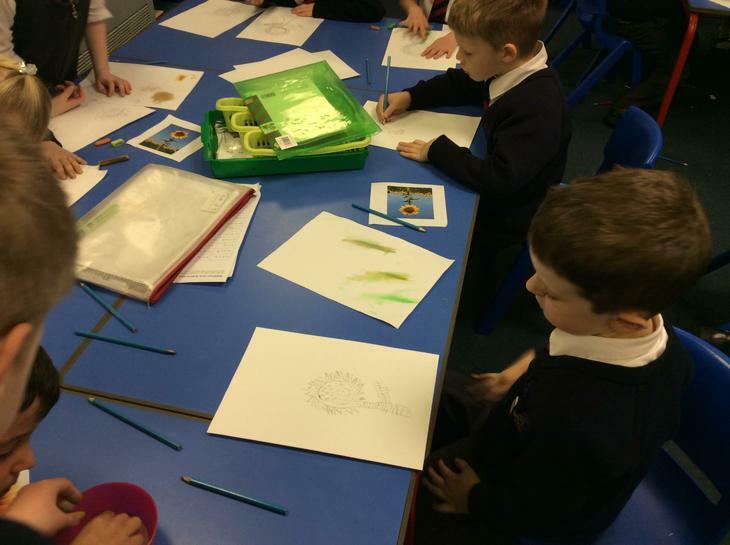 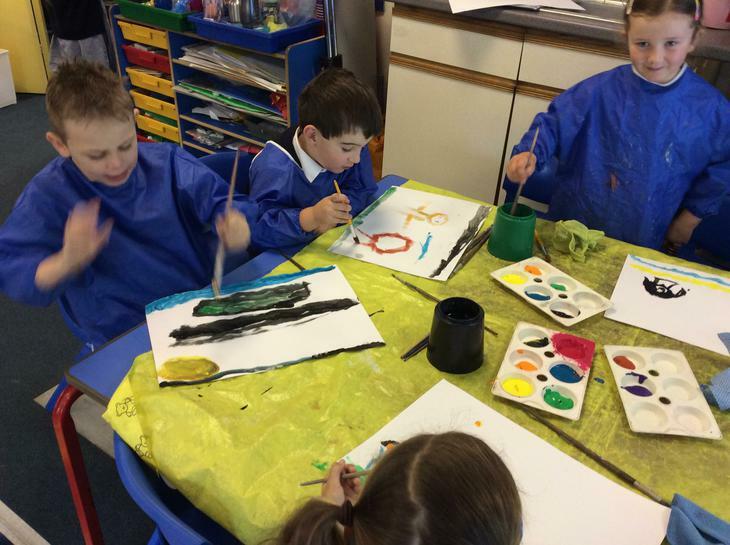 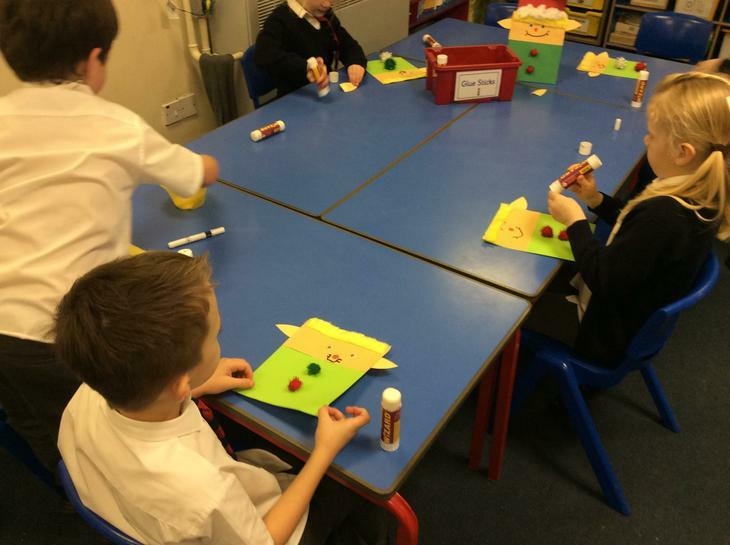 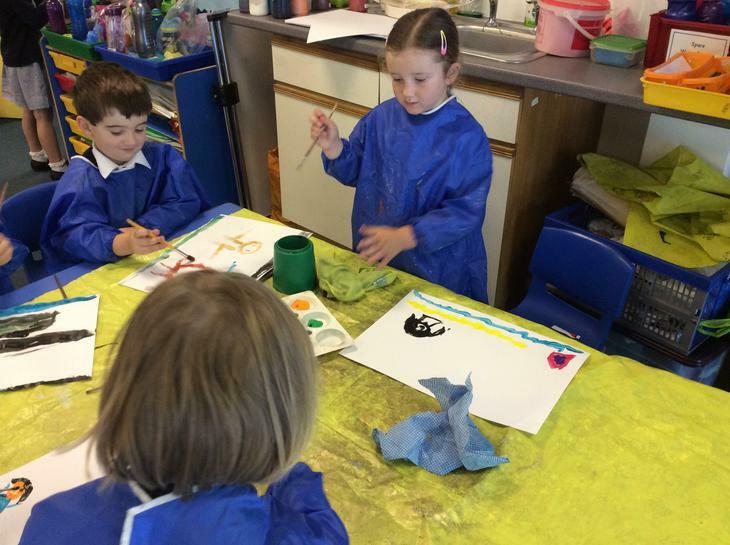 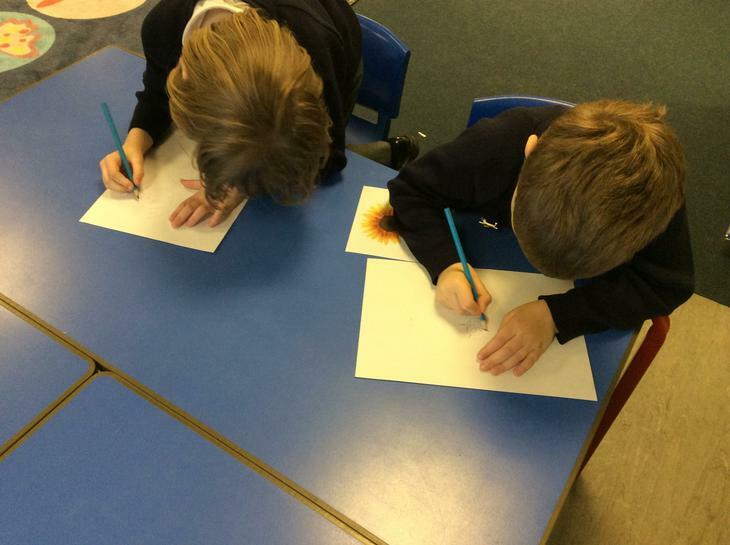 We have been writing about our holidays and painting pictures. 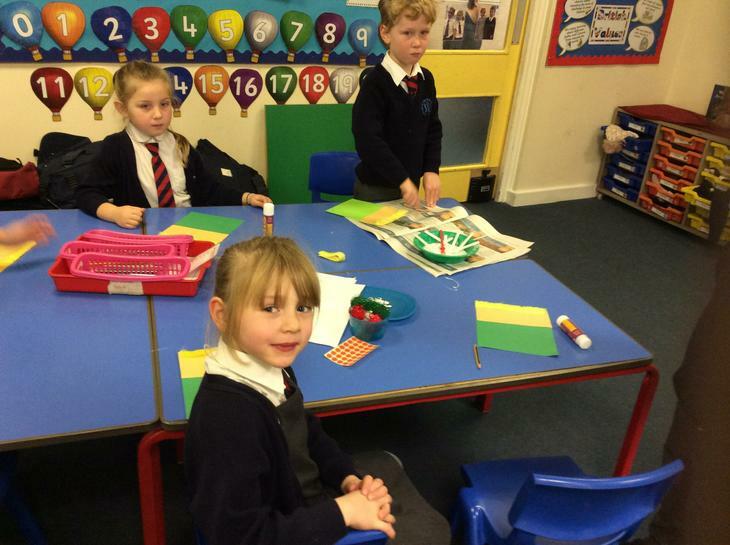 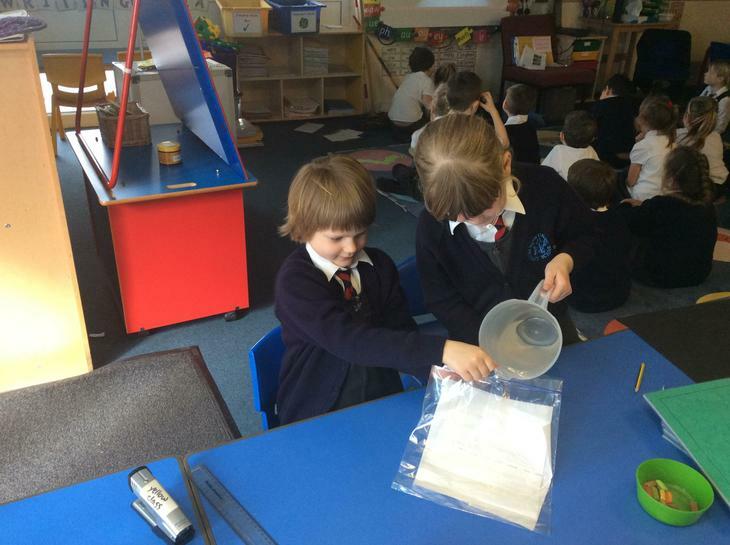 We have also enjoyed sharing our holiday bags. 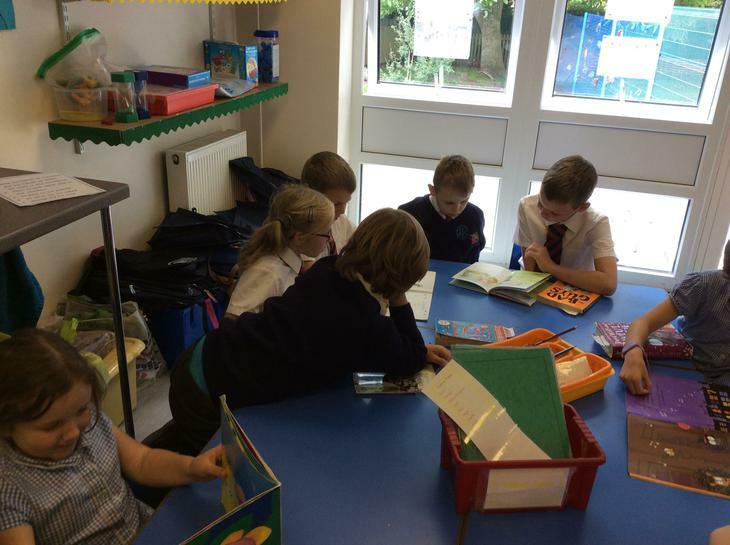 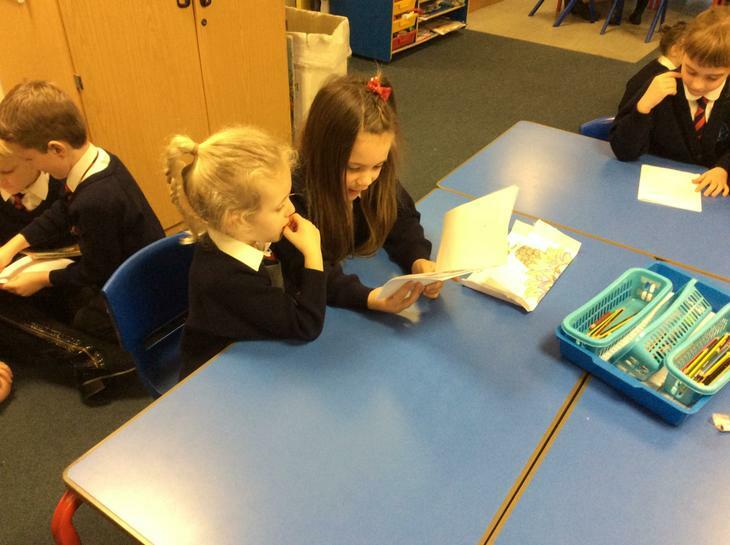 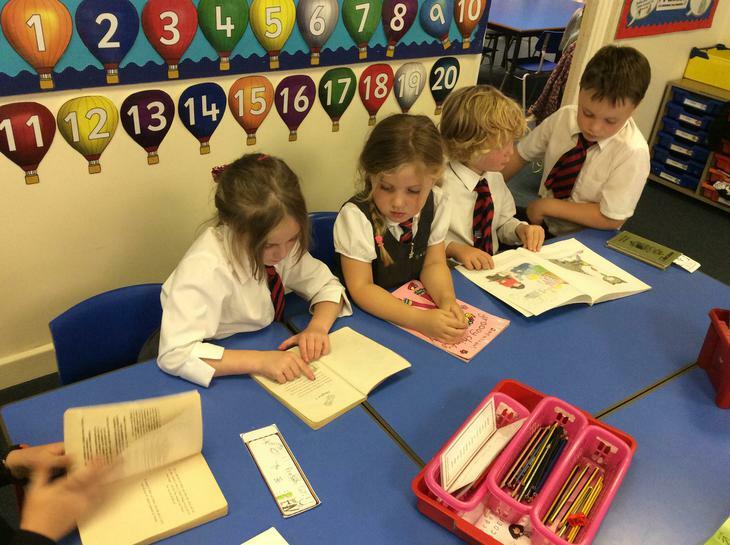 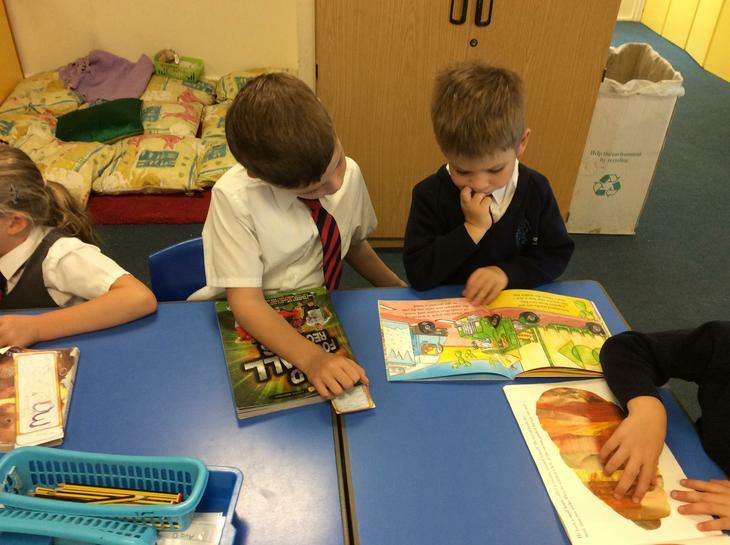 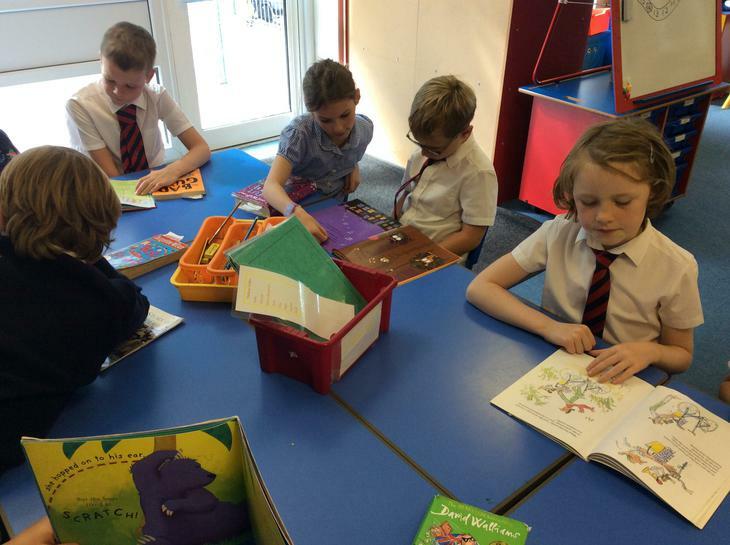 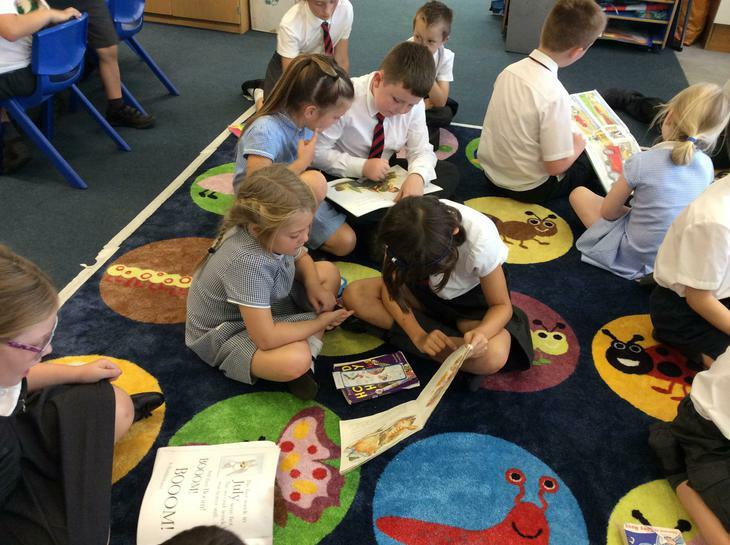 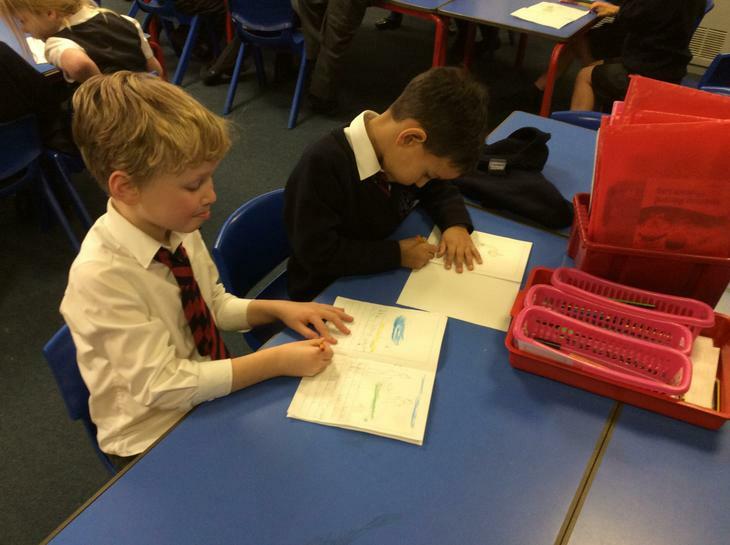 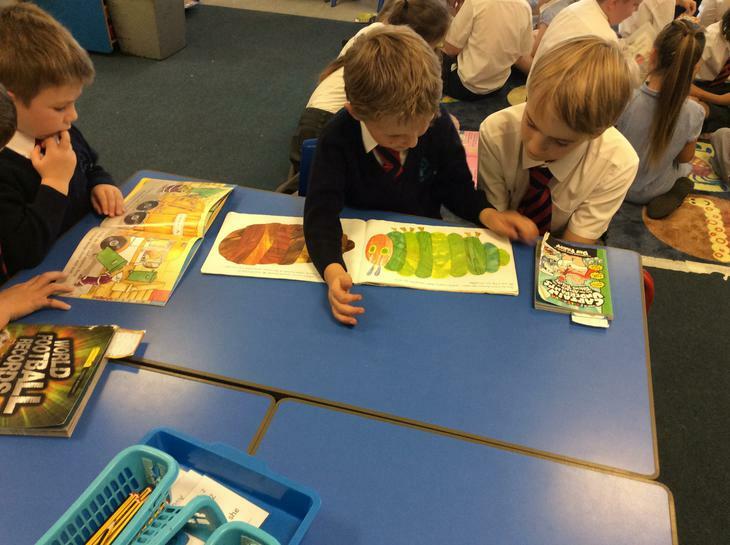 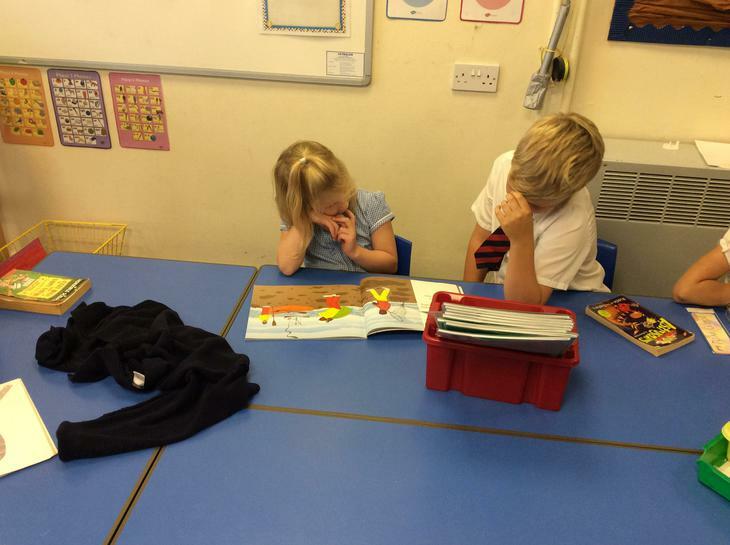 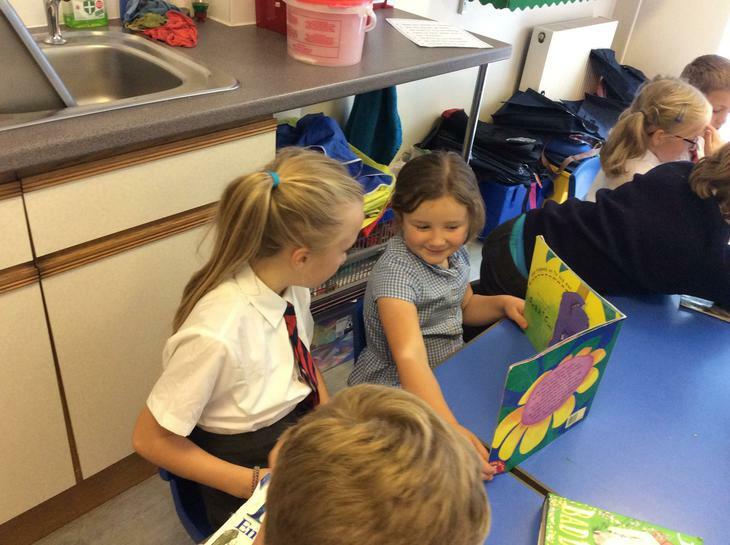 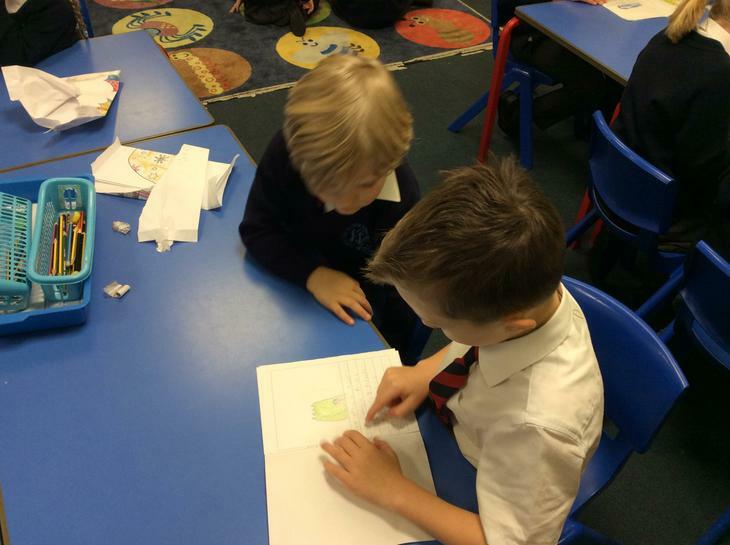 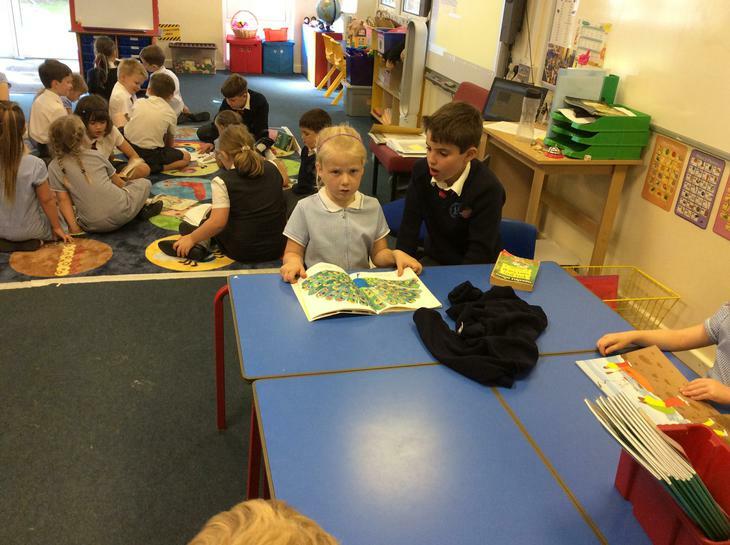 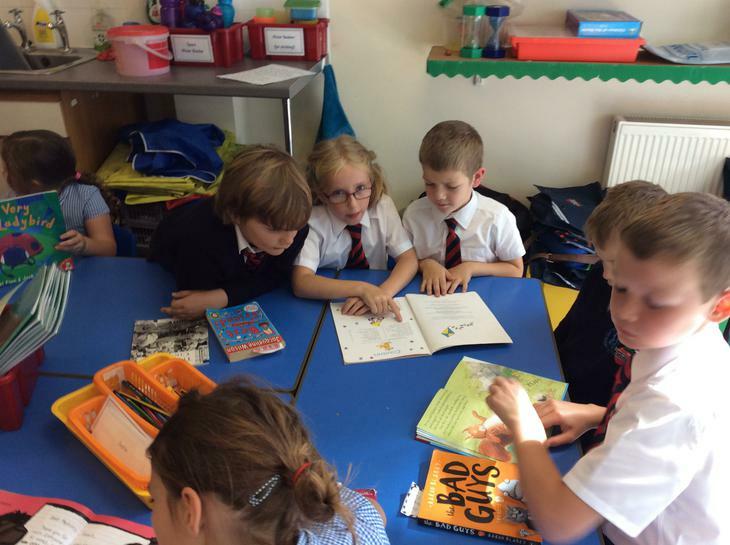 We were very excited to meet our Class 4 Reading Buddies.